I use my campervan so I can work around the UK and stay on location. 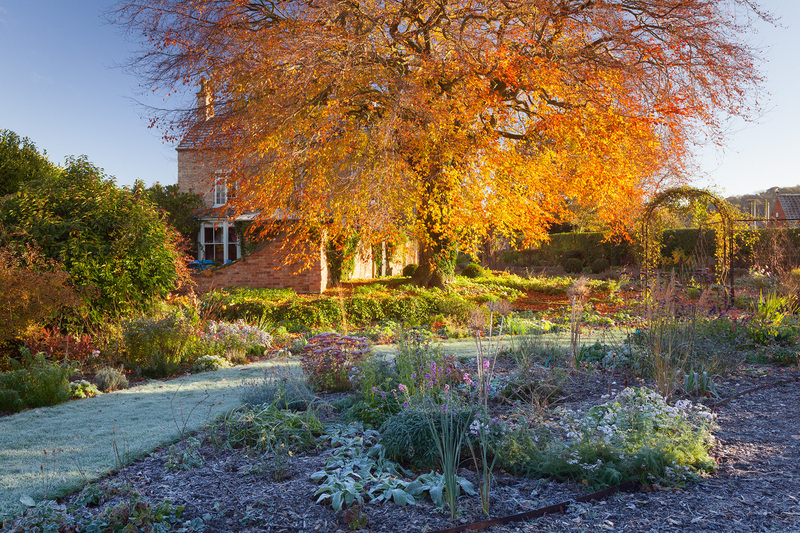 International Garden Photographer of the Year Competition 9 - 3rd in Beautiful Gardens. 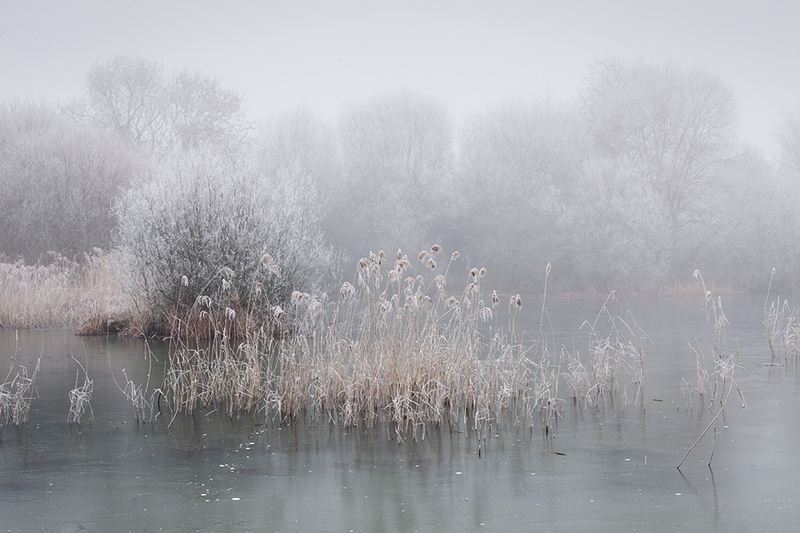 International Garden Photographer of the Year Competition 9 - 2nd in Capability Brown Today. 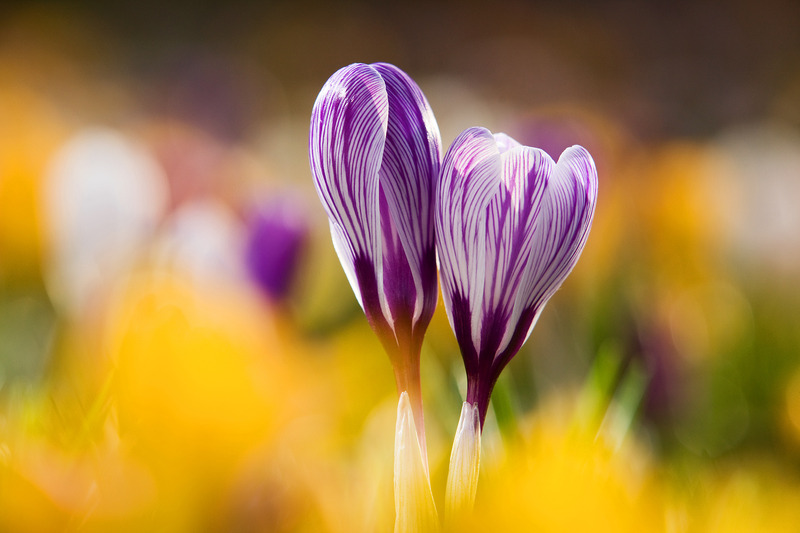 RHS Photographer of the Year 2013 - 2nd place in Seasons. A frozen pond and hoar frost on a bitterly cold winter day. January 2019. 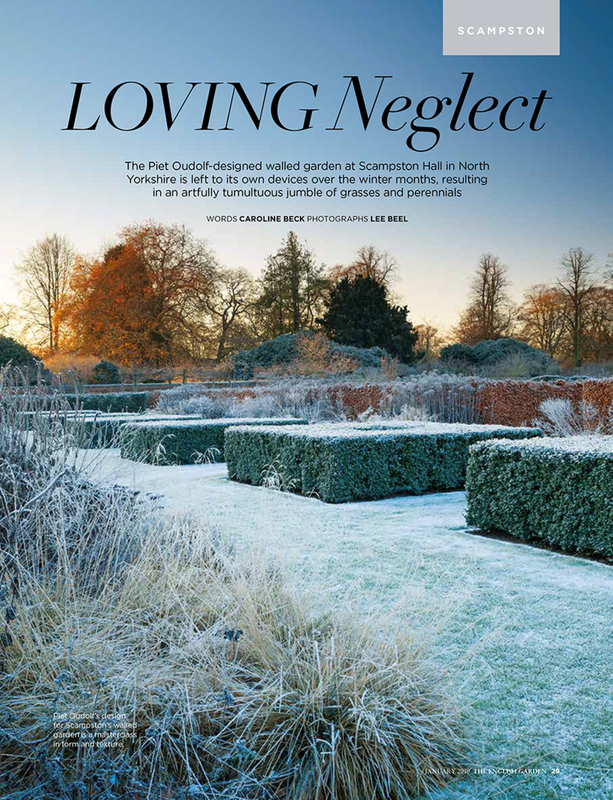 Feature on Winter at Scampston Walled Garden in January 2019 issue of The English Garden. 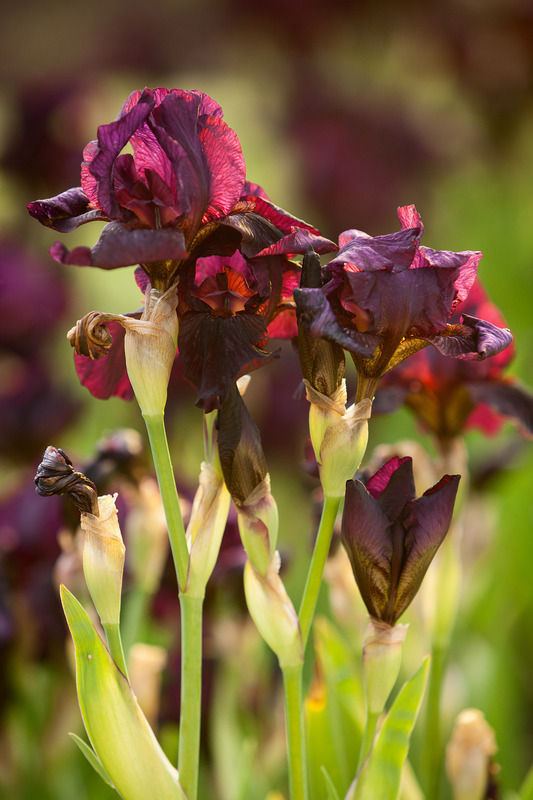 Location: Scampston Walled Garden, North Yorkshire, UK. 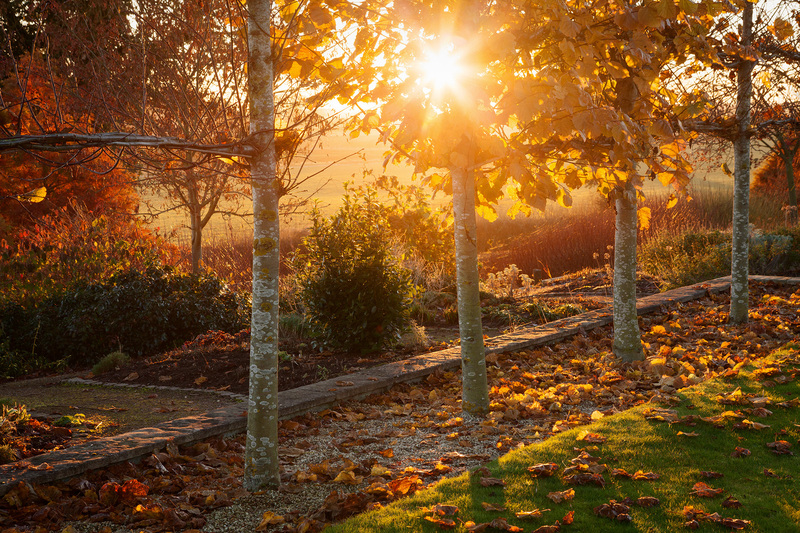 An Autumn afternoon at Hall Farm Garden. October 2018. 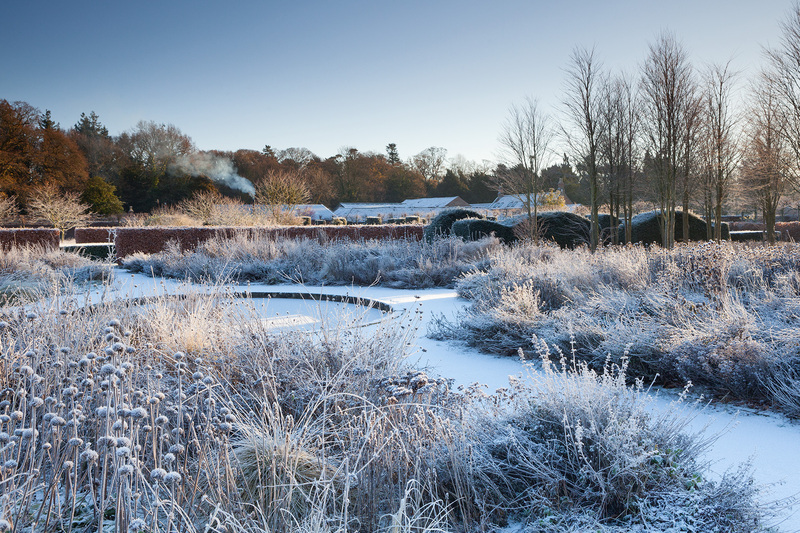 The Inspiration feature in the latest issue of the RHS 'The Garden' magazine, is this shot I took of RHS Garden Hyde Hall in Winter. 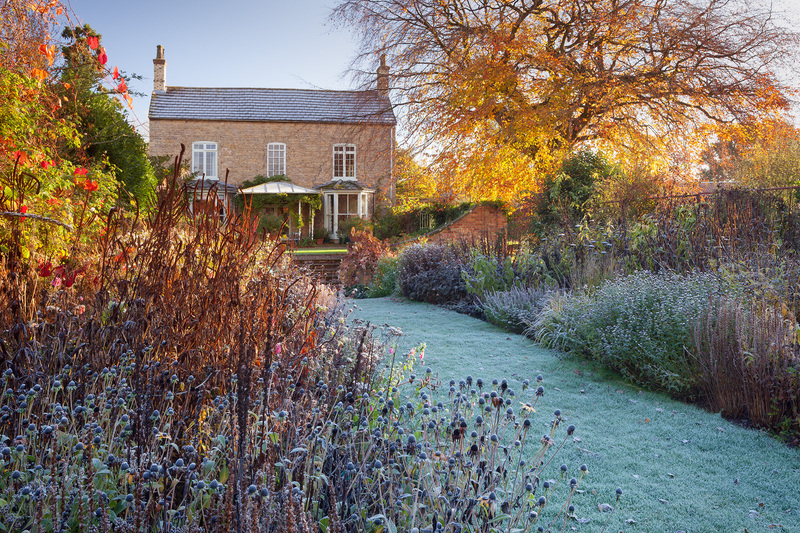 A frosty Autumn morning at Hall Farm. 31st October 2018. 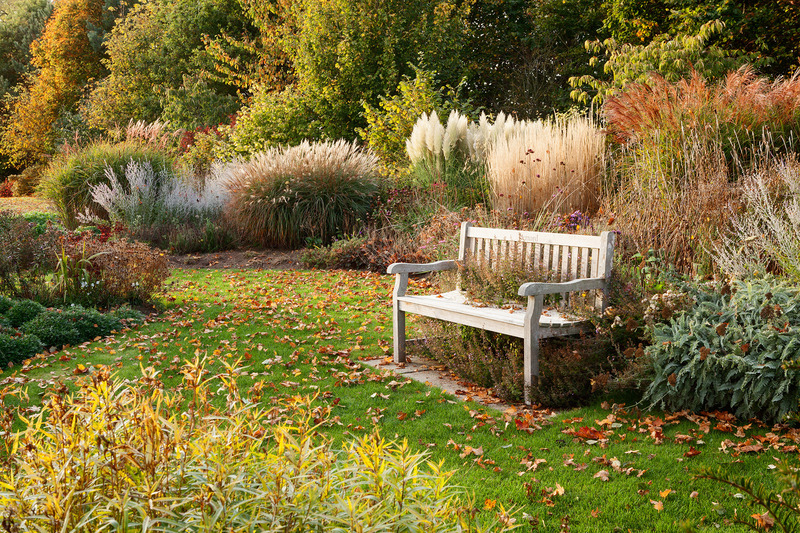 An Autumn afternoon in the Prairie Garden. October 2018. 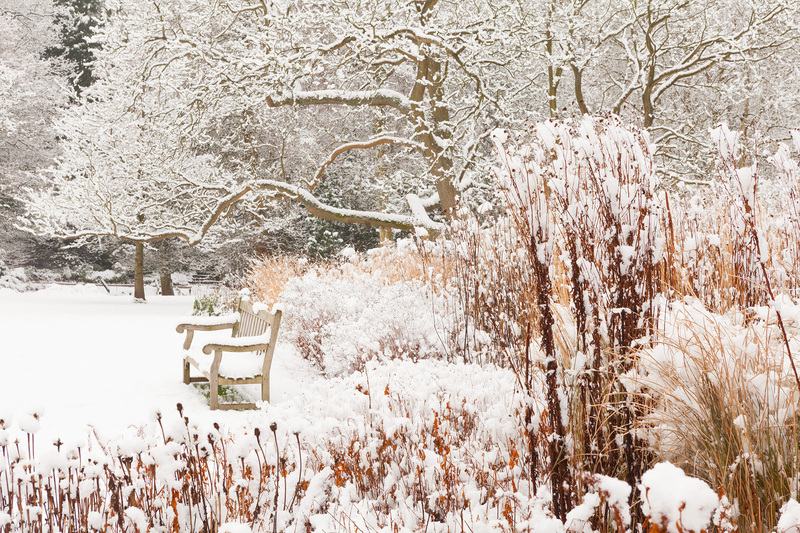 Location: Brightwater Gardens, Lincolnshire, UK. 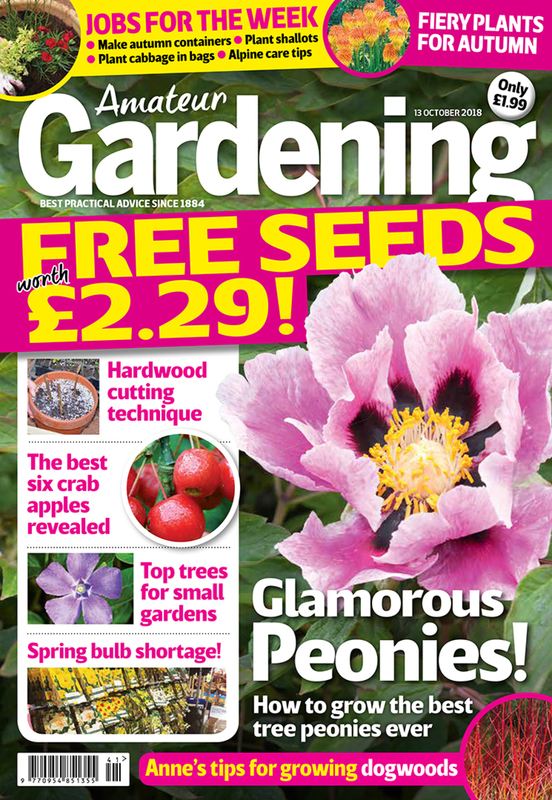 Tree Peony photograph on the cover of Amateur Gardening magazine. October 2018. 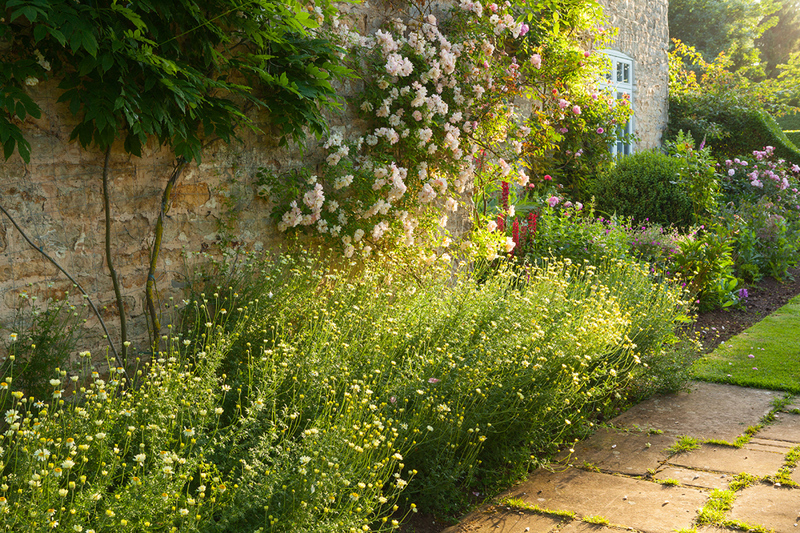 Location: Ellerker Manor, East Yorkshire, UK. 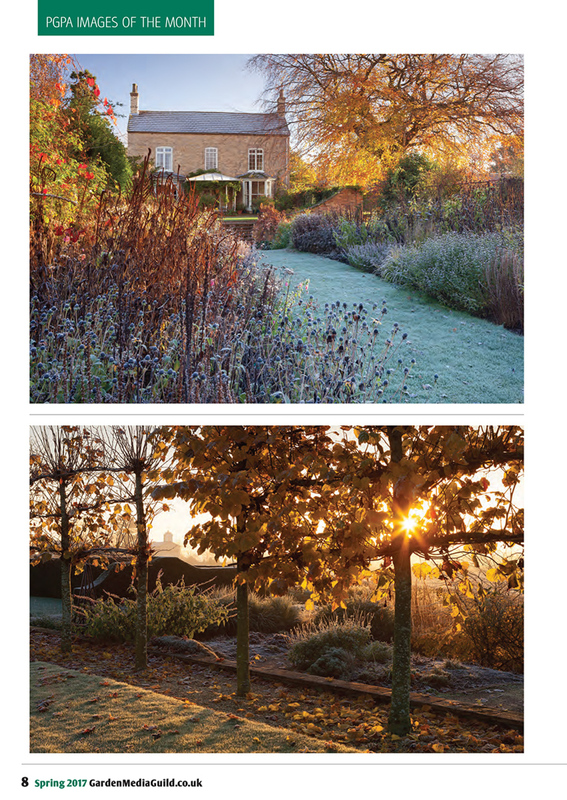 My Hall Farm Garden feature photographs in The English Garden magazine, November 2018. 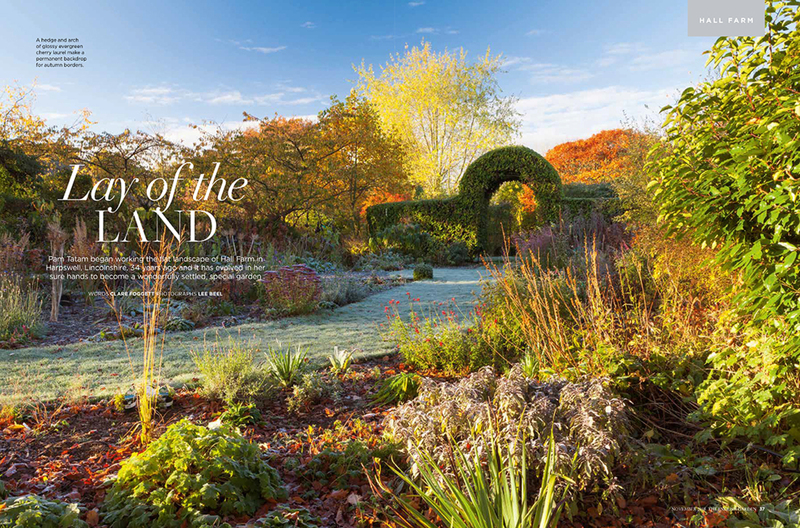 The Inspiration feature in the latest issue of the RHS 'The Garden' magazine, is this shot I took of the Main Borders at RHS Garden Harlow Carr in Autumn. 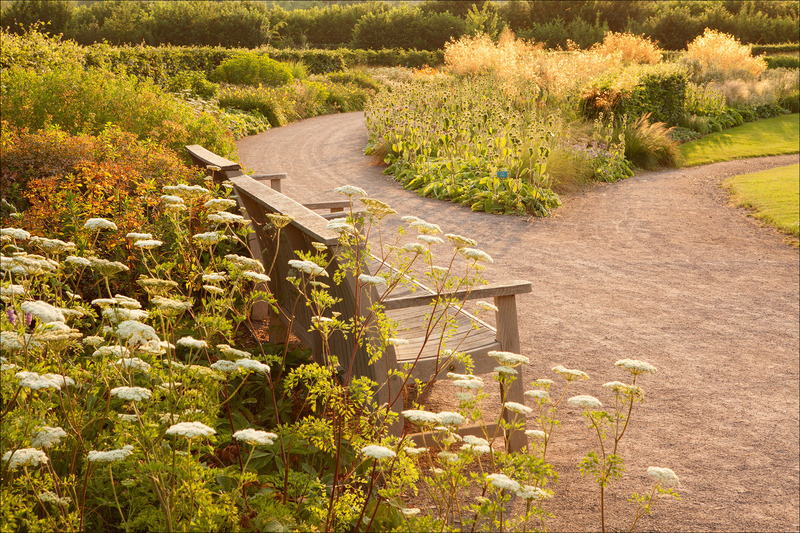 Location: RHS Garden Harlow Carr, Yorkshire, UK. 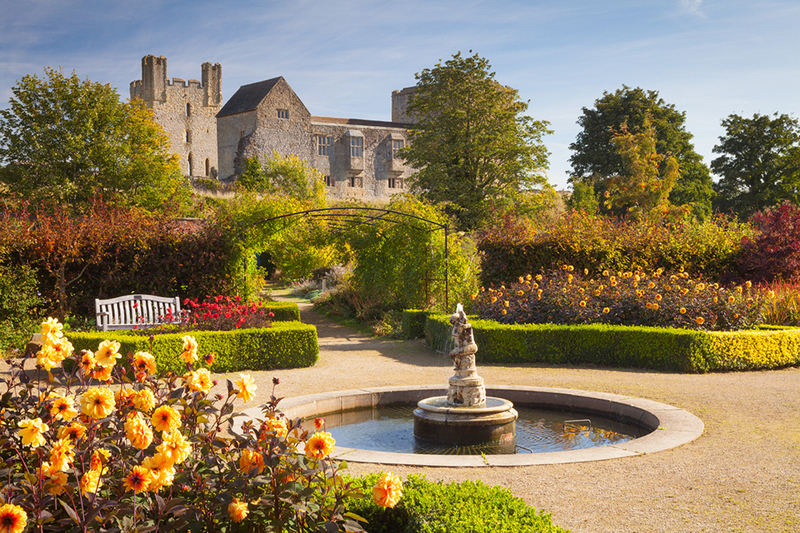 The old dipping pond and castle on an Autumn morning at Helmsley Walled Garden. September 2018. 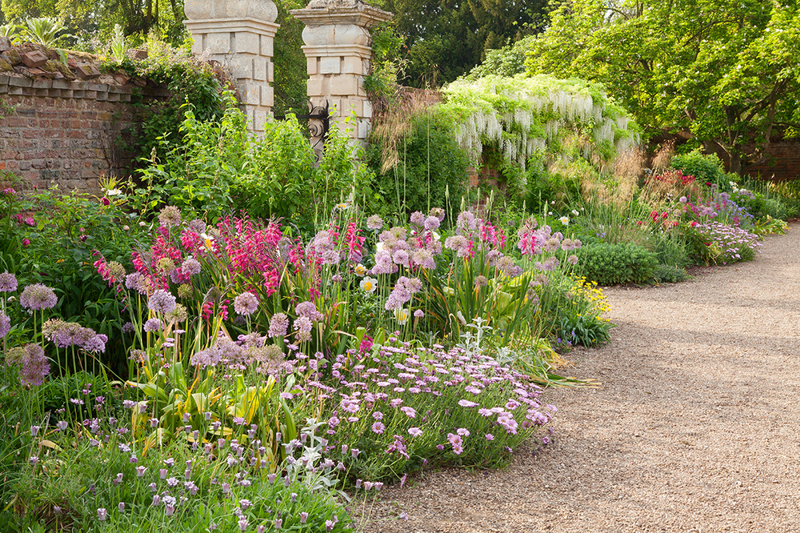 Location: Helmsley Walled Garden, North Yorkshire, UK. 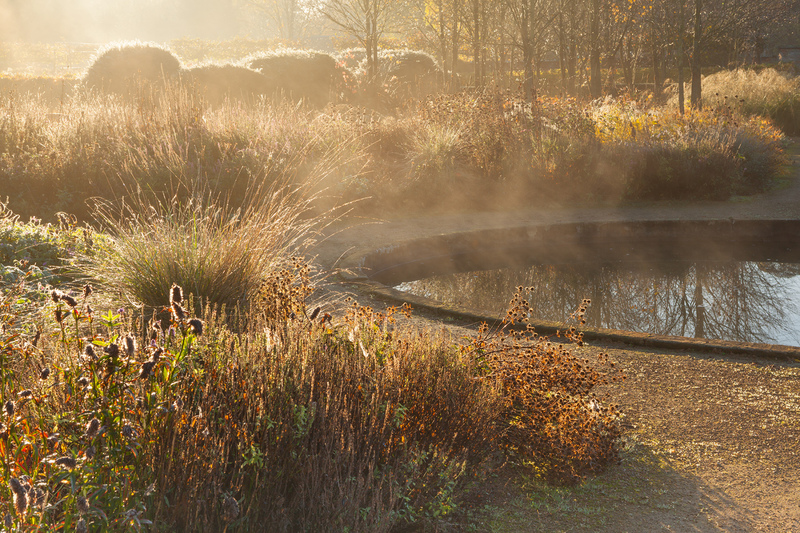 Mist rising from the old dipping pond at Helmsley Walled Garden, on an Autumn morning. September 2018. 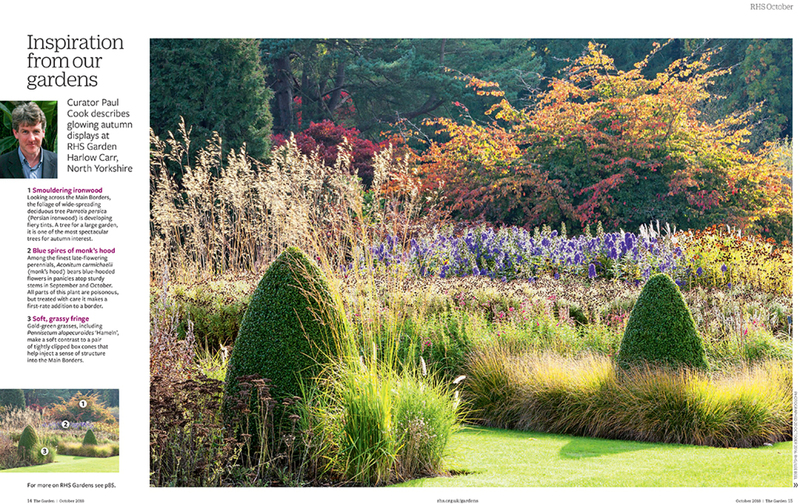 Brightwater Gardens feature in The English Garden Magazine, October 2018 issue. 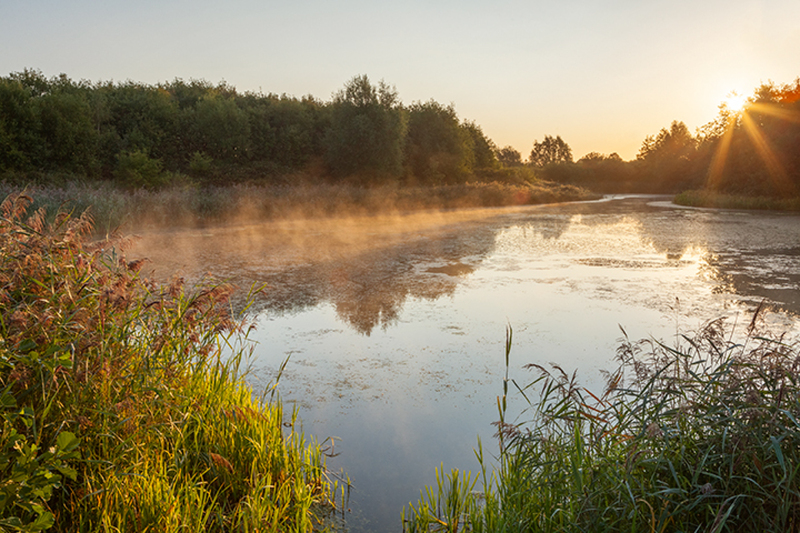 The Water's Edge Country Park at sunrise on the last day of Summer 2018. Location: Barton-upon-Humber, North Lincolnshire, UK. 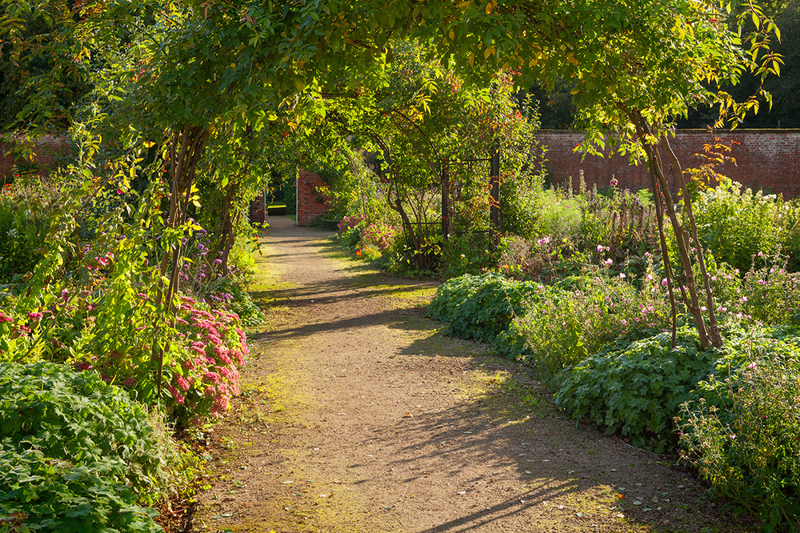 Early morning in The Secret Garden of Louth in late Summer. 30th August 2018. 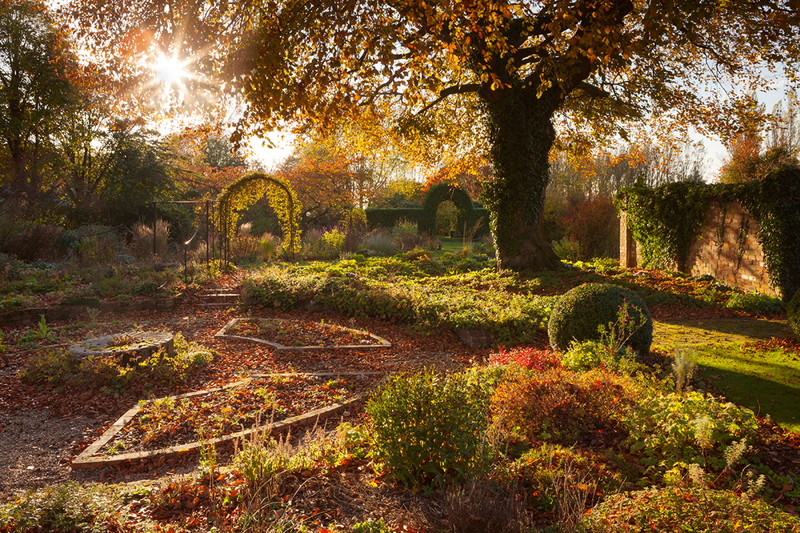 Location: The Secret Garden of Louth, Lincolnshire, UK. 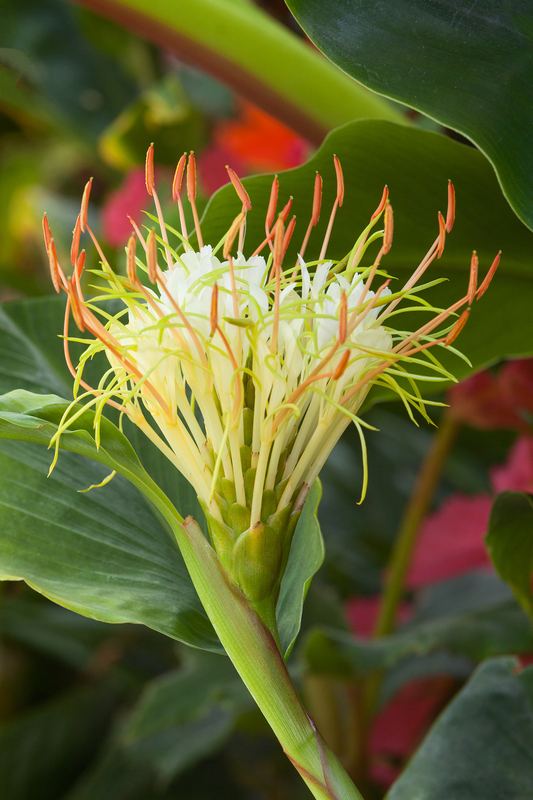 Hedychium ellipticum - shaving brush ginger, at the end of Summer. 30th August 2018. 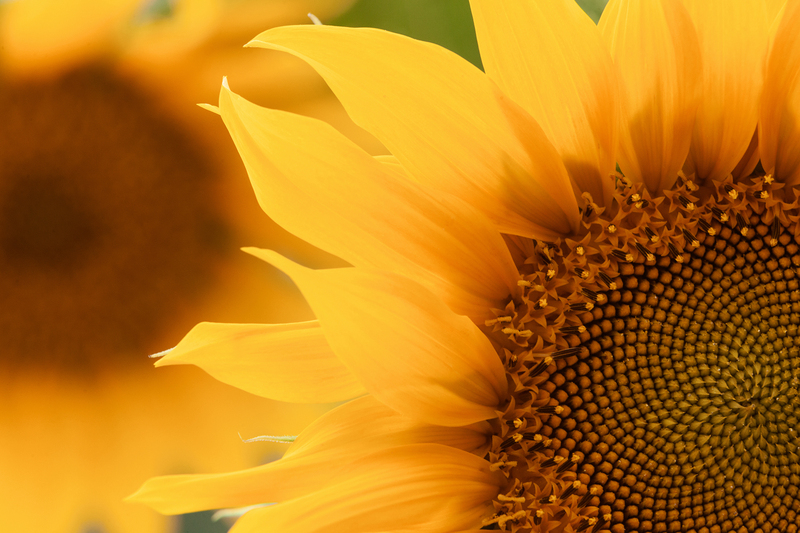 Helianthus, or sunflower, photographed in my back yard. 23rd August 2018. 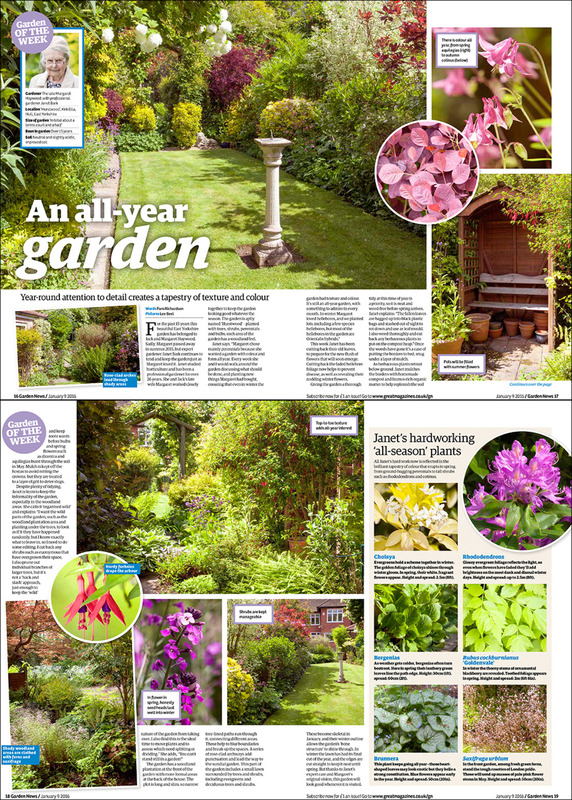 Feature on Brightwater Gardens used in the RHS 'The Garden' magazine. August 2018 issue. 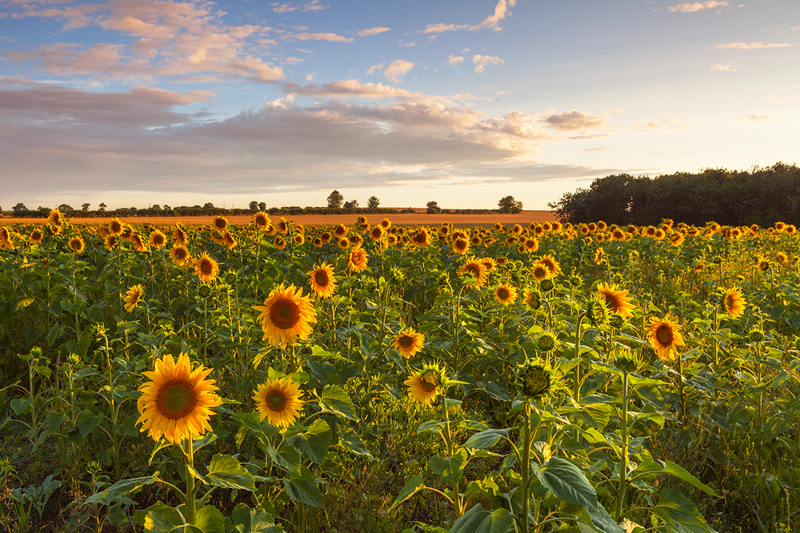 Sunflowers in evening light after a wet and windy day. July 2018. 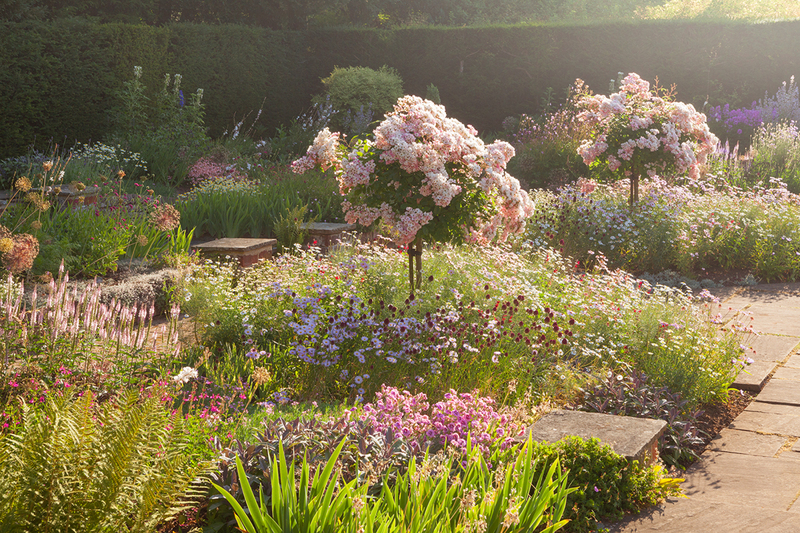 A beautiful summer evening in the Rose Garden at Newby Hall. July 2018. Location: Newby Hall, Ripon, North Yorkshire, UK. Early mist clearing on a hot July morning. Summer 2018. 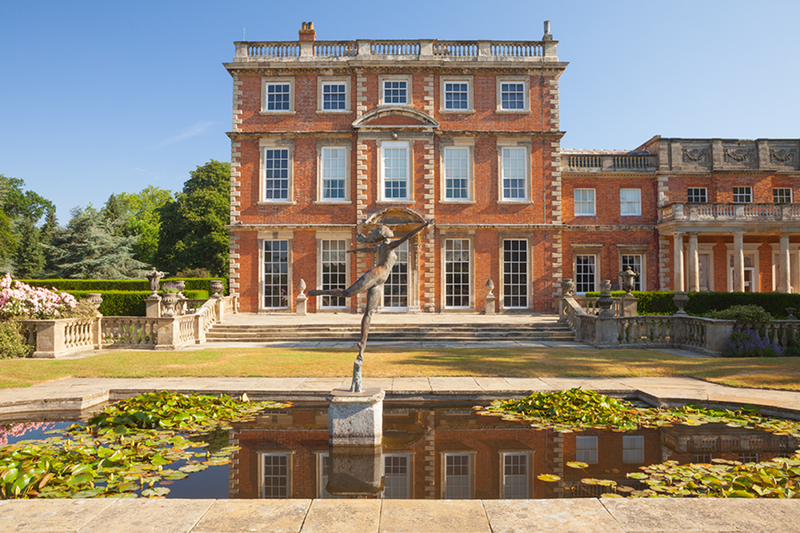 Summer morning light on the upper pond and hall. July 2018. 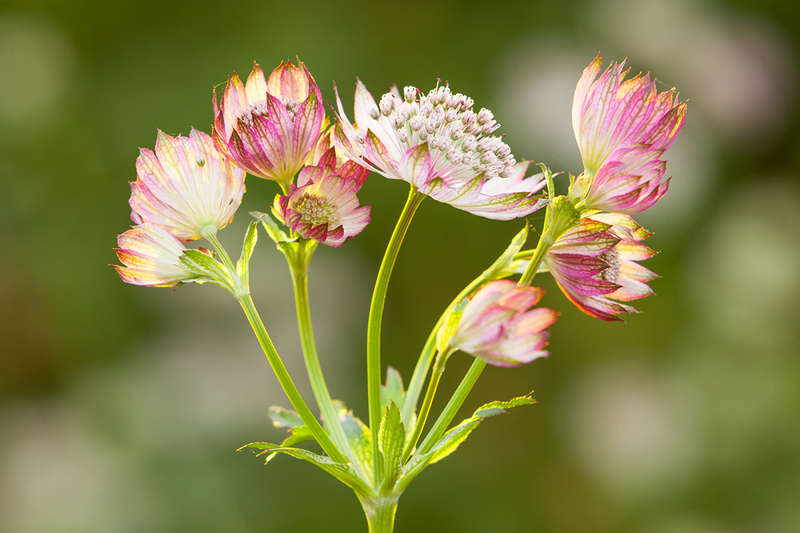 Great Masterwort (Astrantia major) at Hall Farm Garden on a bright and calm June afternoon in early Summer. 2018. Evening light in early summer at Hall Farm. June 2018. 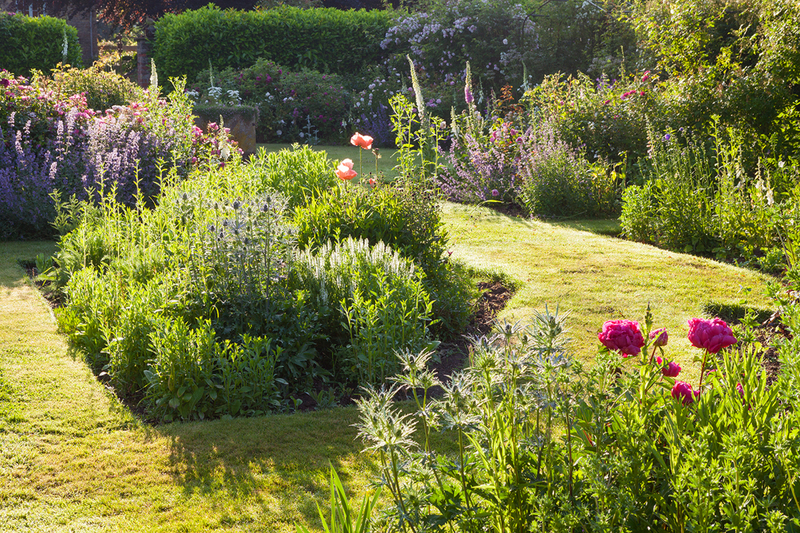 Morning light at Hall Farm Garden in early summer. June 2018. 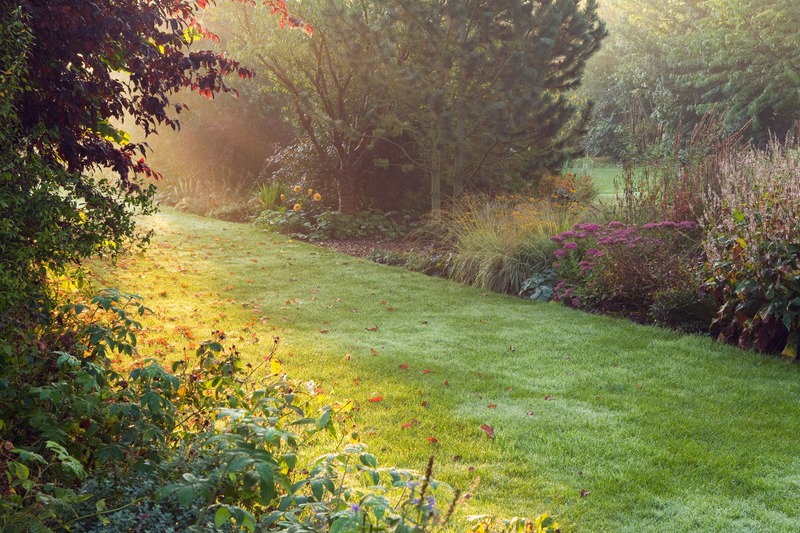 Early morning at Hall Farm Gardens. 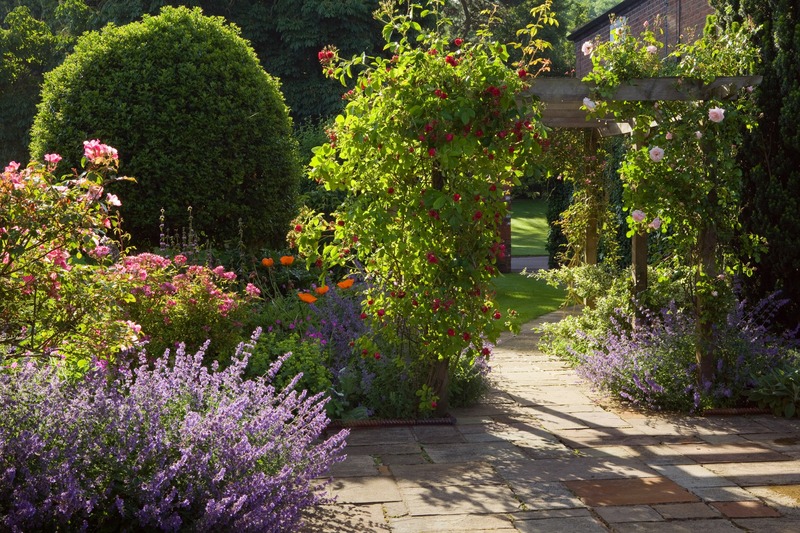 The garden opens for the NGS and also for the Lincolnshire Gardens scheme. 19th June 2018. 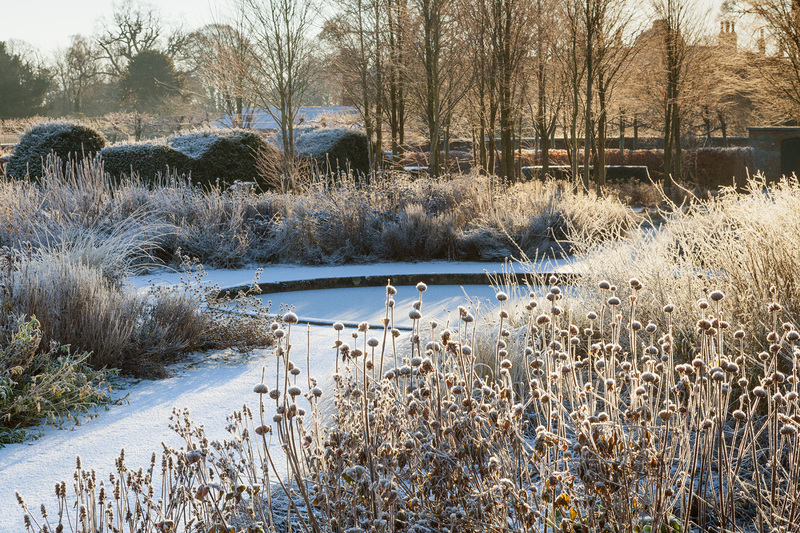 Early morning at Hall Farm Gardens the other day. 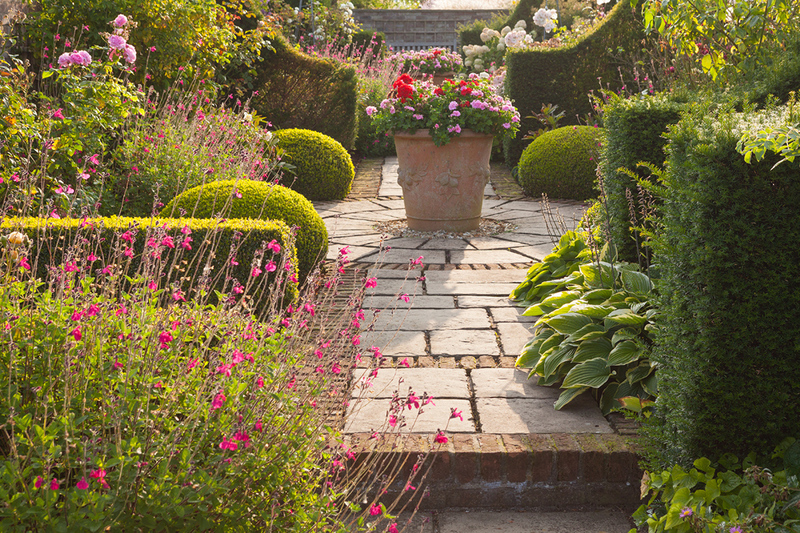 The garden opens for the NGS and also for the Lincolnshire Gardens scheme. 13th June 2018. 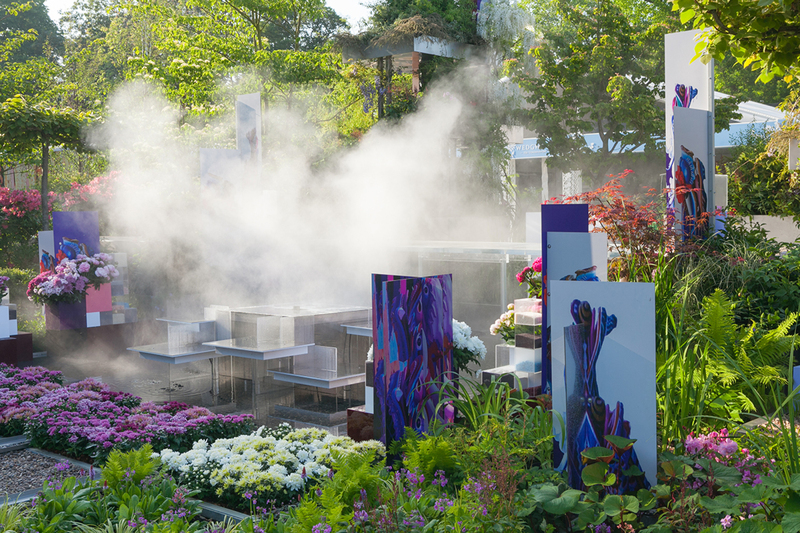 The M&G Garden at RHS Chelsea Flower Show 2018. 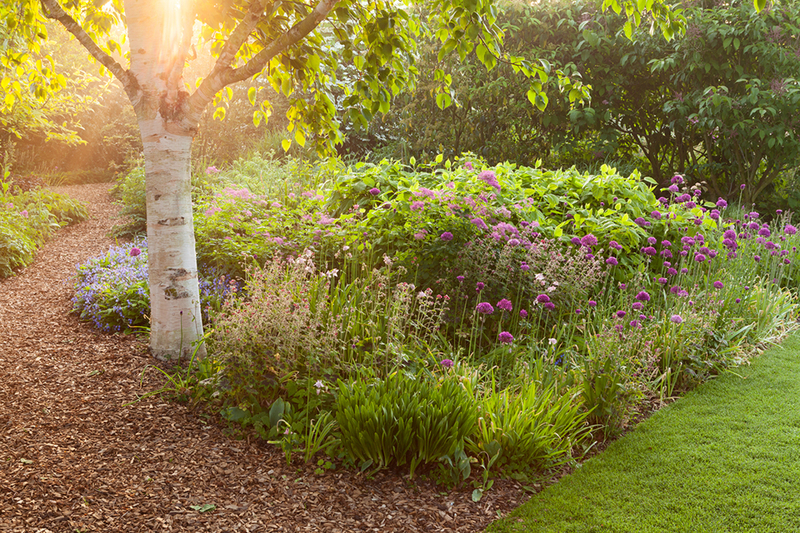 Location: RHS Chelsea Flower Show 2018. Early morning light on the 'Wuhan Water Garden'. Designed by Laurie Chetwood and Patrick Collins of Chetwoods Architects. Sponsored by #Creativersal and built by Tendercare Nurseries. 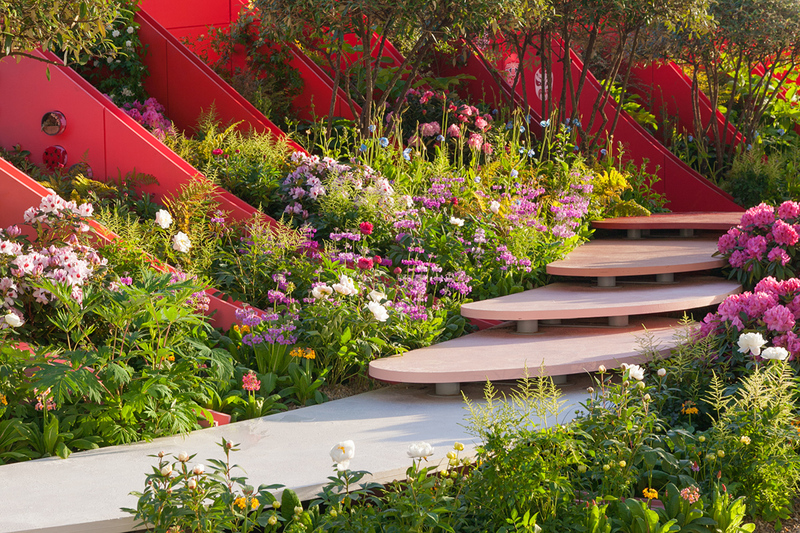 RHS Chelsea Flower Show 2018. 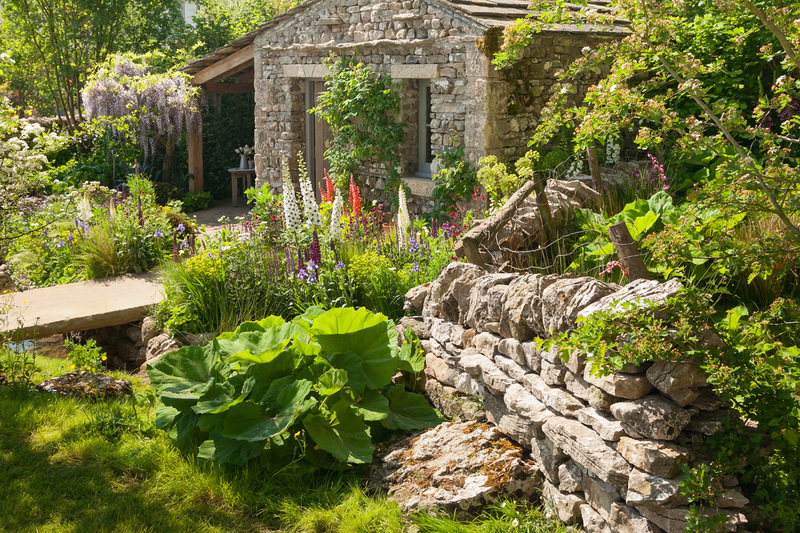 The 'Welcome to Yorkshire' show garden at RHS Chelsea Flower Show 2018. 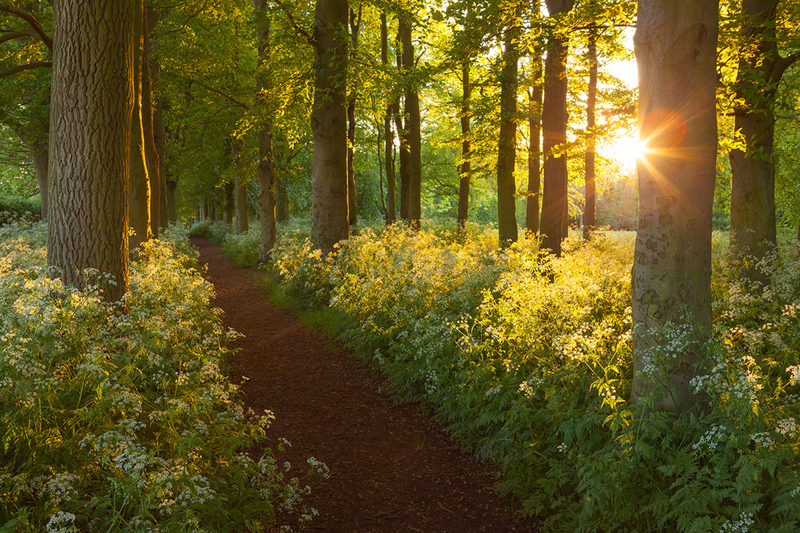 Late evening light on Cow Parsley and Beech Trees in Baysgarth Park in Spring. 14th May 2018. 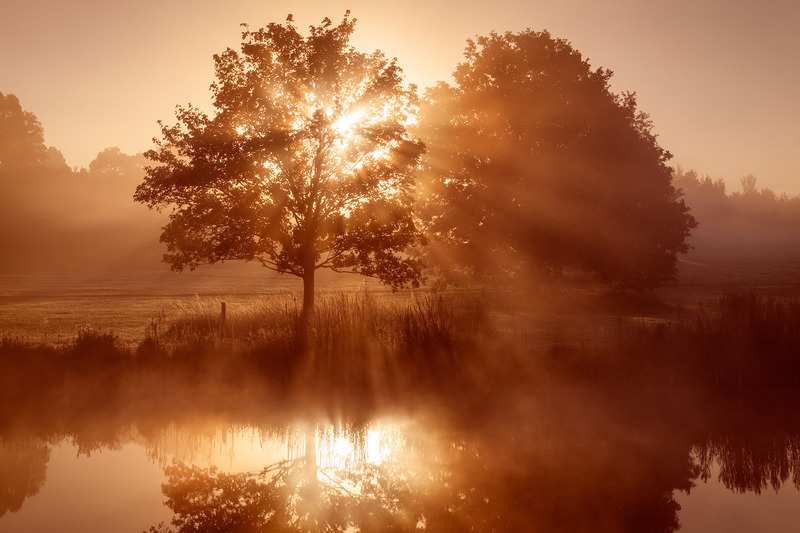 Location: Baysgarth Park, Barton-upon-Humber, North Lincolnshire, UK. 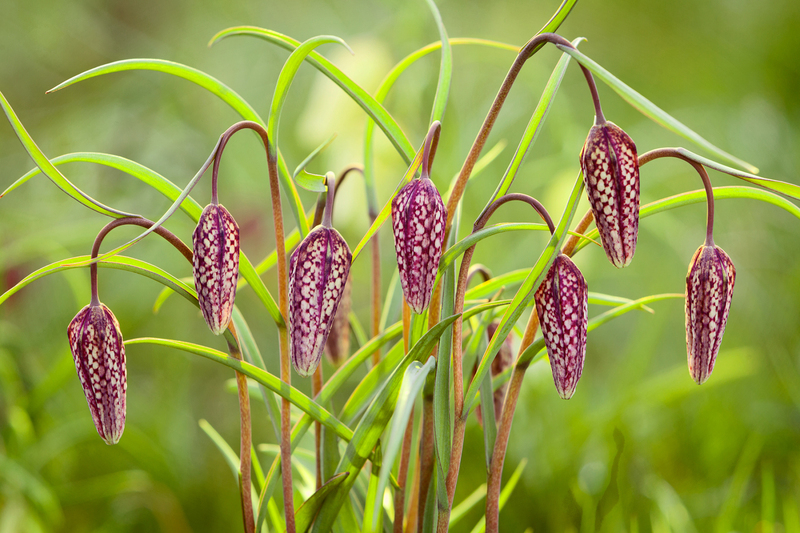 Snake's head fritillary (Fritillaria meleagris) at Brightwater Gardens, April 2018. 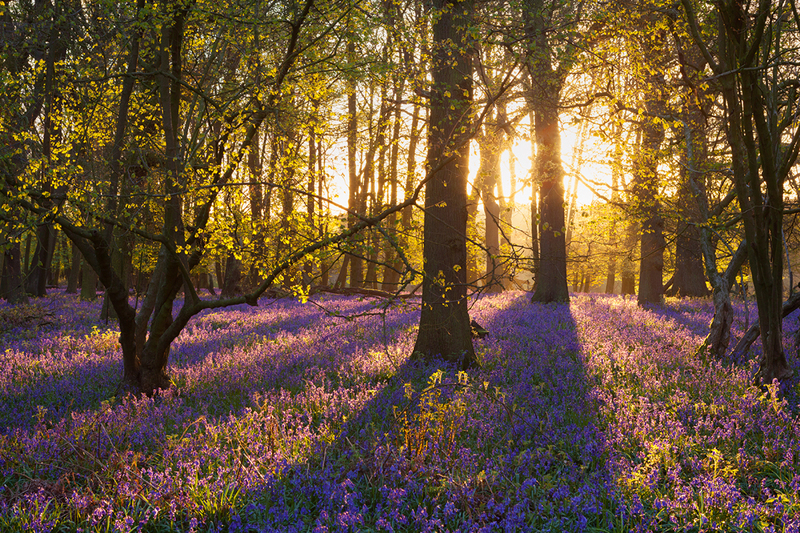 First light in the Bluebell Woodland. Spring, April 2018. Location: Felley Priory Gardens, Nottinghamshire, UK. 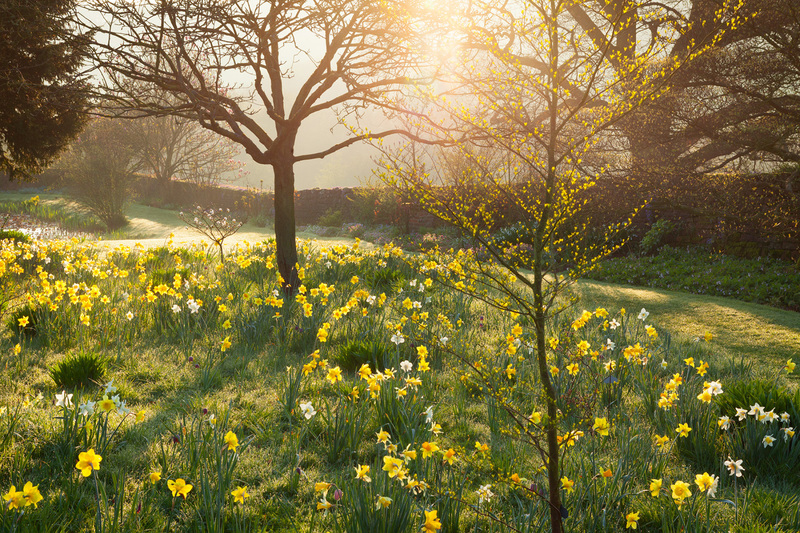 Early morning light on the daffodils near the pond. Spring, April 2018. 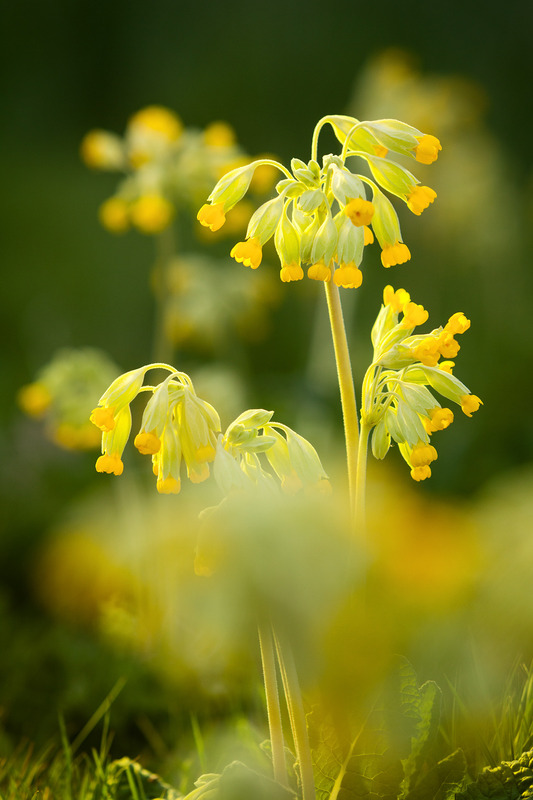 Cowslips at Brightwater Gardens, Lincolnshire. Spring, April 2018. 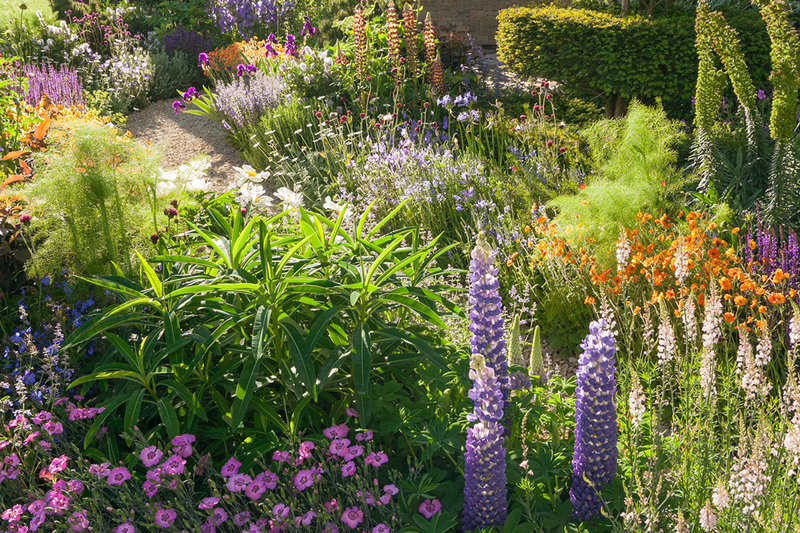 The garden is part of the Lincolnshire Gardens group and is an RHS Partner Garden. The Morgan Stanley Garden in the evening at Chelsea 2017. ©RHS/Lee Beel. 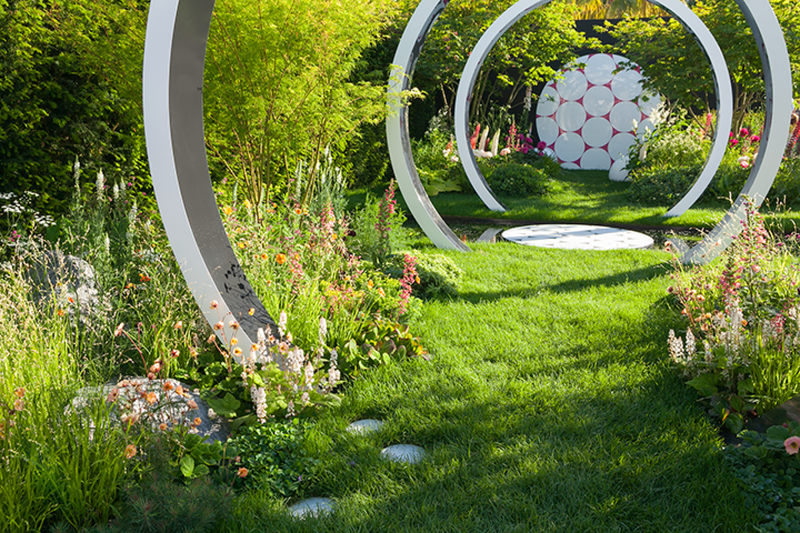 Location: RHS Chelsea Flower Show, London, UK. The Breast Cancer Now Garden: Through the Microscope. RHS Chelsea Flower Show 2017. ©RHS/Lee Beel. 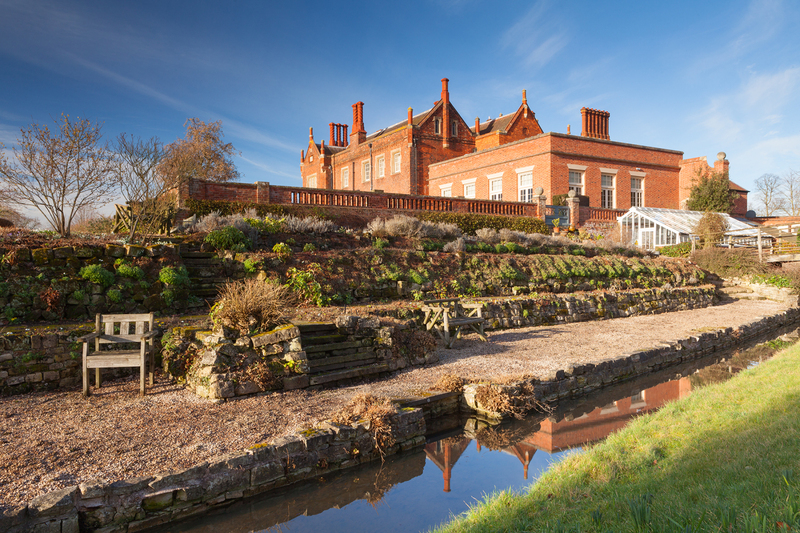 Hodsock Priory on a bright Winter afternoon. February 2018. Location: Hodsock Priory, Nottinghamshire, UK. 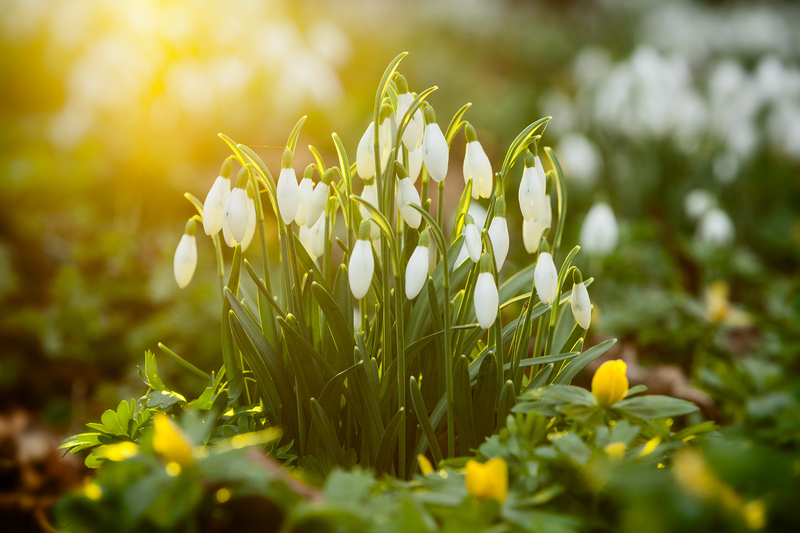 Snowdrops in Horsepasture Wood on a February morning, 2018. 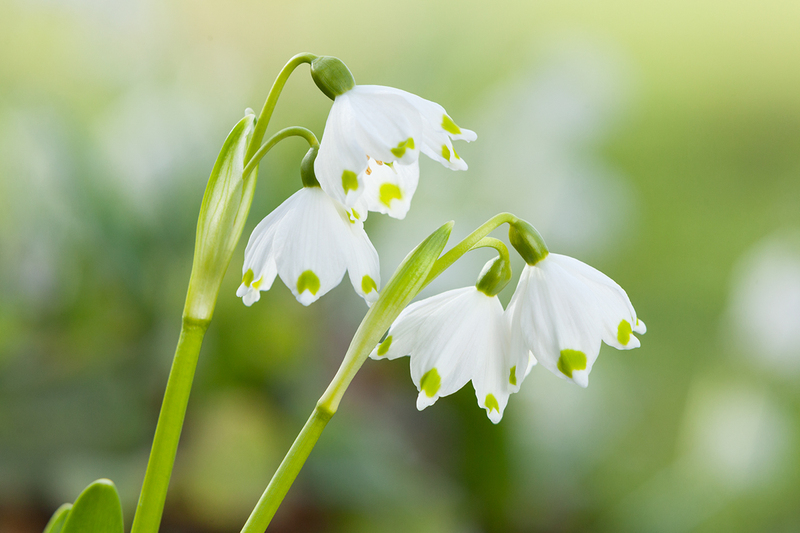 Leucojum vernum (spring snowflake) at Hodsock Priory. February 2018. 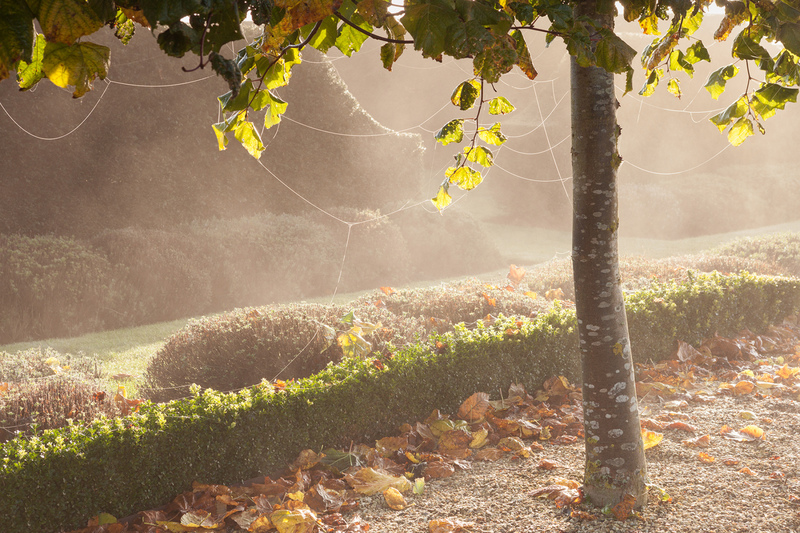 One of my favourite shots, taken of Spider Webs in early morning sunshine and mist at Brightwater Gardens, Lincolnshire. 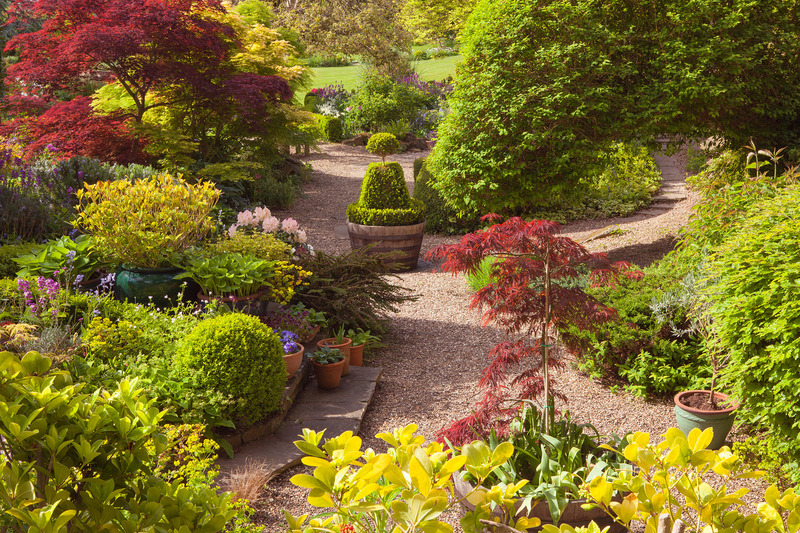 The garden is part of the Lincolnshire Gardens group and is an RHS Partner Garden. 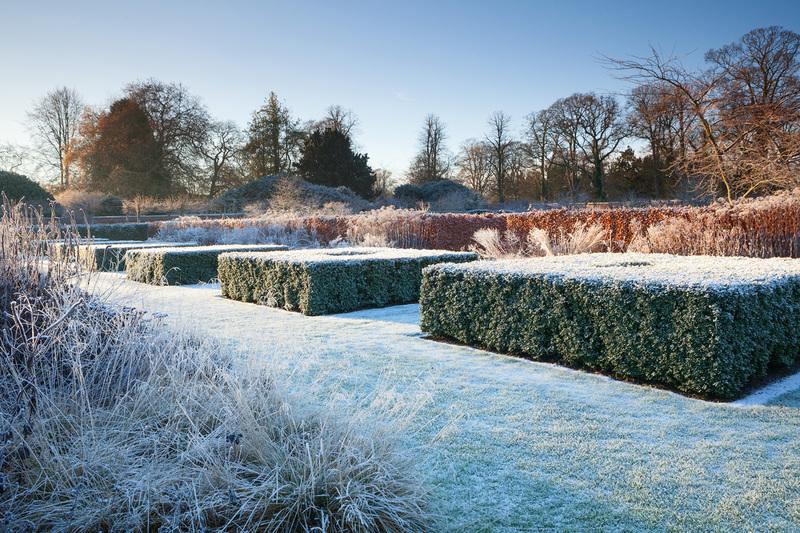 A beautiful winter morning in the Walled Garden at Scampston Hall, after the coldest night of the year so far. December 2017. Location: Scampston Hall, North Yorkshire, UK. 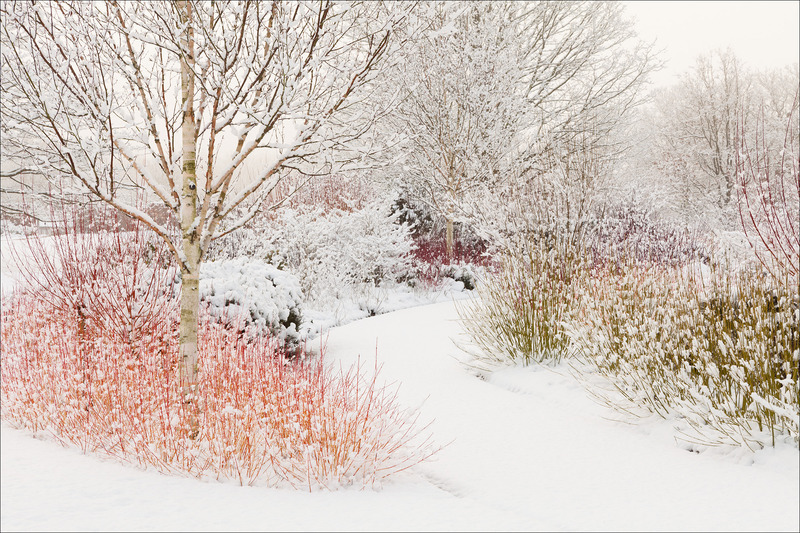 RHS Garden Harlow Carr in winter, shot for The RHS and published in the January 2018 issue of The Garden magazine. ©RHS/Lee Beel. 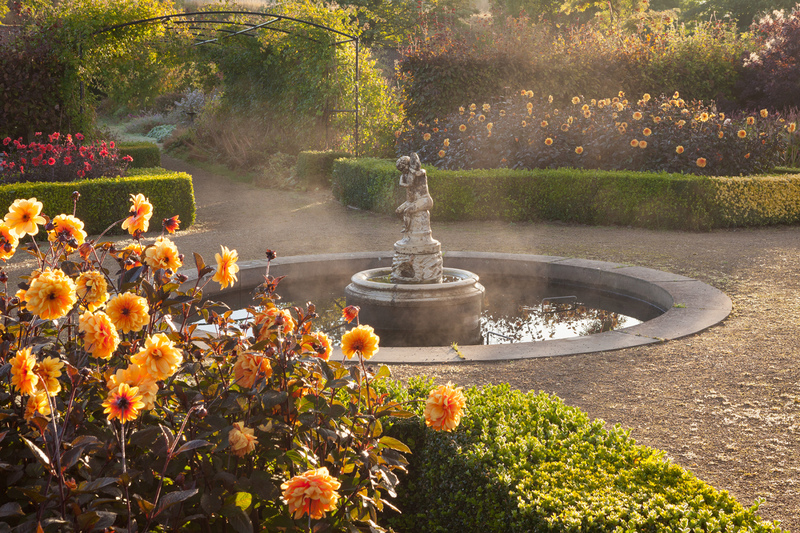 A beautiful autumnal morning in the Walled Garden at Scampston Hall, as mist rises from the old dipping pond. 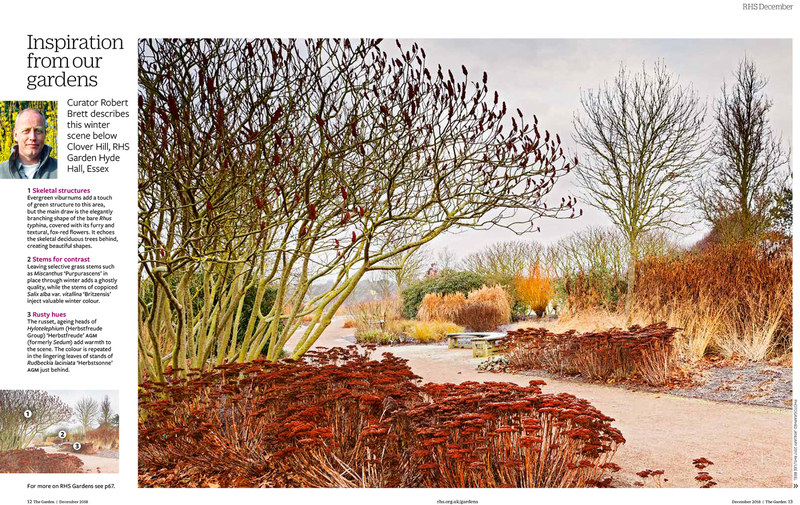 The Dry Garden in winter, shot for The RHS and published in the December 2017 issue of The Garden magazine. 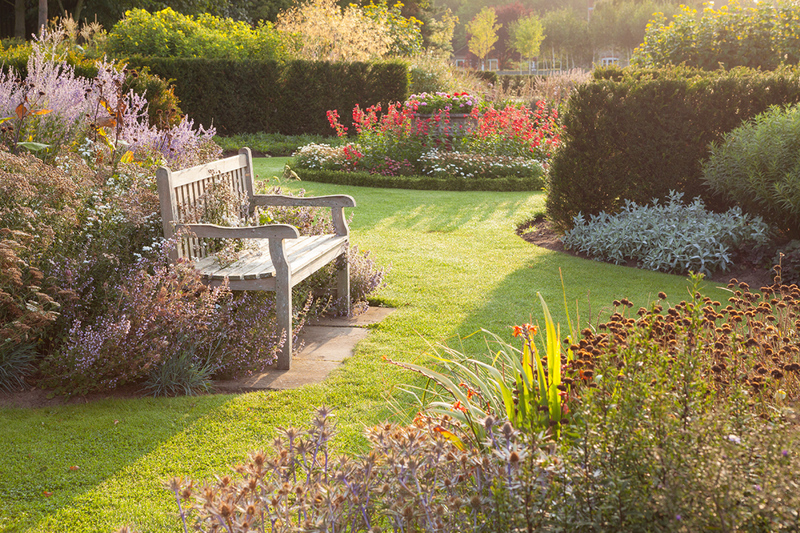 Location: RHS Garden Hyde Hall, Essex, UK. 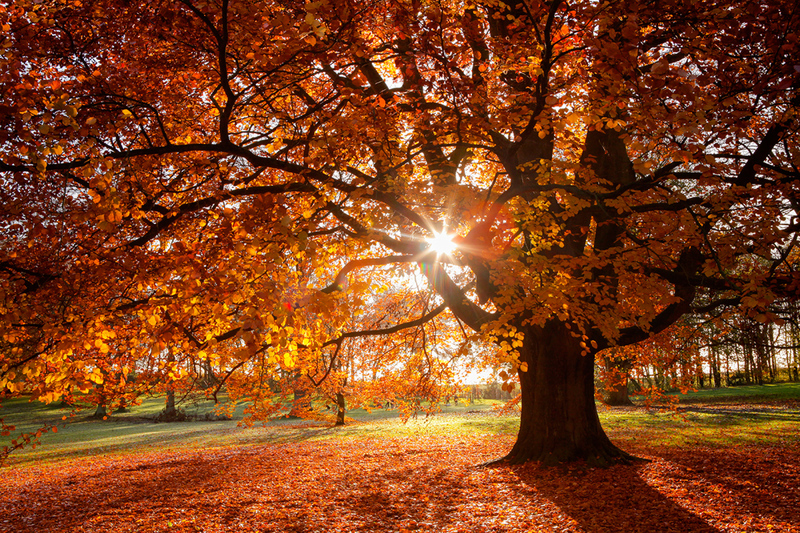 A Beech Tree in Baysgarth Park on a beautiful Autumn morning. November 2017. Location: Baysgarth Park, Barton-upon-Humber, North Lincolnshire, DN18 6AY. 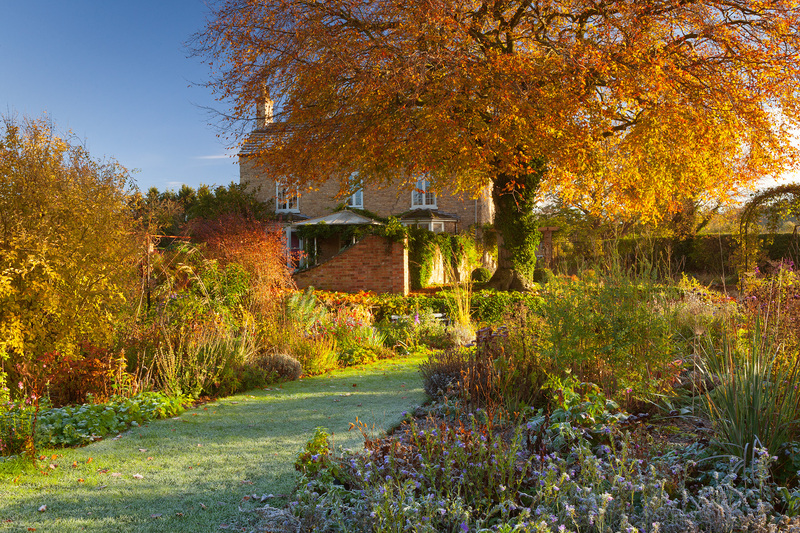 The first real frost of the season at Hall Farm, on a beautiful November morning. Autumn 2017. Location: Hall Farm Garden, Harpswell, Lincolnshire, UK. 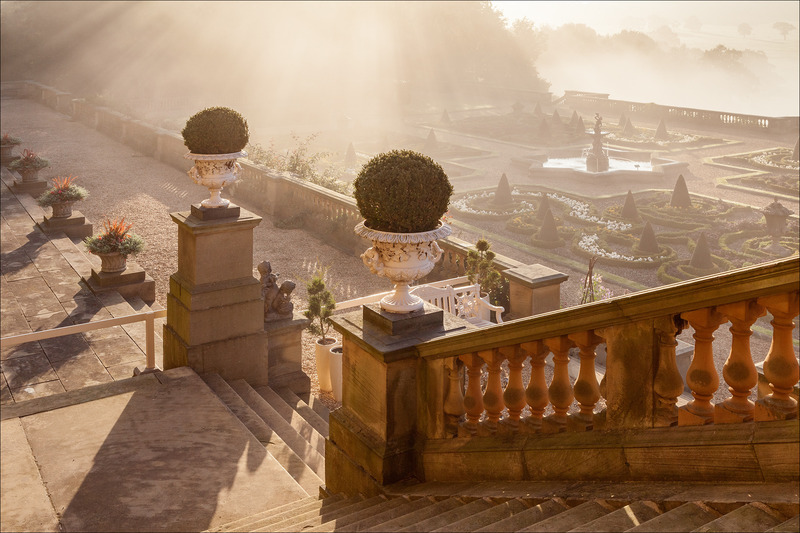 Morning light on the Serpentine Path from the Obelisk Lawn. Early Autumn, October 2017. 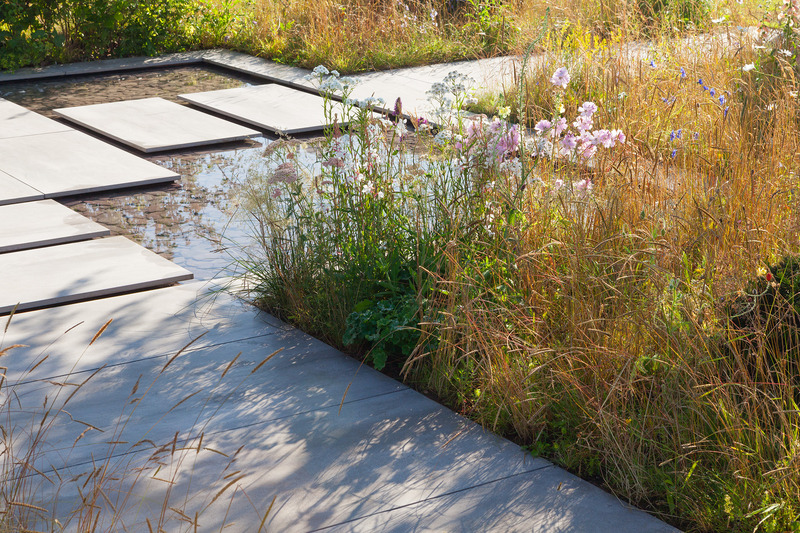 A shot of the Streamside the RHS commissioned. 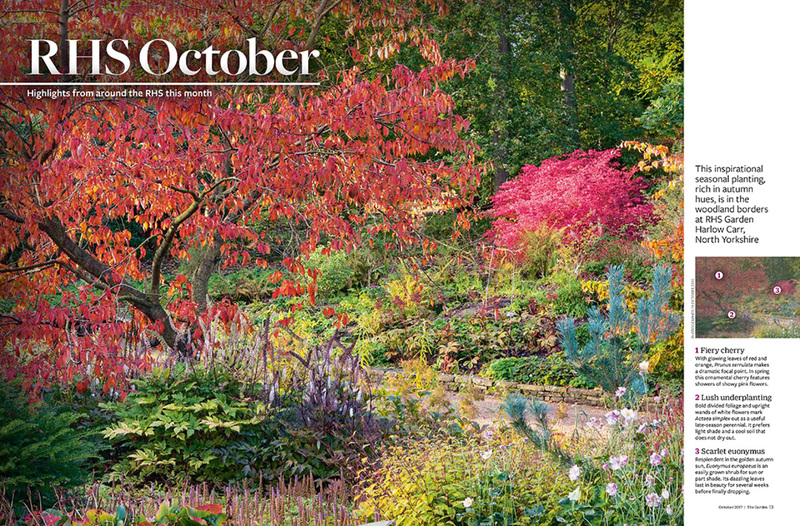 The Garden magazine, October 2017. 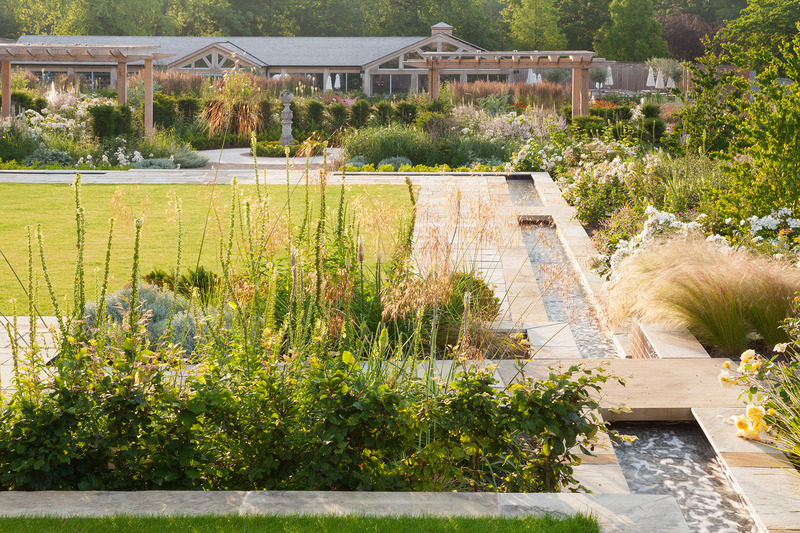 A shot of the Dry Garden the RHS commissioned. 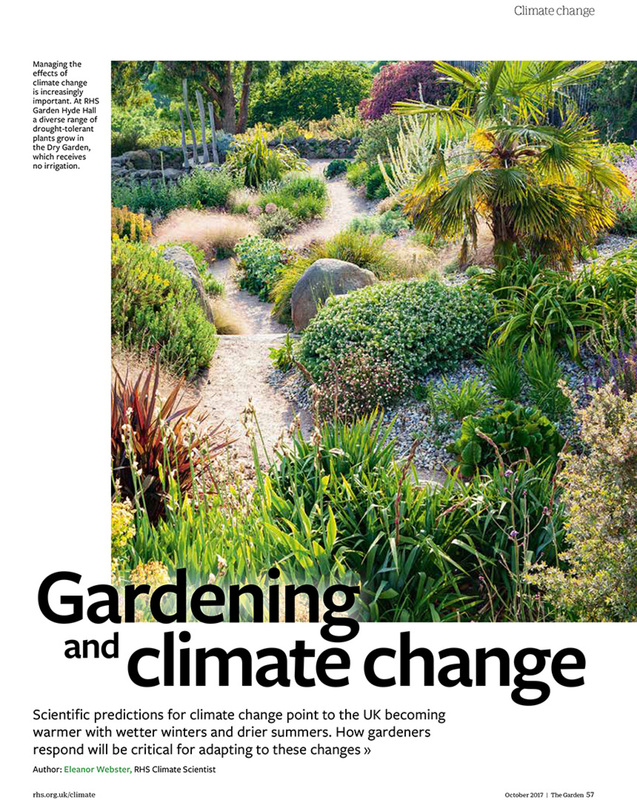 The Garden magazine, October 2017. 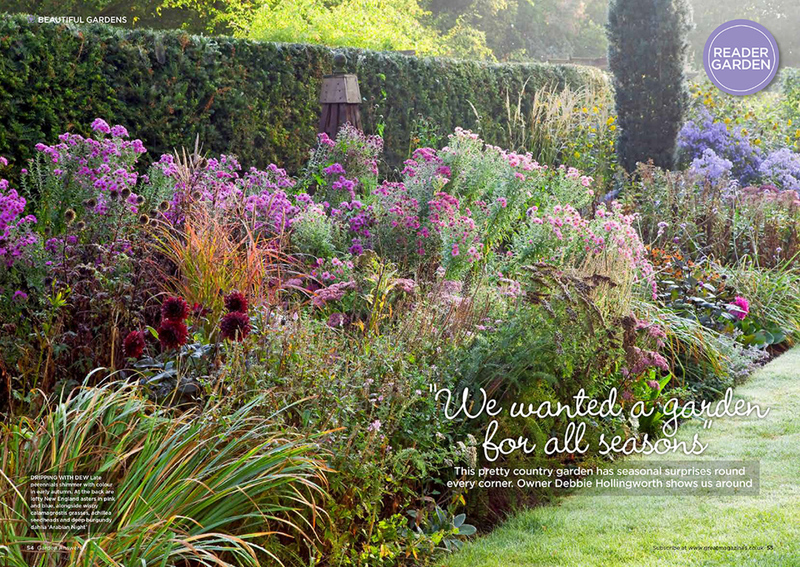 Goltho Gardens feature photographs in the October 2017 issue of Libelle magazine in Belgium. Location: Goltho Gardens, Lincolnshire, UK. 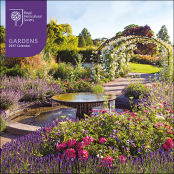 Goltho Gardens feature photographs in the October 2017 issue of Garden Answers magazine. Evening in the Walled Kitchen Garden at Normanby Hall. September 2017. Location: Normanby Hall, Scunthorpe, North Lincolnshire, UK. 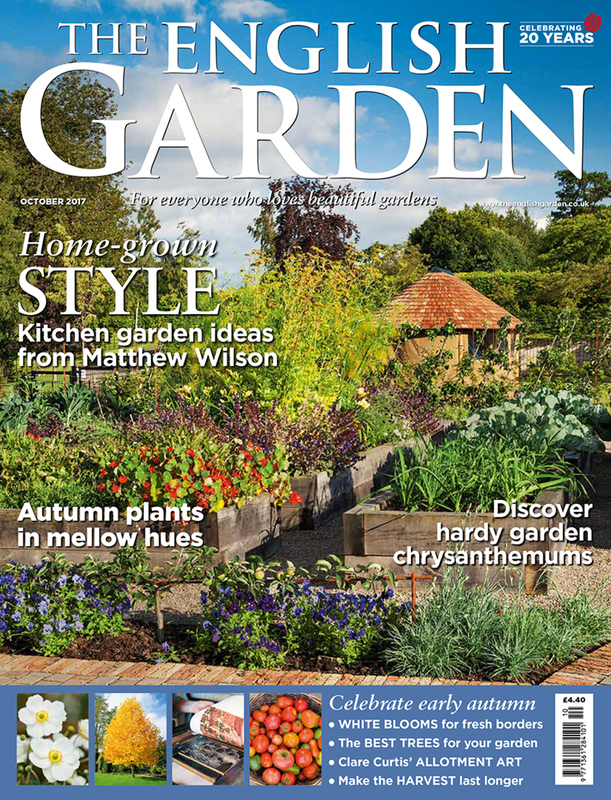 The English Garden magazine October 2017 features my photos of Rudding Park Kitchen Garden on the cover and inside. Location: Rudding Park Hotel, Harrogate, Yorkshire. 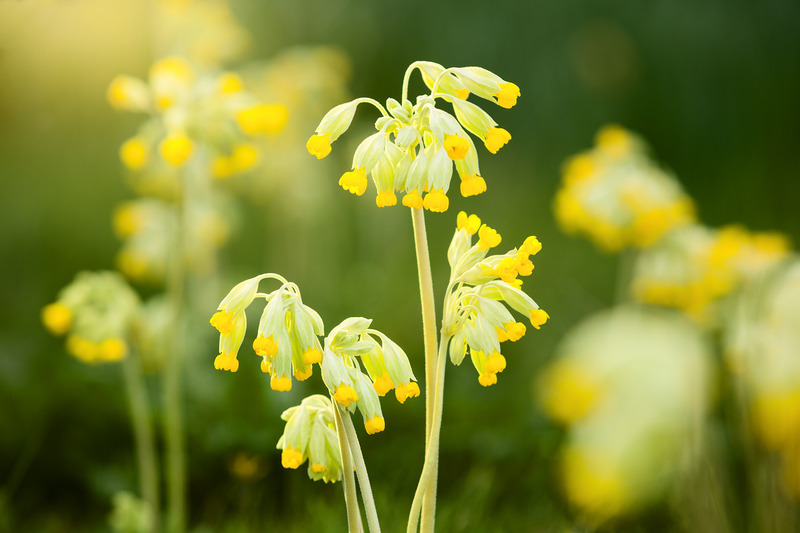 The RHS is using one of the shots I took for them at this year's Chelsea Flower Show to promote their 2018 shows. This is the 'Silk Road Garden, Chengdu, China'. ©RHS/Lee Beel. Sunrise on the last day of summer, August 31st, 2017. 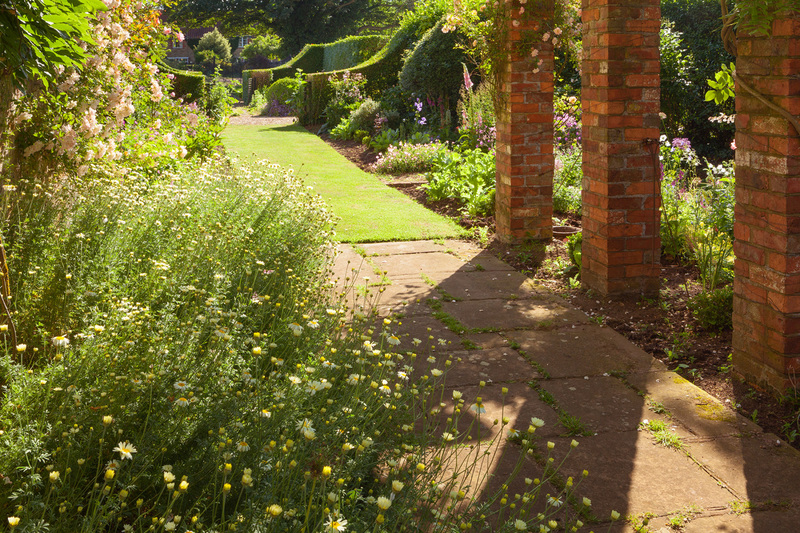 The Long Terrace at Brightwater Gardens, early on a Summer morning. August 2017. Part of a development on a residential housing association estate that I was commissioned to photograph by the landscape architect in charge. August 2017. 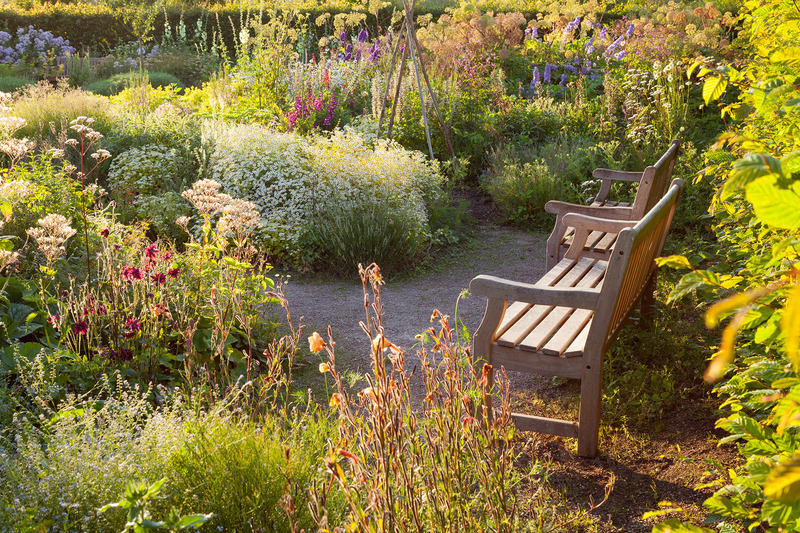 A bench and planting photographed early on an August morning, just after sunrise. 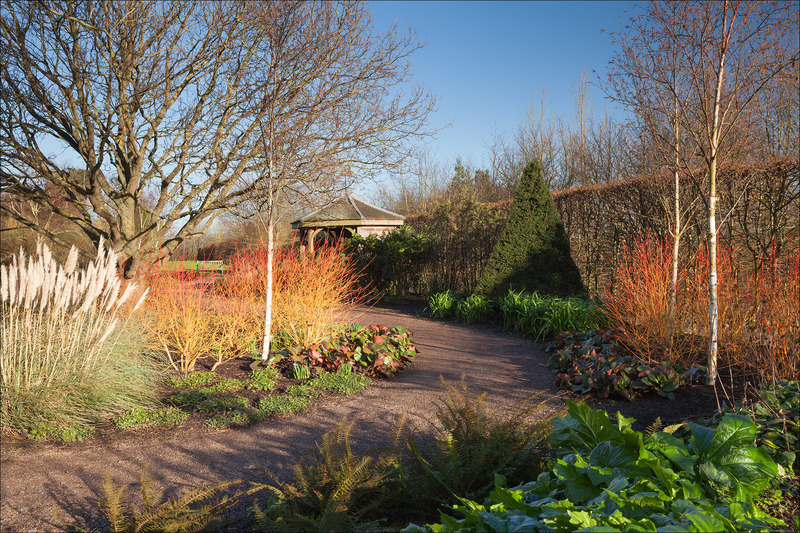 A misty Spring morning in the Hilltop Garden at RHS Garden Hyde Hall. May 2017. ©RHS/Lee Beel. Afternoon light on the Stepped Plats at Wynyard Hall Gardens. Summer, July 2016. Location: Wynyard Hall, Tees Valley, UK. 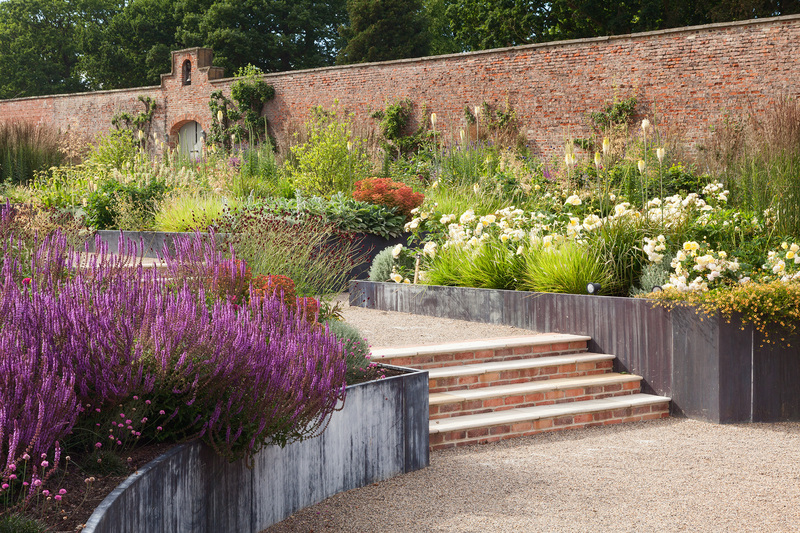 The West Garden at Doddington Hall and Gardens. Location: Doddington Hall, Lincolnshire, UK. 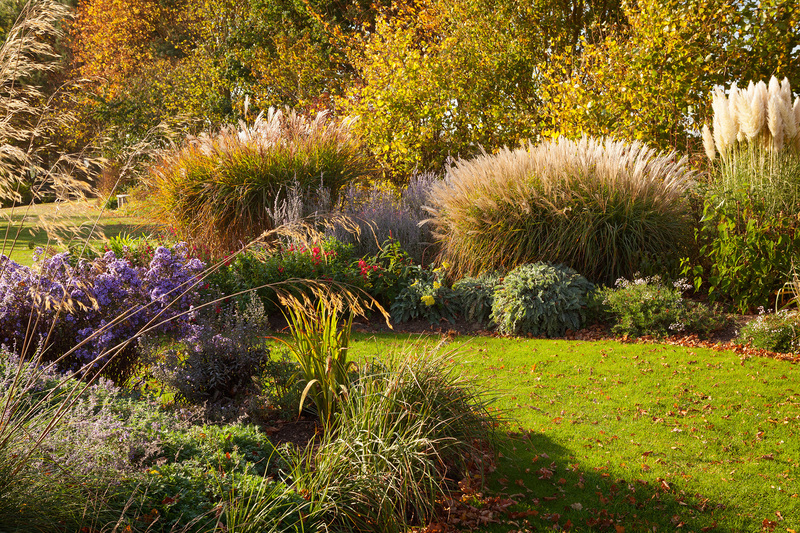 Panoramic image of Autumn at RHS Garden Harlow Carr. ©RHS/Lee Beel. 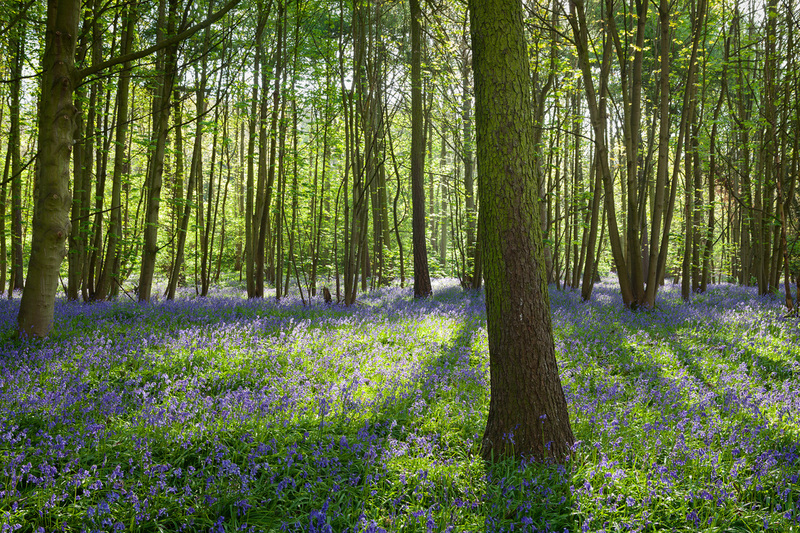 Bluebells in Brumby Wood on a Spring morning in May 2016. Location: Scunthorpe, North Lincolnshire, UK. 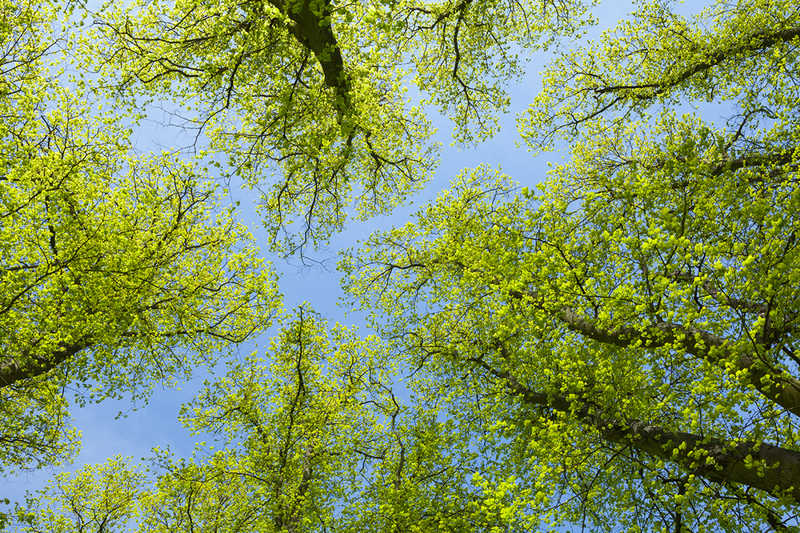 Fresh green leaves against a bright blue sky in Spring. May 2017. Location: Baysgarth Park, North Lincolnshire, UK. 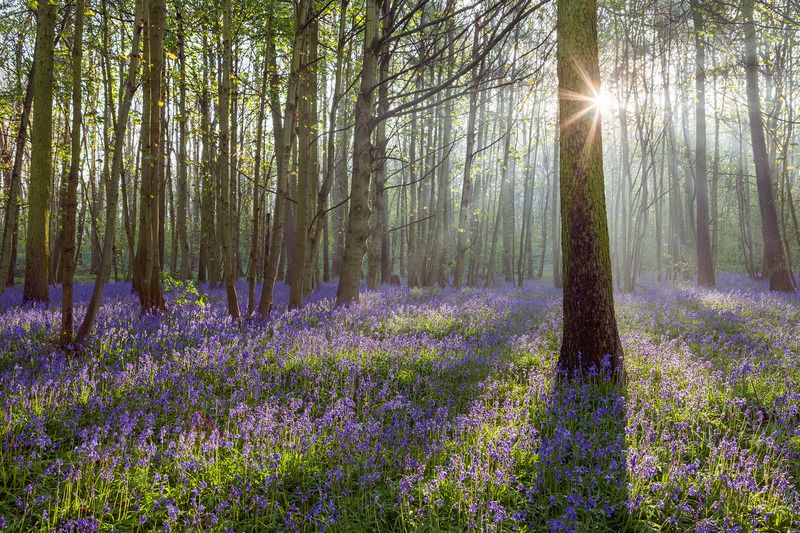 Bluebells in Brumby Wood on a Spring morning in April 2017. My photos of the Himalayan Garden at Harewood House. The English Garden, May 2017. Location: Harewood House, Yorkshire, UK. 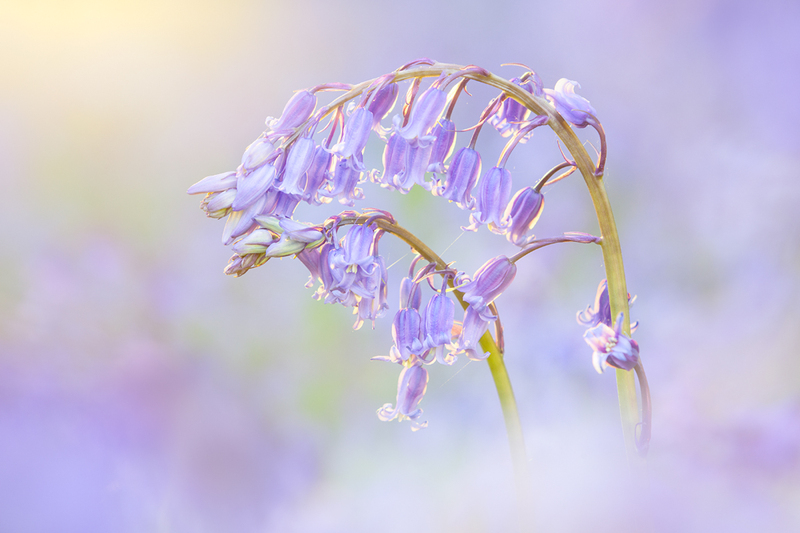 Bluebells in Brumby Wood on a misty Spring morning in April 2016. 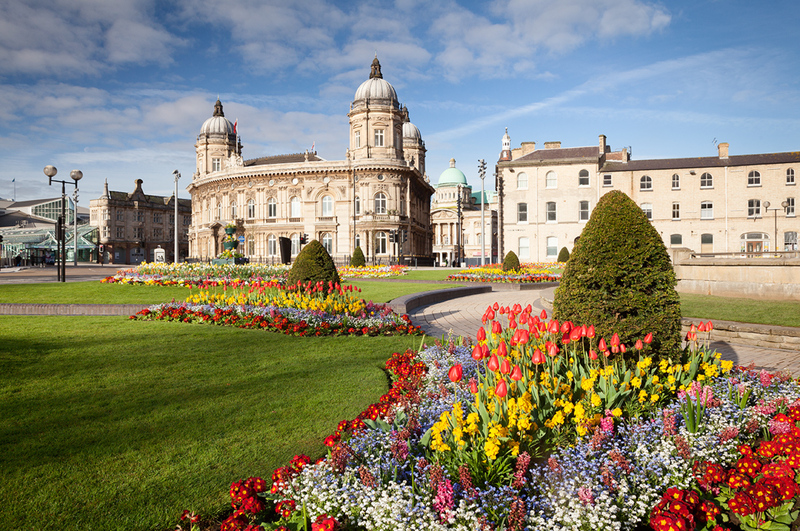 Morning sunlight on Queen's Gardens with the Maritime Museum and Town Hall in the background. Hull, the UK City of Culture 2017. Location: Hull, East Yorkshire, UK. 17th April 2017. 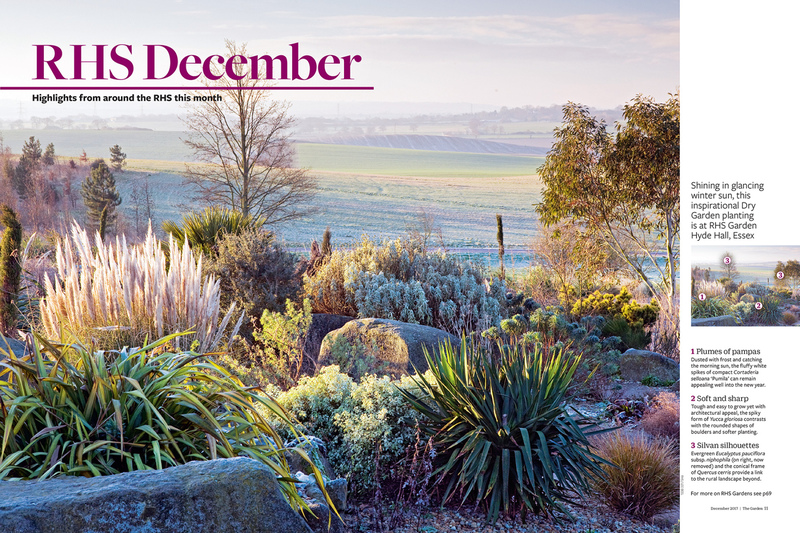 The GMG News featuring my winning 'Image of the Month' entries for November and December 2016. Location: Hall Farm, Harpswell and Brightwater Gardens, Saxby. Lincolnshire, UK. 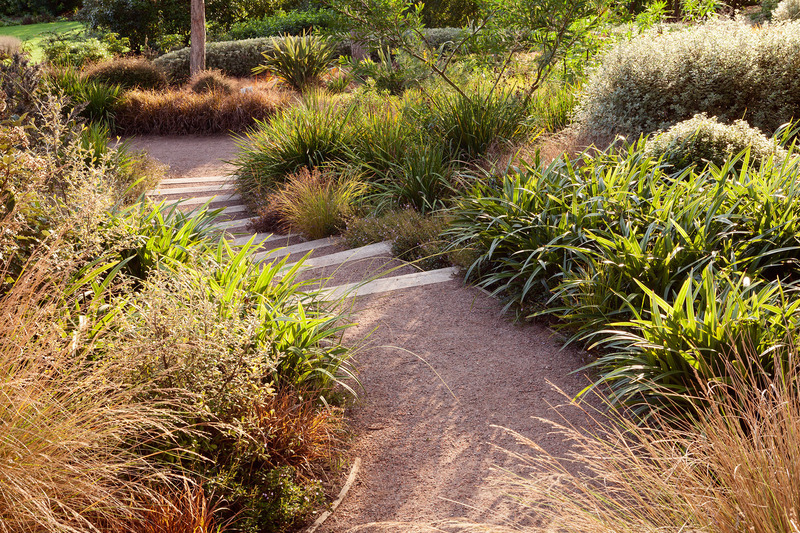 Australian and New Zealand Garden. Winter, January 2017. ©RHS/Lee Beel. 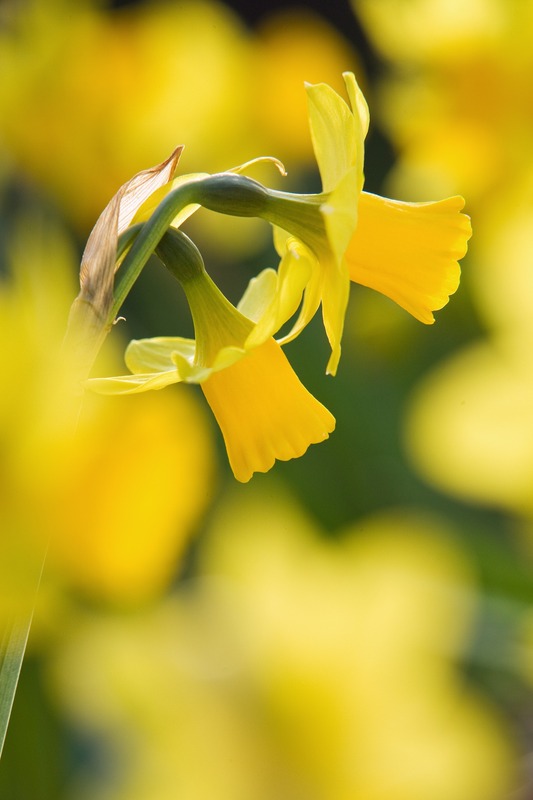 Daffodils at Elsham Hall Gardens and Country Park. 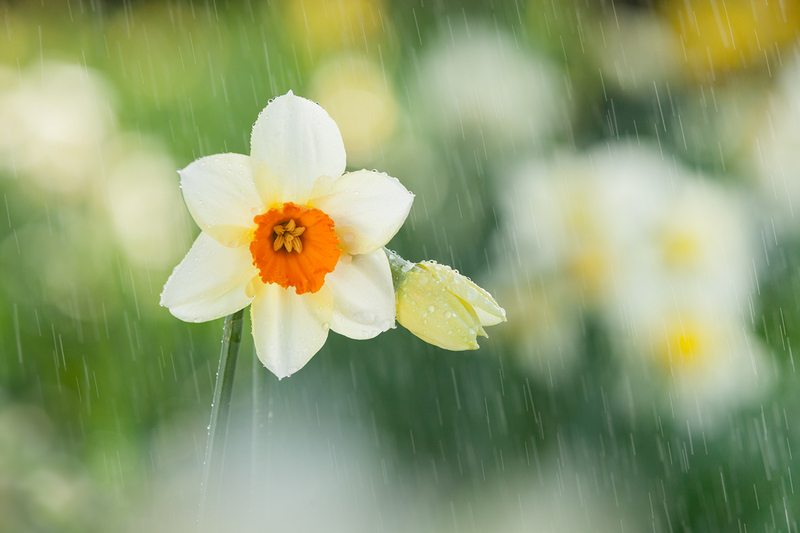 Spring, 15th March 2017. Location: Elsham, North Lincolnshire, UK. 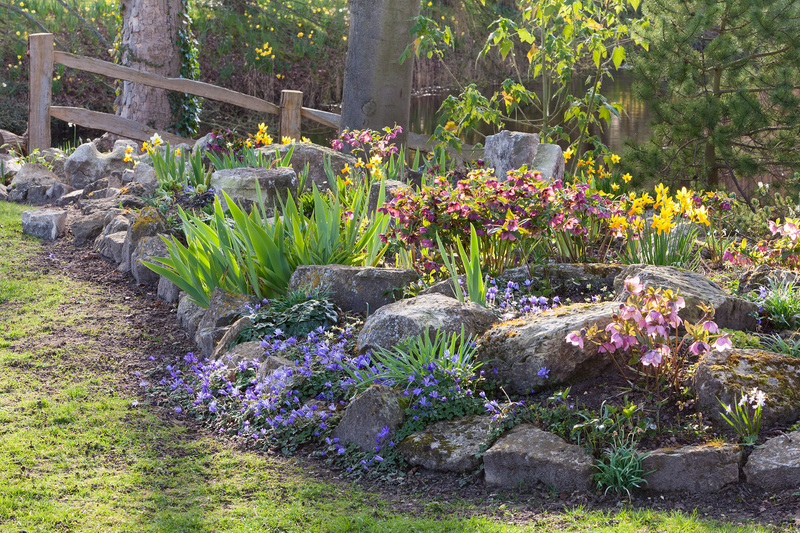 Various irises, narcissus and hellebores planted in the rockery around the lake, along with anenome blanda. Location: Ellerker House, Everingham, Yorkshire. 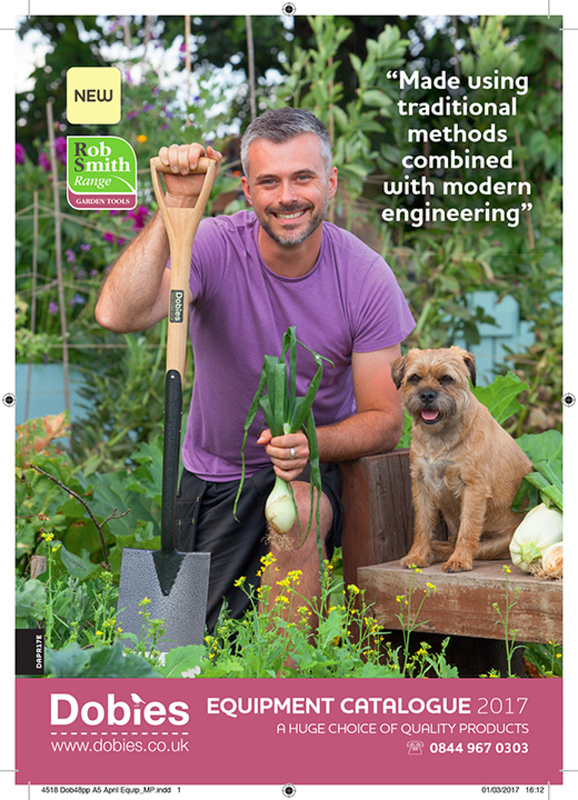 A commission I did with Dobies to shoot images with Rob Smith, winner of the BBC's 'Big Allotment Challenge', and his dog Winston. 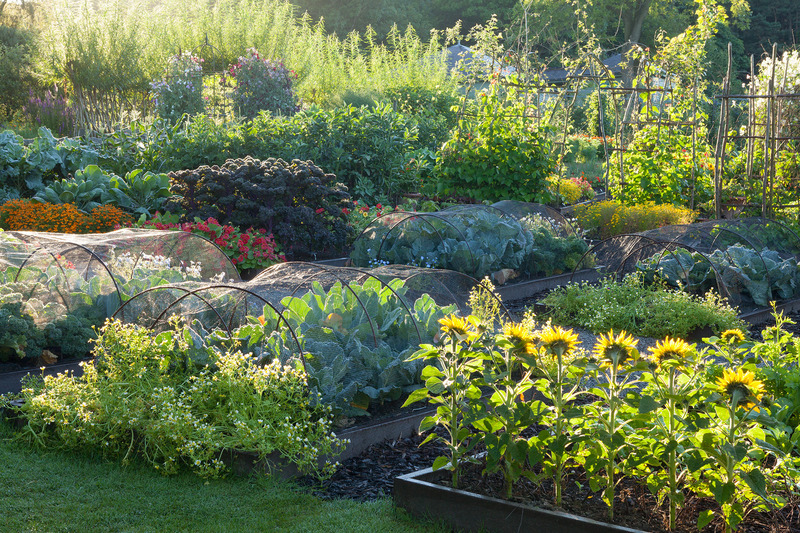 Location: Rob's Allotment, Sheffield, UK. 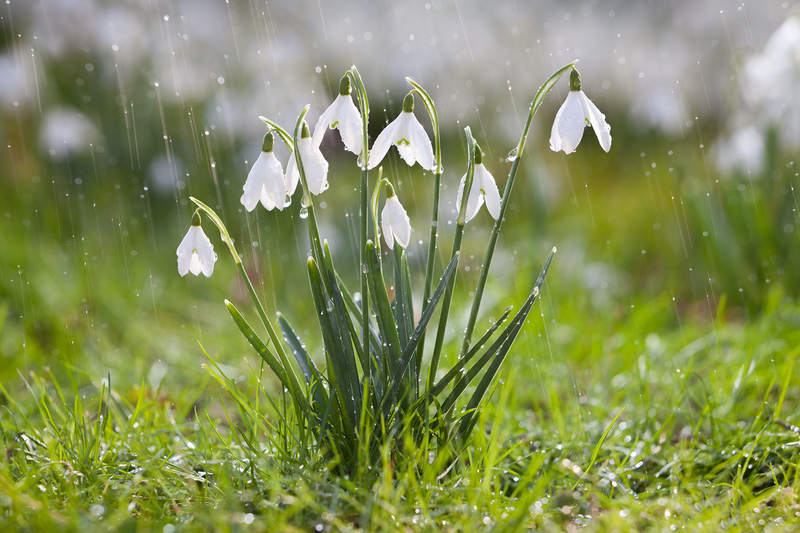 My photo of snowdrops used on the new RHS Garden Wisley Map front cover. March 2017. 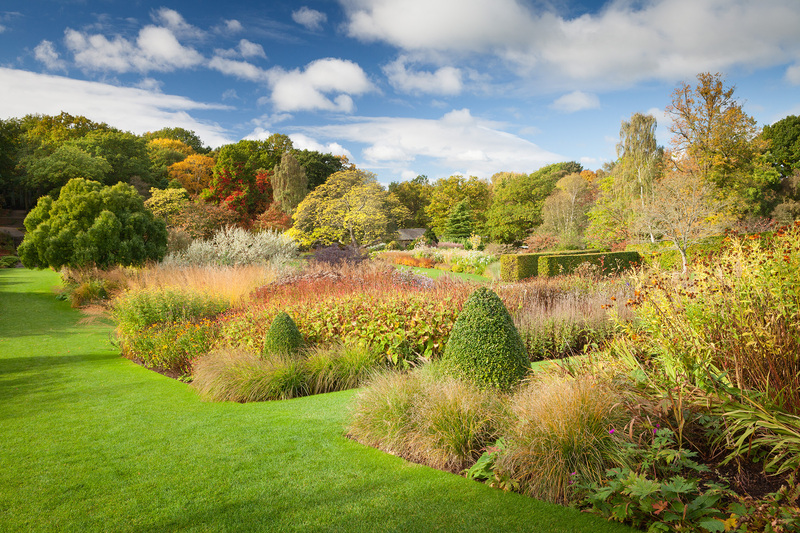 Location: RHS Garden Wisley Surrey, UK. 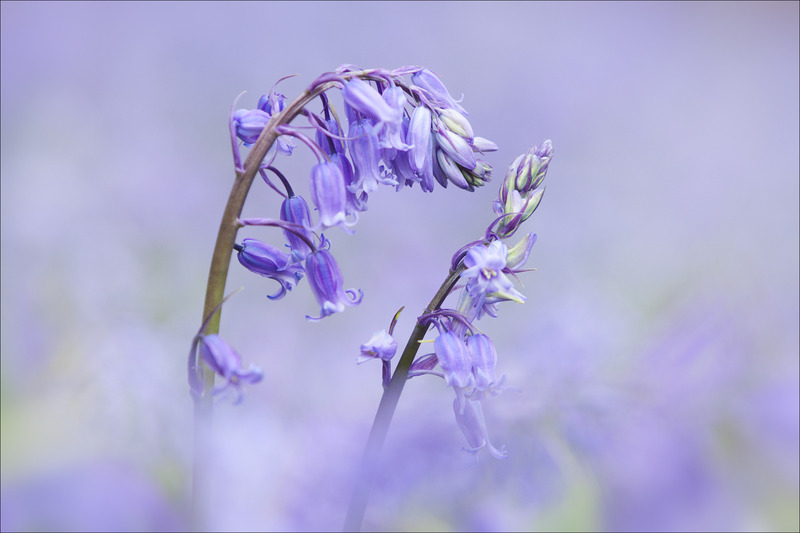 My Bluebell Photo used on the Garden Media Guild leaflet. 2017. 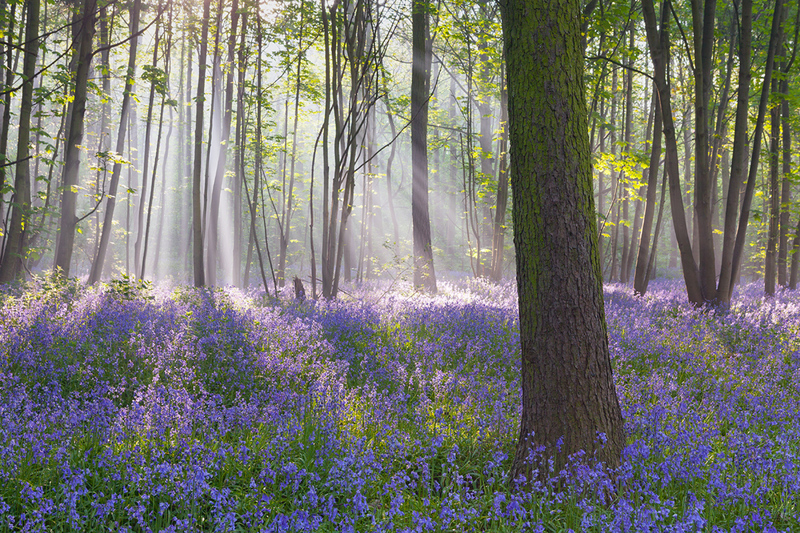 Location: Brumby Wood, Scunthorpe, North Lincolnshire, UK. 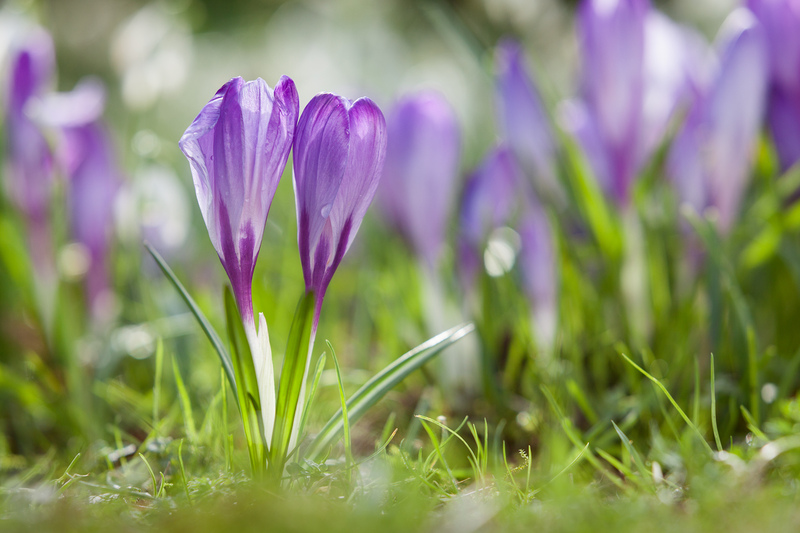 Crocuses at the Parish Church of St. Lawrence. Winter, February 2017. 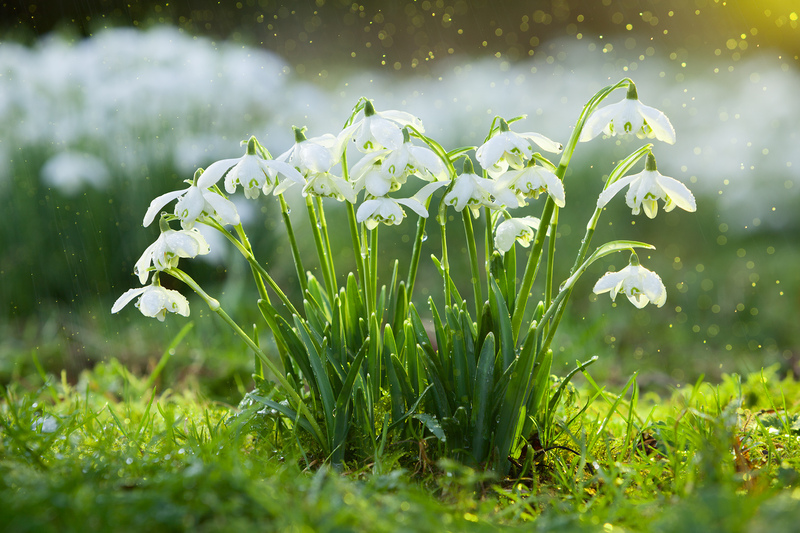 Snowdrops at Elsham Hall Gardens and Country Park. Winter, February 2017. 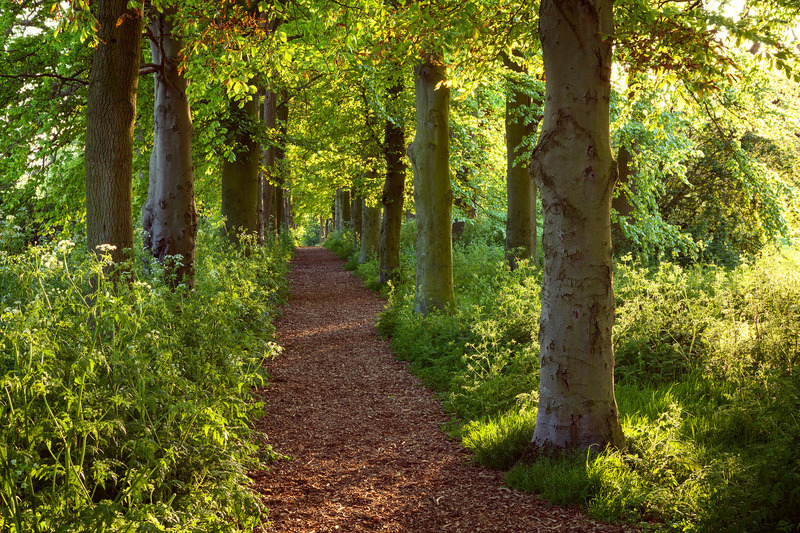 Location: Elsham Gardens and Country Park, Elsham, North Lincolnshire, UK. 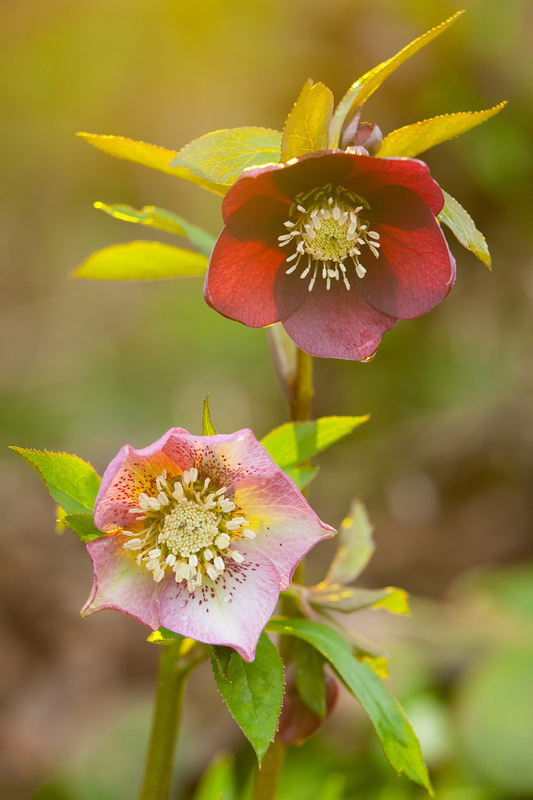 Hellebores at Ellicar Gardens. February 2017. Location: Nottinghamshire, UK. Winter, February 2017. 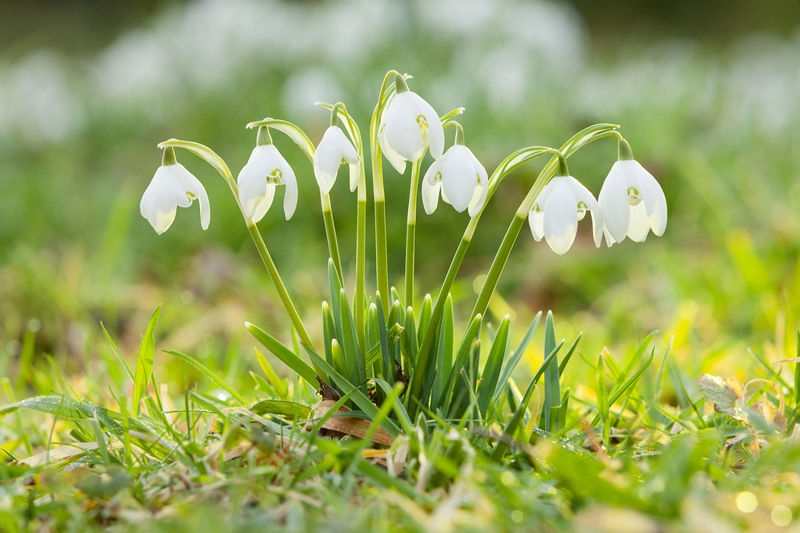 Snowdrops at Elsham Gardens. February 2017. 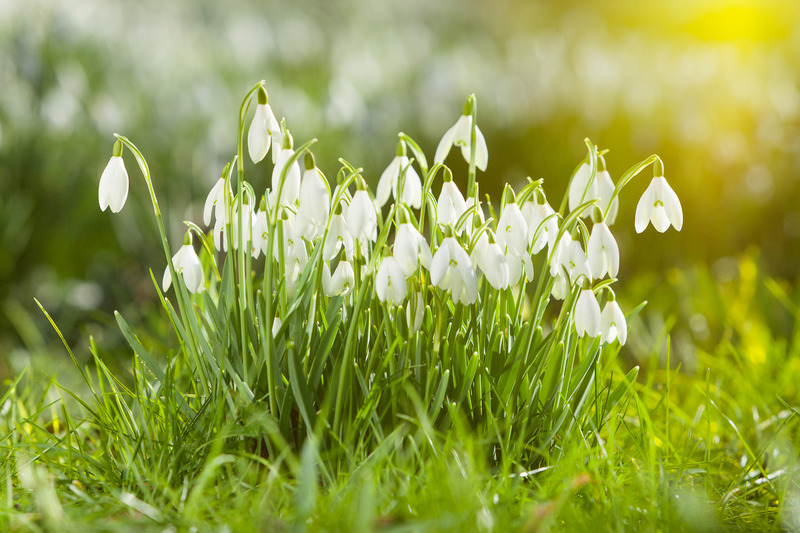 Snowdrops in a Lincolnshire Woodland in afternoon light. 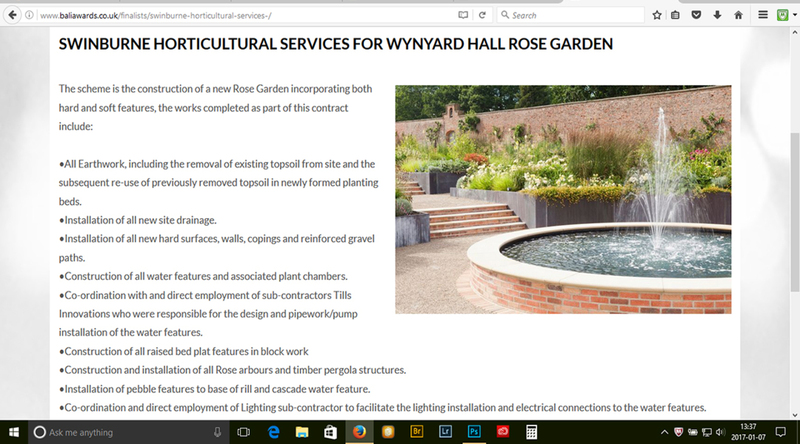 Photographs I was commissioned to take of Wynyard Hall Rose Garden helped Swinburne Horticultural Services Ltd. win two British Association of Landscape Industries 'National Landscape Awards 2016'. The Lower Lawn after snowfall. Commissioned by the RHS. January 2016. © RHS/Lee Beel. The setting sun through pleached lime trees in rural Lincolnshire. 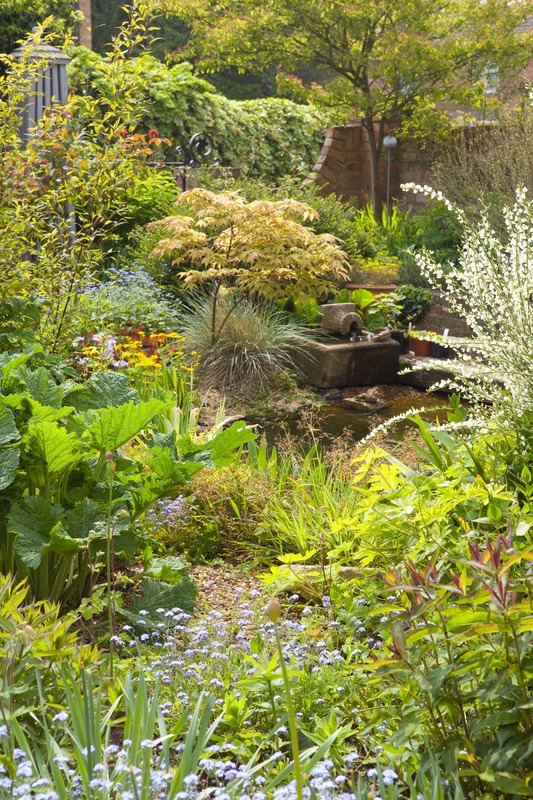 Brightwater Gardens is an RHS Partner Garden. 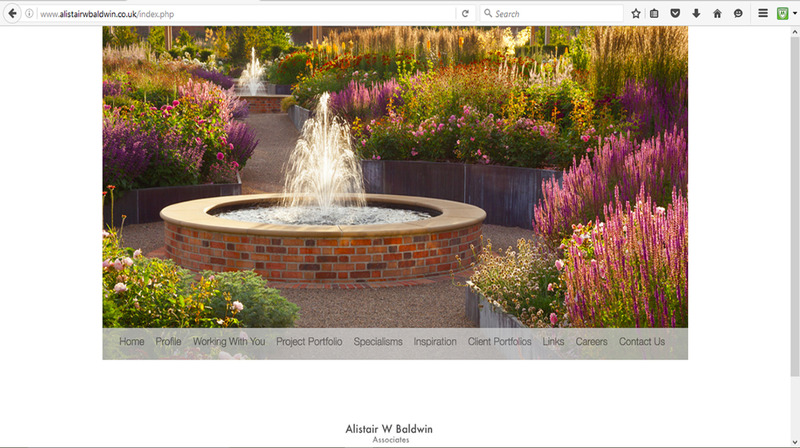 Location: Brightwater Gardens, Saxby, Lincolnshire, UK. A beautiful, frosty start to the day in rural Lincolnshire. It is believed that Lancelot 'Capability' Brown was involved in the creation of the church you can see through the pleached lime - St. Helens Church at Saxby in Lincolnshire. 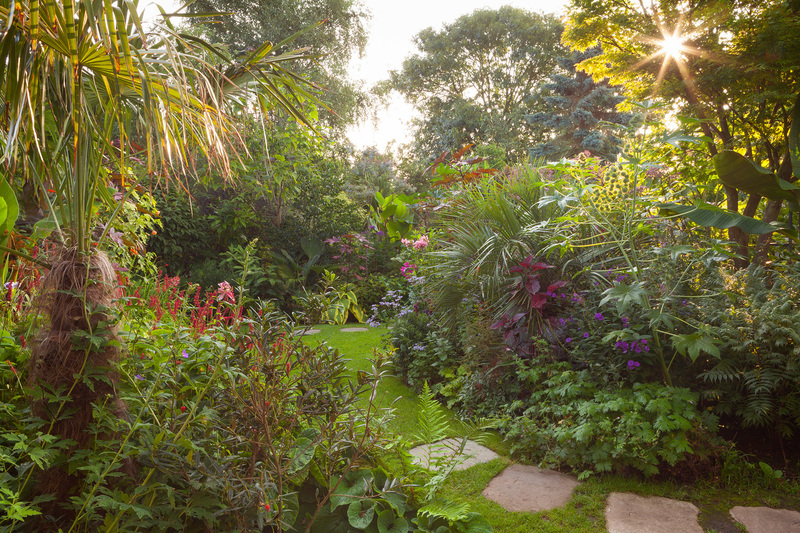 Brightwater Gardens is an RHS Partner Garden. 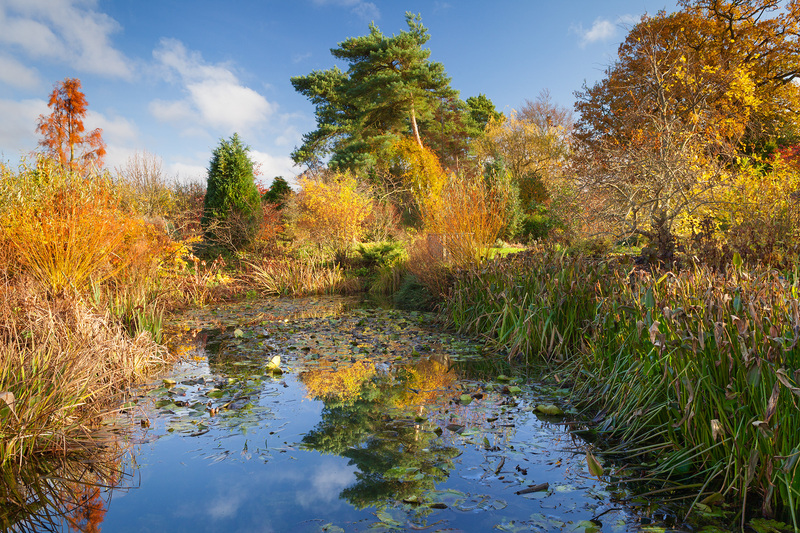 The pond at Goltho Gardens on a bright Autumn afternoon. November 2016. Location: Goltho Garden, Lincolsnhire, UK. 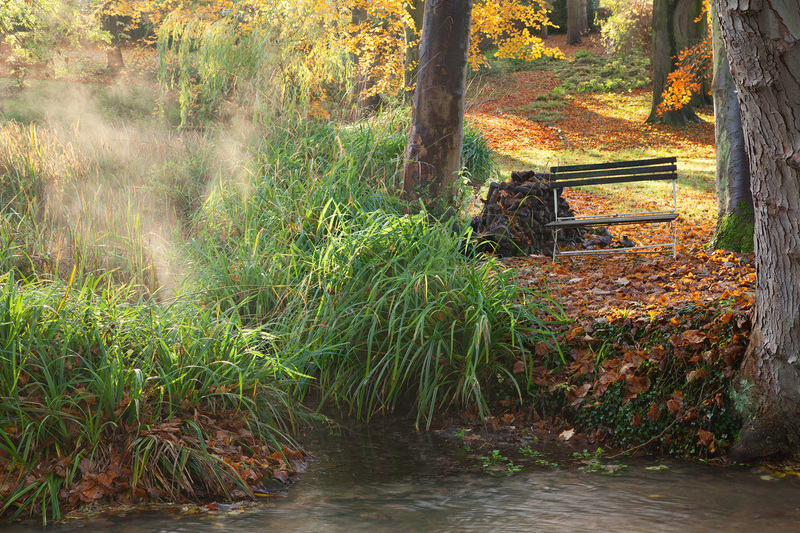 Mist rising from a natural spring on a cold Autumn morning. November 2016. 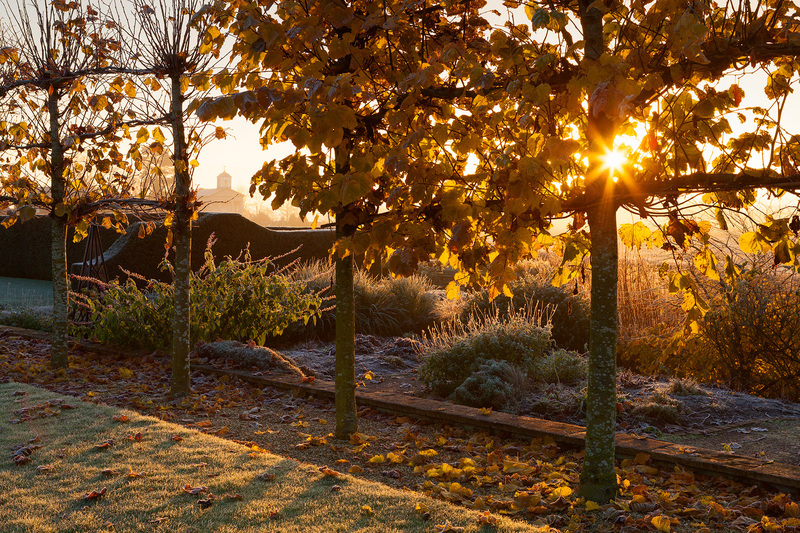 A frosty Autumn morning at Hall Farm Garden. November 2016. 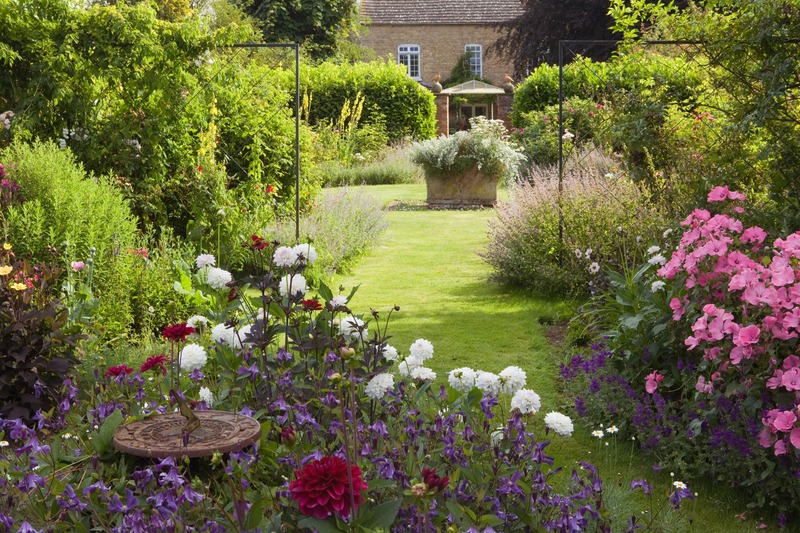 Location: Hall Farm Garden, Lincolnshire, UK. 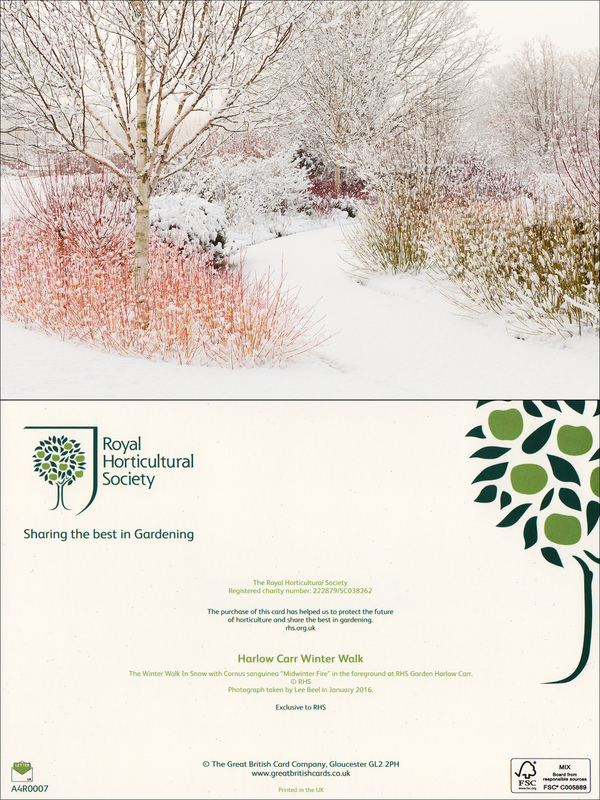 The 2016 RHS Christmas Card, featuring a shot I took of the Winter Walk at Harlow Carr. 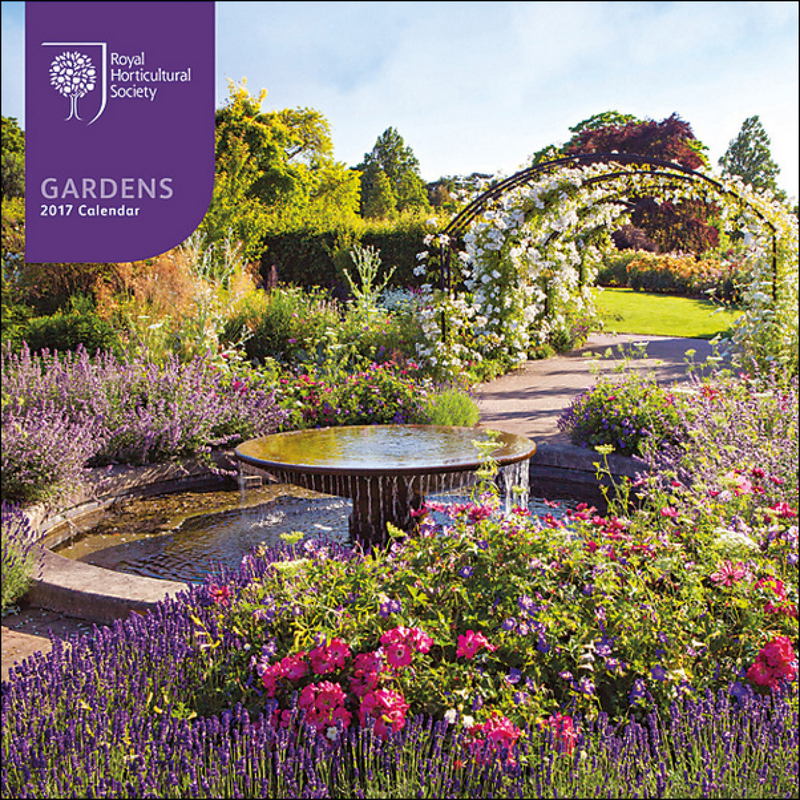 A photo I shot of the Country Garden, used on the cover of the RHS Gardens Calendar 2017. 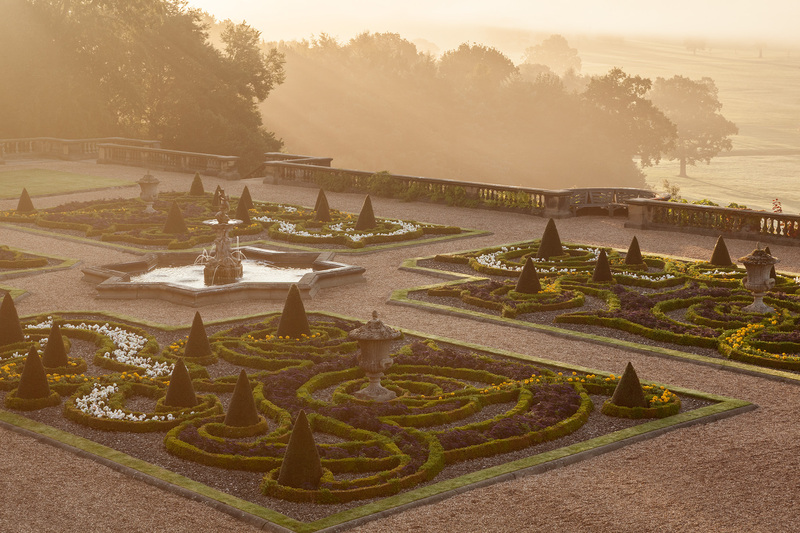 Early morning mist and sunshine at the Terrace Garden. 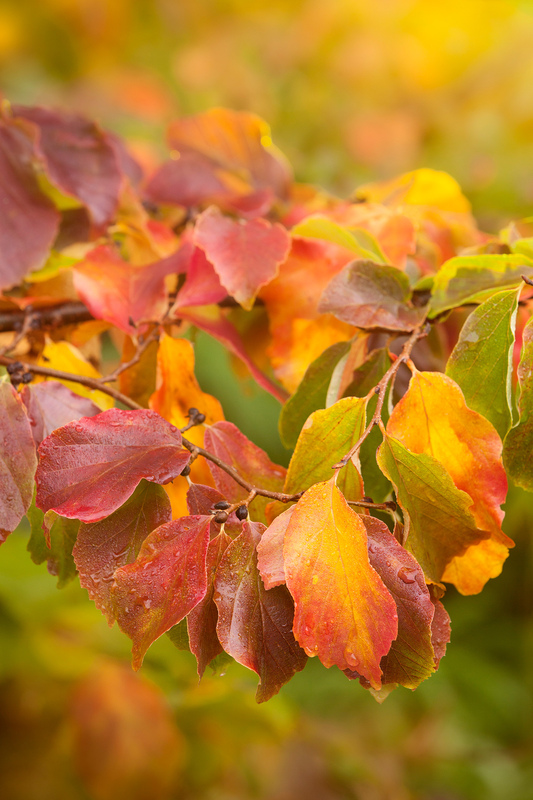 Colourful leaves on an Autumn morning, October 2016. ©RHS/Lee Beel. 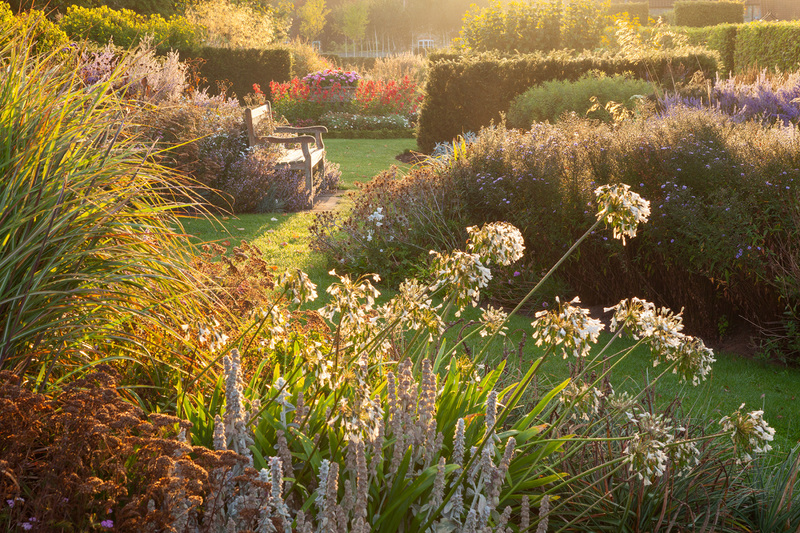 The Main Borders at RHS Garden Harlow Carr on a lovely Autumn morning, October 2016. ©RHS/Lee Beel. 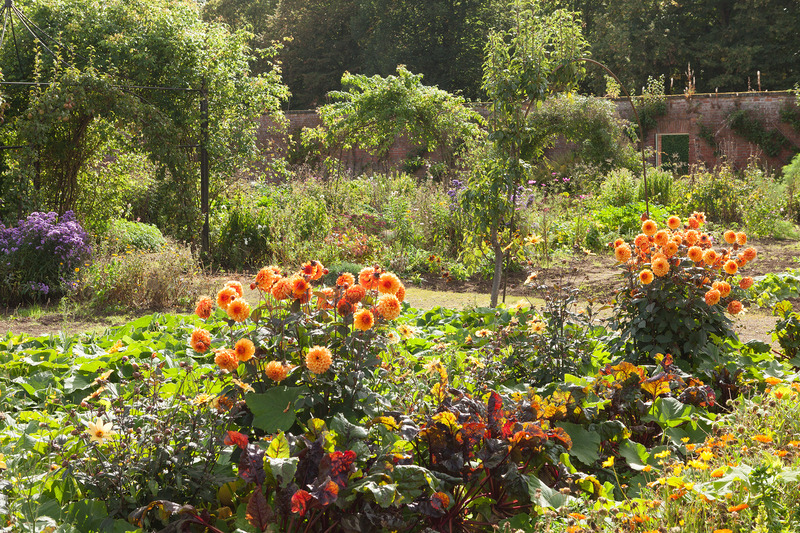 The Victorian Walled Garden at Normanby Hall Country Park. October 2016. 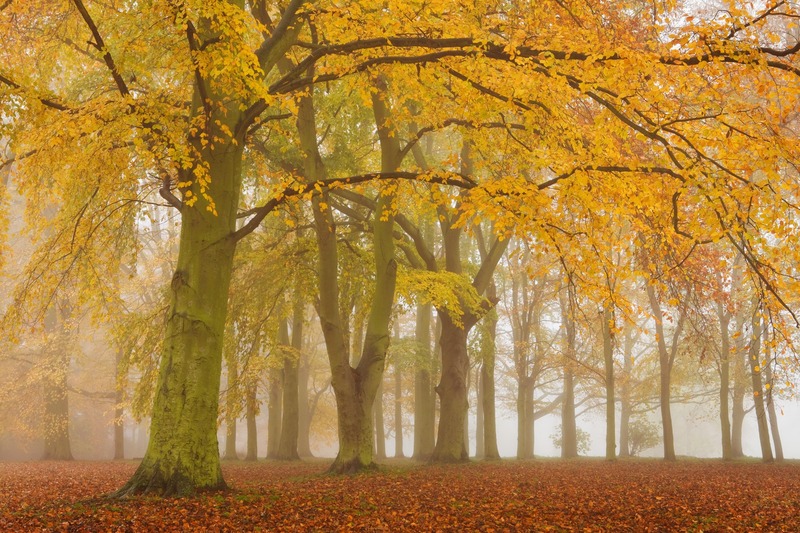 Location: Normanby Hall Country Park, North Lincolnshire, UK. 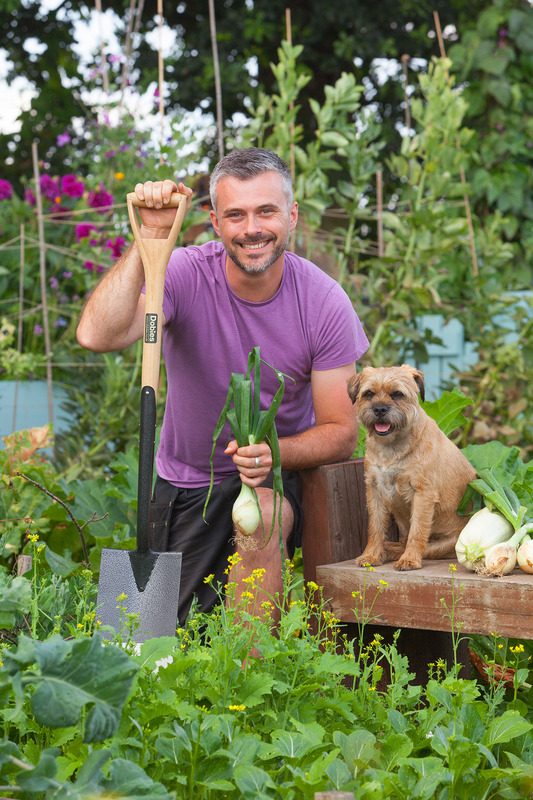 Promotional shot of Rob Smith, winner of the BBC's 'Big Allotment Challenge', and his dog Winston. Commissioned by Dobies of Devon. 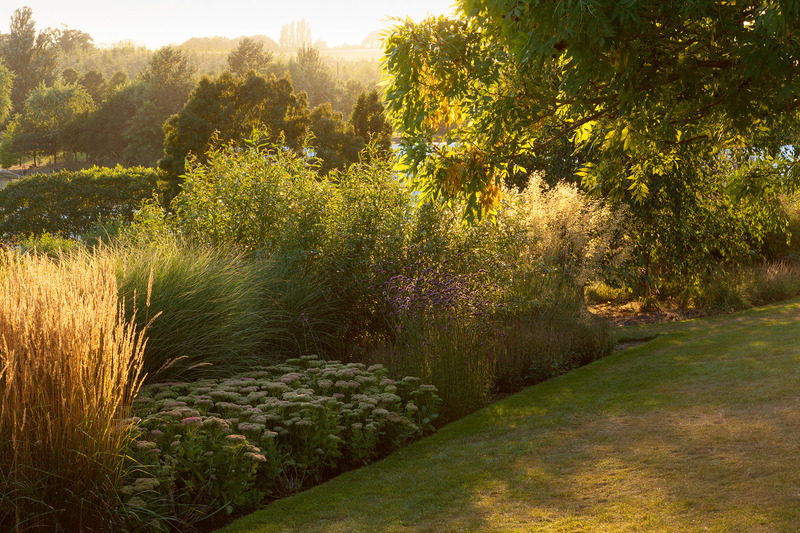 Evening light on Clover Hill at Hyde Hall. Summer, August 2016. ©RHS/Lee Beel. 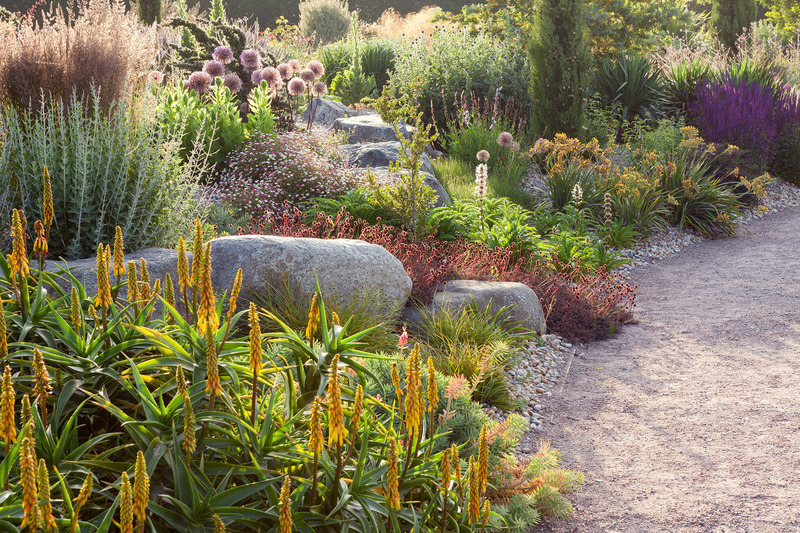 The Dry Garden at Brightwater Gardens. 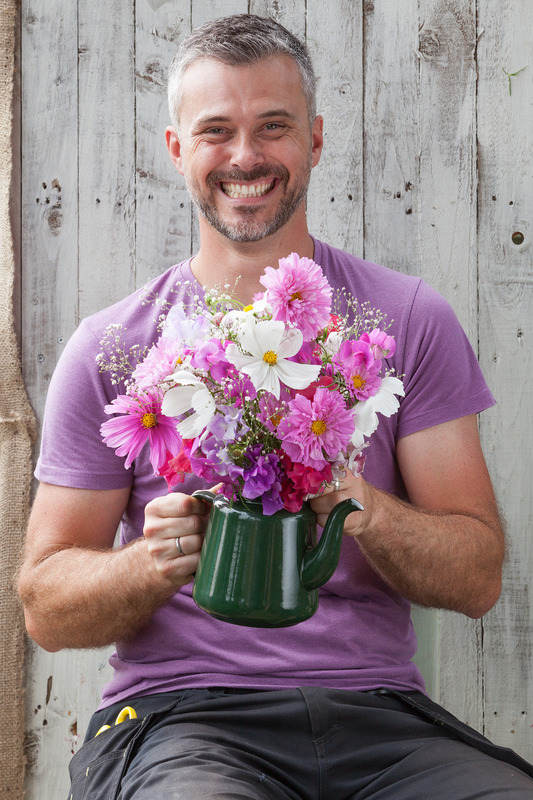 Promotional shot of Rob Smith, winner of the BBC's 'Big Allotment Challenge'. 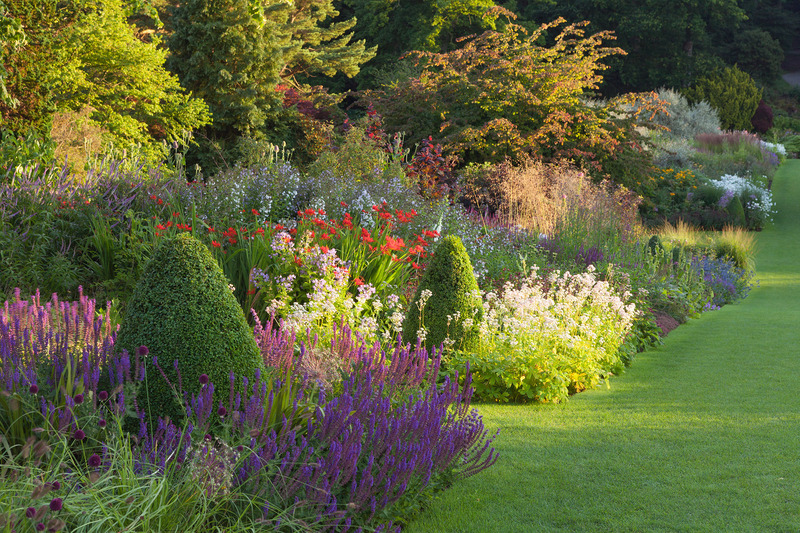 Morning light on the Herbaceous Borders at Hyde Hall. Summer, August 2016. ©RHS/Lee Beel. 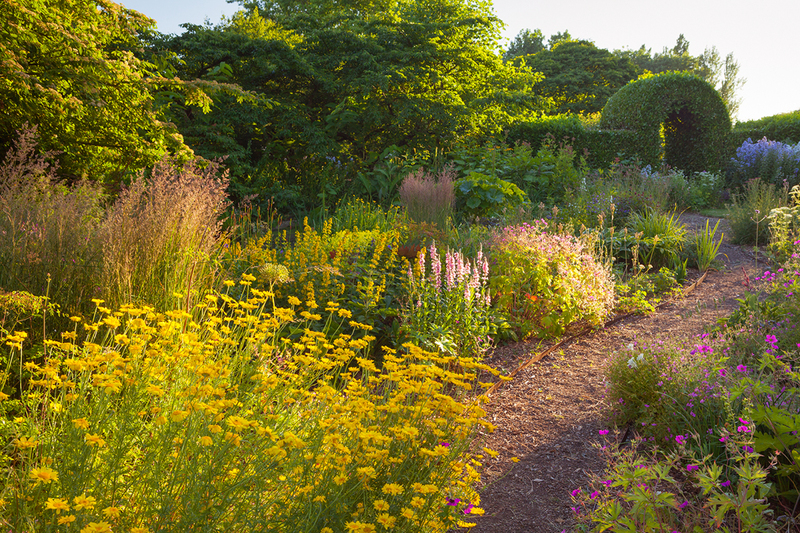 The Main Borders at RHS Garden Harlow Carr on a summer evening, July 2016. ©RHS/Lee Beel. 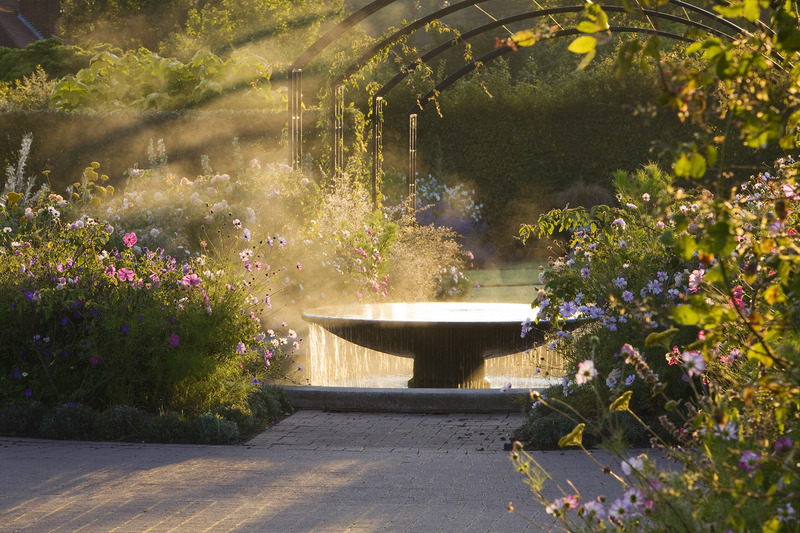 Morning light at Wynyard Hall Gardens. Summer, July 2016. 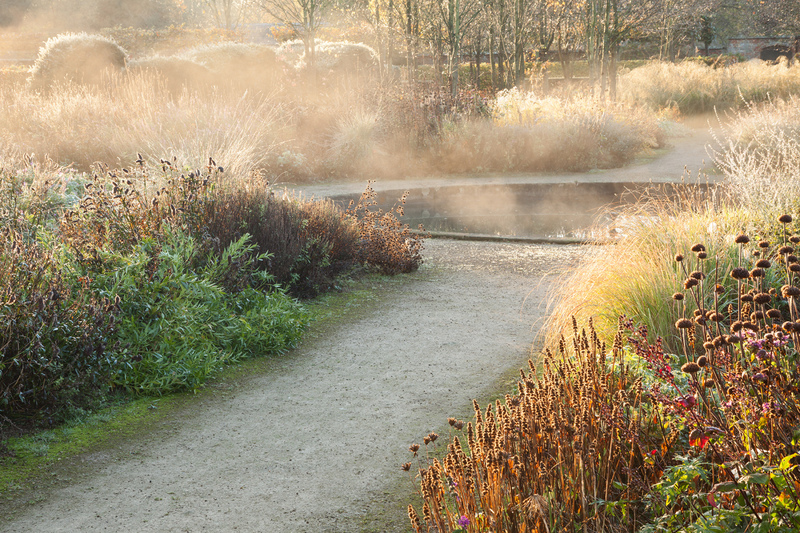 Early morning light in the kitchen garden at RHS Garden Harlow Carr. Summer, July 2016. ©RHS/Lee Beel. RHS Flower Show Tatton Park 2016. 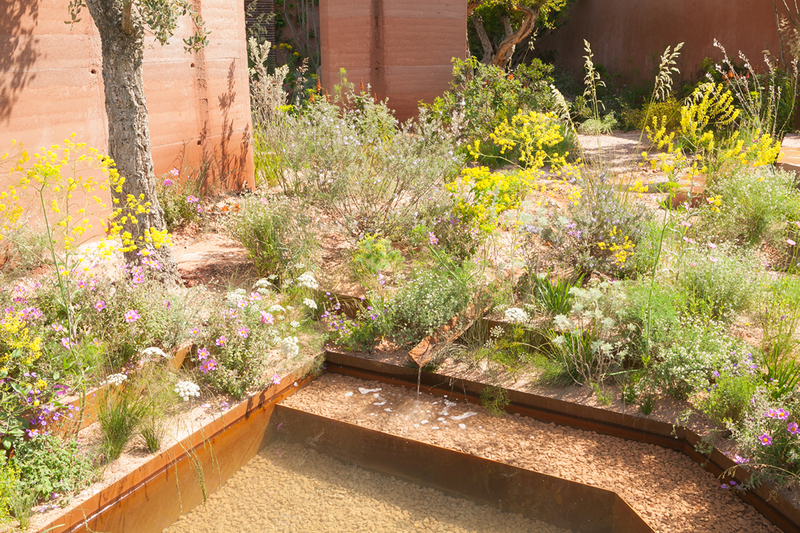 Gold Medal winning garden 'Nature & Nurture' by Caitlin McLaughlin, who was crowned 'RHS Young Designer of the Year' for 2016. ©RHS/Lee Beel. 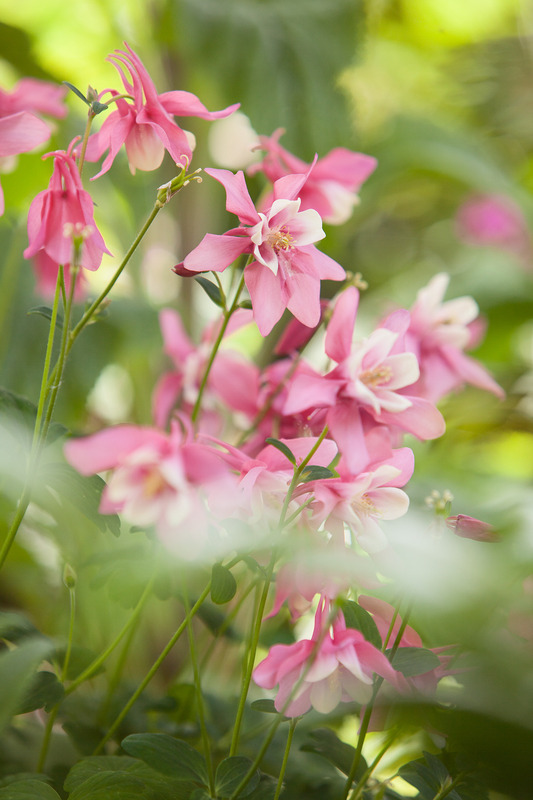 Location: RHS Flower Show Tatton Park. 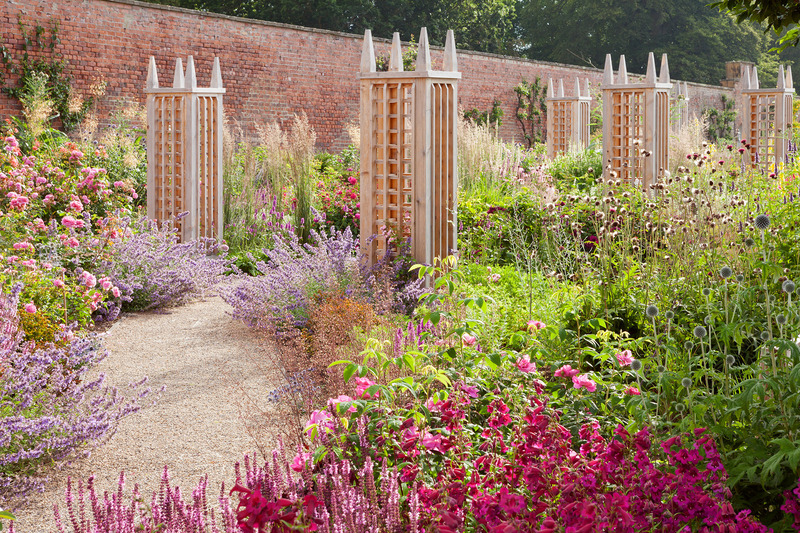 Morning light on the Pillar Garden at Wynyard Hall Gardens. Summer, July 2016. 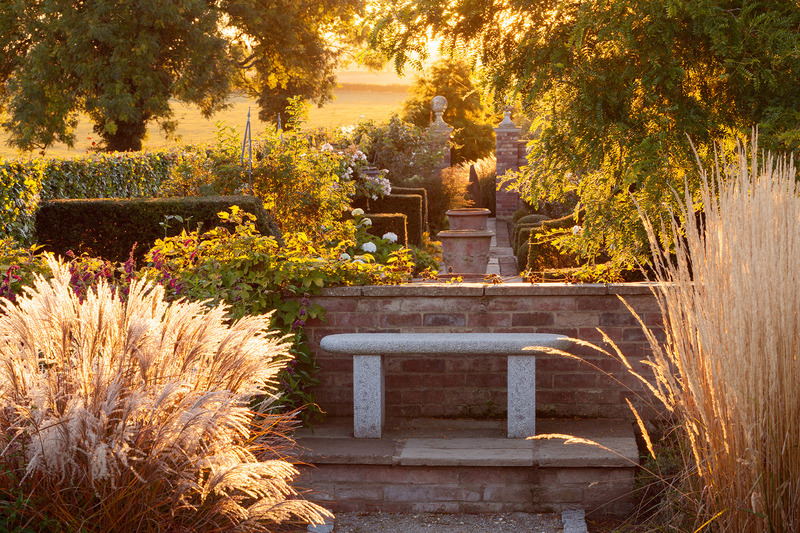 Evening light on the Stepped Plats at Wynyard Hall Gardens. Summer, July 2016. 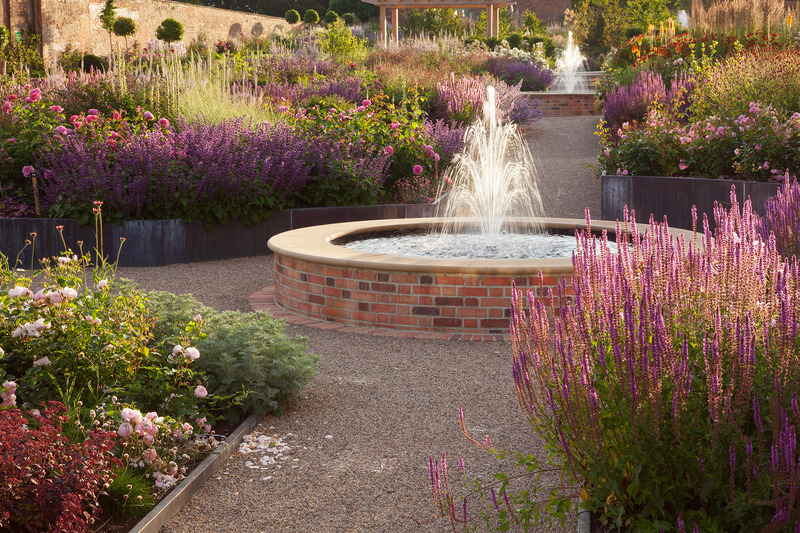 Evening in the Courtyard Garden at RHS Garden Hyde Hall. Summer, July 2016. ©RHS/Lee Beel. 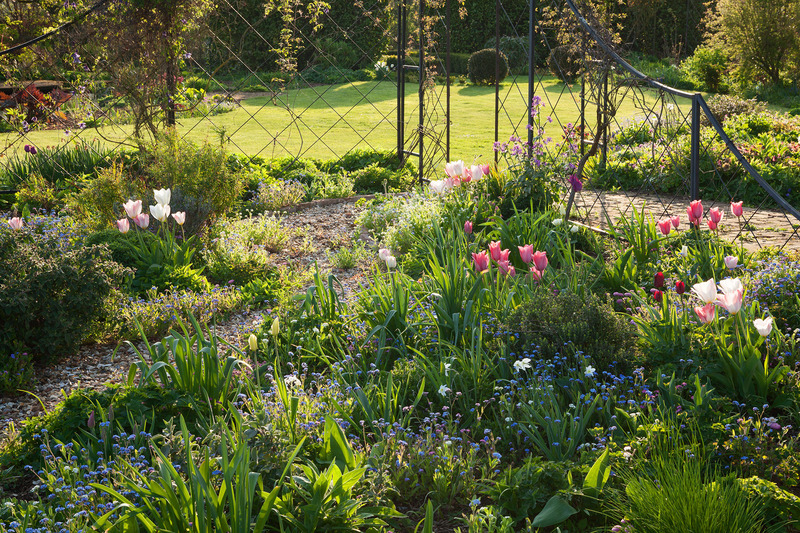 Evening in the wildflower garden in Spring. May 2016. Location: Ellerker, East Yorkshire, UK. 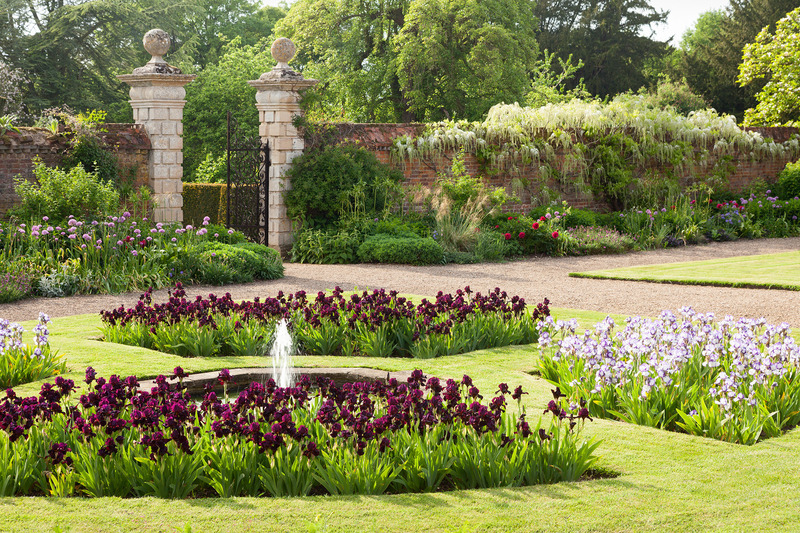 Irises in the West Garden ahead of the annual Iris Week at Doddington Hall and Gardens. 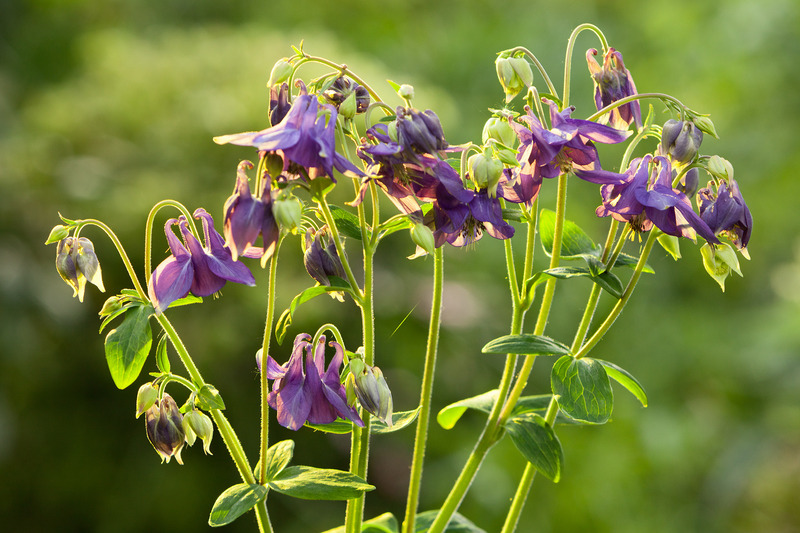 Backlit Aquilegia at Ellerker Manor in Spring. Bluebells in an English woodland in Spring, on an overcast morning in May. 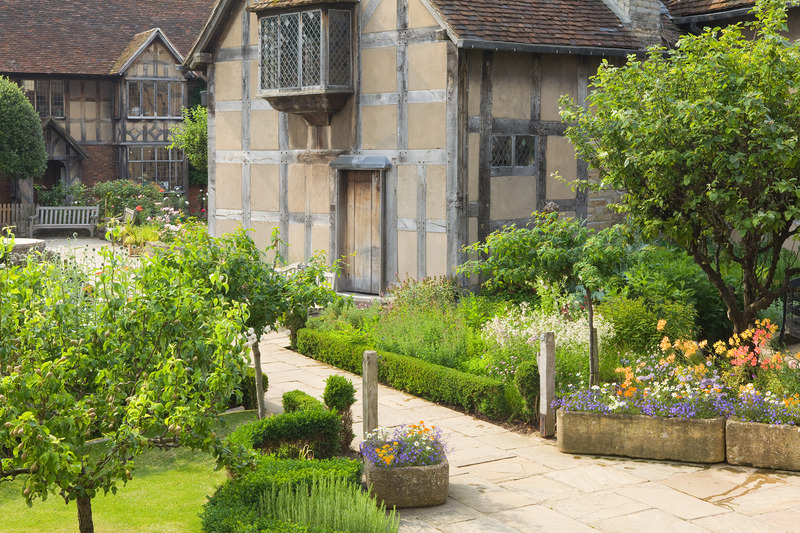 Shakespeare's Birthplace in Stratford-upon-Avon. Commissioned by Visit Britain. ©VisitBritain/Lee Beel. 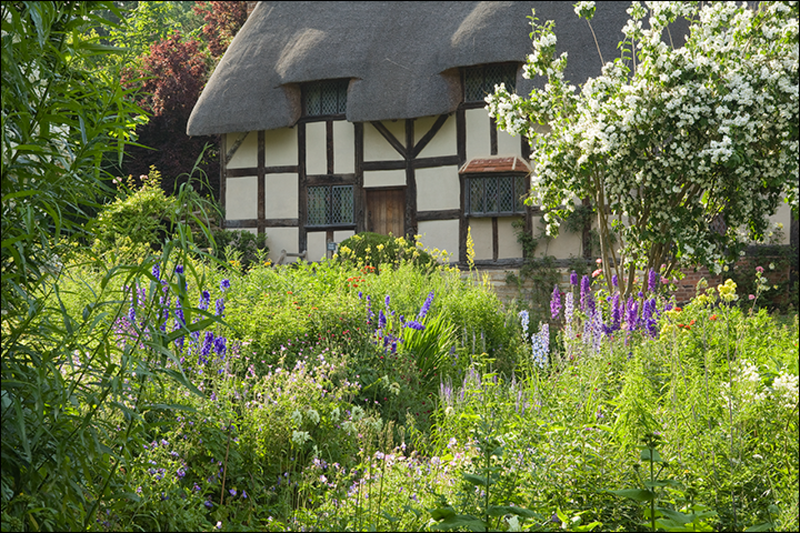 Anne Hathaway's Cottage is where Anne Hathaway, the wife of William Shakespeare, lived as a child in the village of Shottery. ©VisitBritain/Lee Beel. Location: Shottery, Warwickshire, England, about 1 mile west of Stratford-upon-Avon. 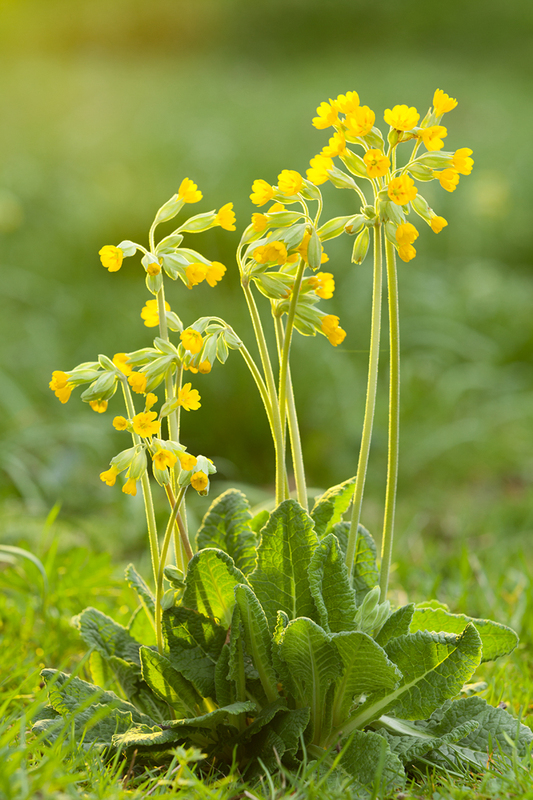 Portrait shot of Cowslips on a lovely spring day in April. 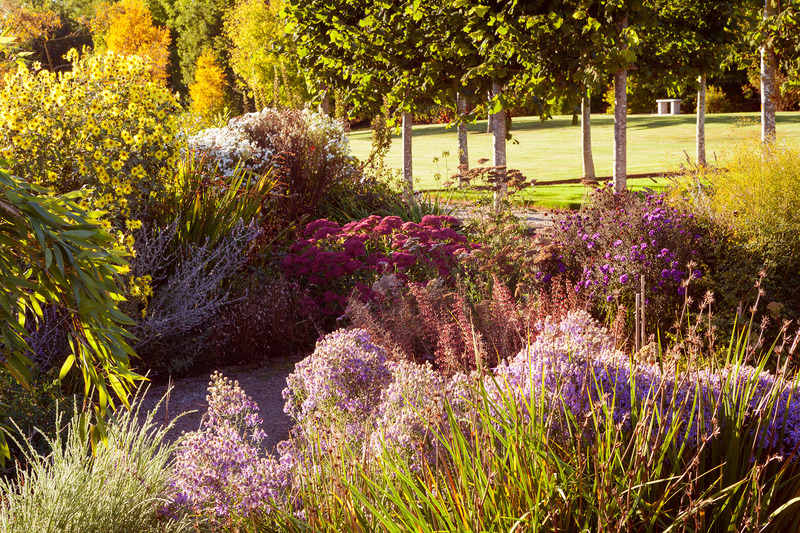 Location: Brightwater Gardens (RHS Partner Garden), Lincolnshire, UK. 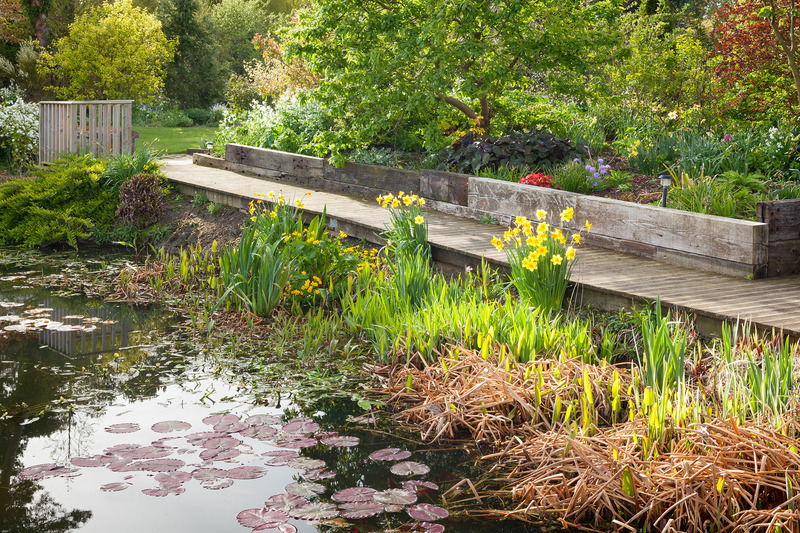 The Upper Pond on a calm spring morning in 2015. Footpath around the Lower Pond on a winter morning in 2015. © RHS/Lee Beel. 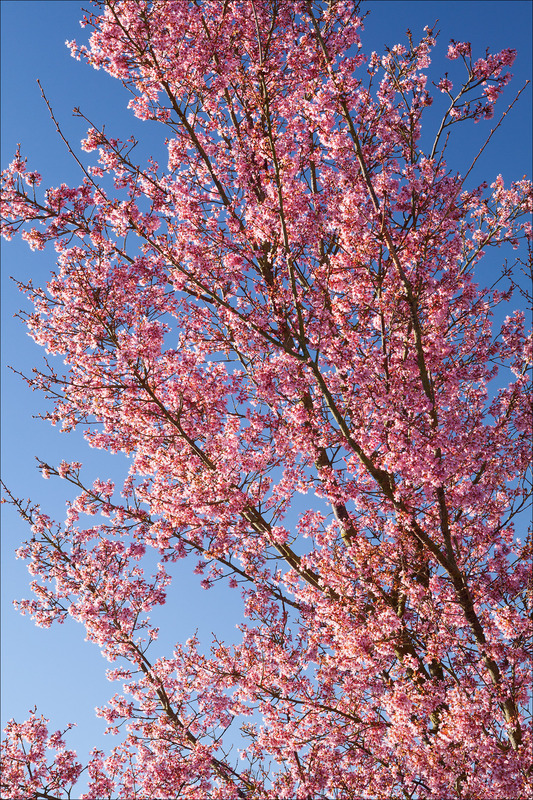 Blossom against a blue sky at the end of February. 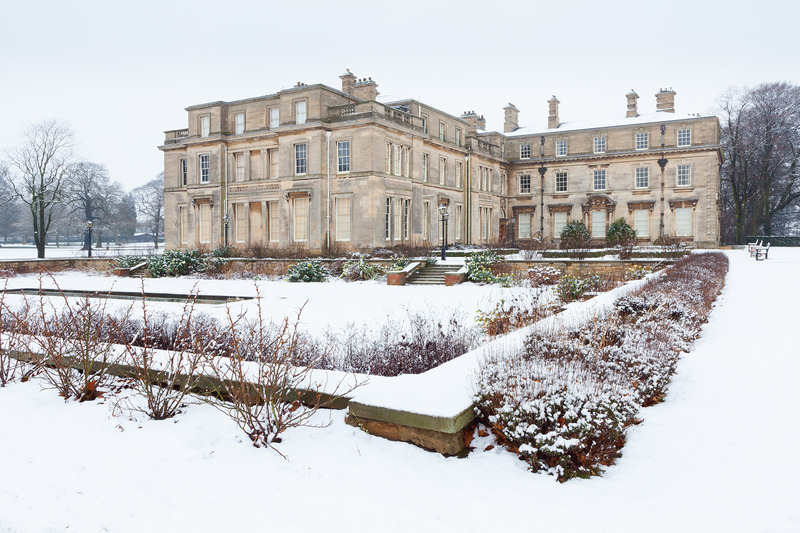 Normanby Hall Gardens and Country Park under a fresh blanket of snow. March 2016. Location: Normanby, North Lincolnshire, UK. 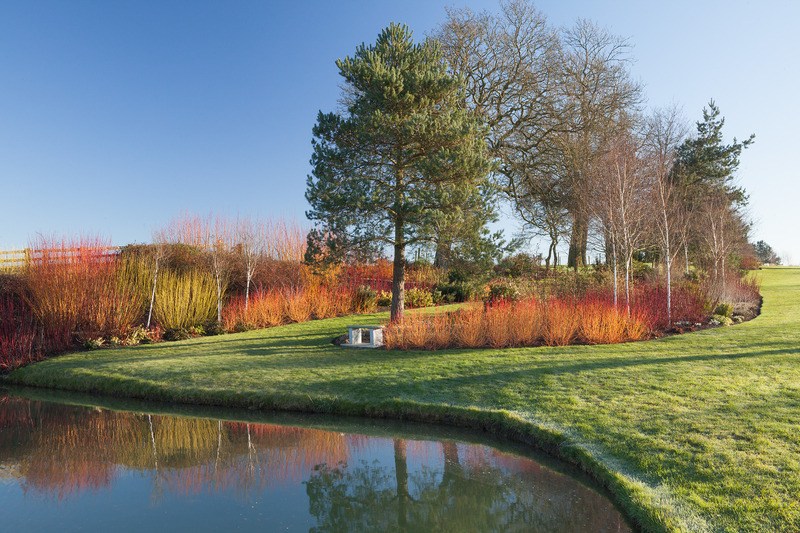 The pond at Brightwater Gardens on a winter morning in February 2016. 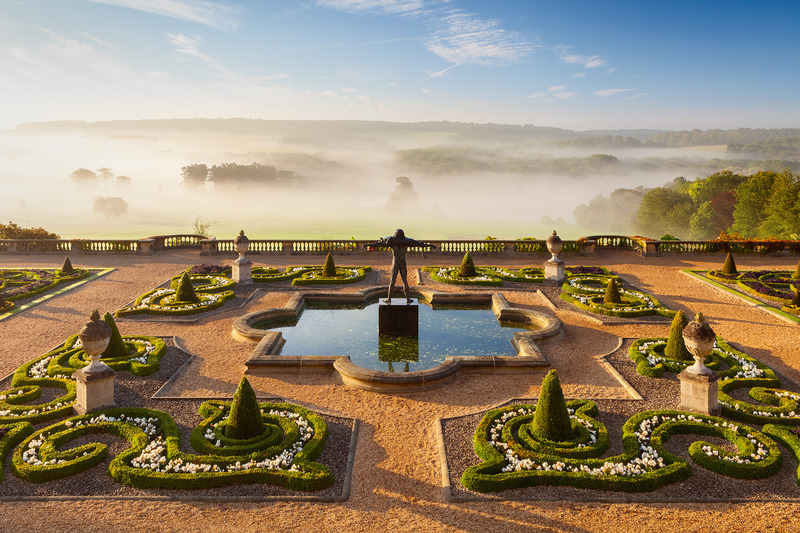 This shot was awarded 2nd place in the 'Capability Brown Today' category of the 'International Garden Photographer of the Year Competition 9'. 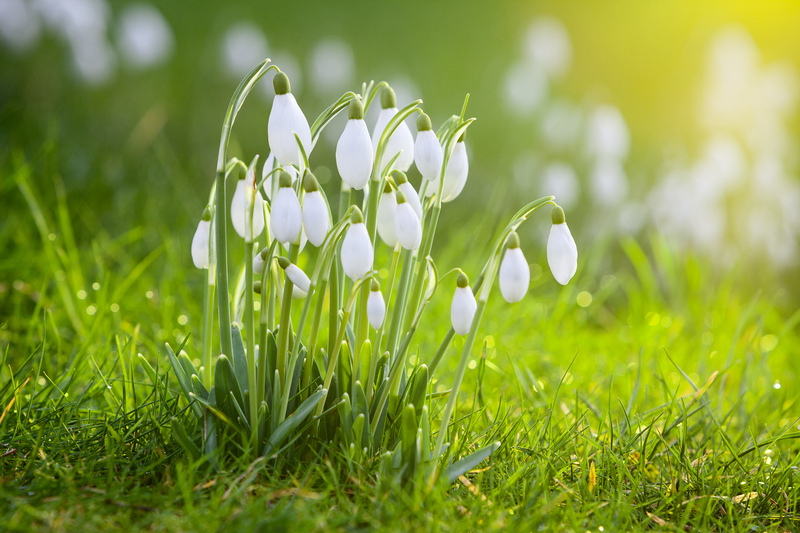 Snowdrops in woodland on a winter morning in February 2016. 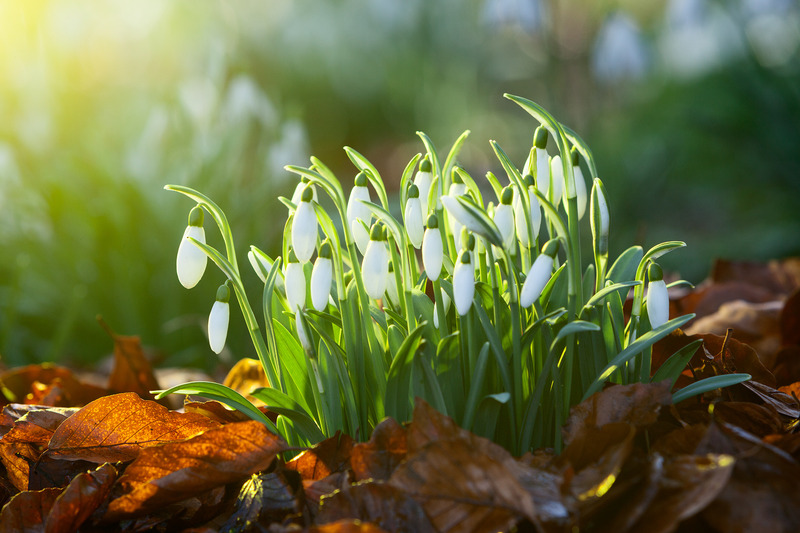 Snowdrops in a bed of fallen leaves in February. 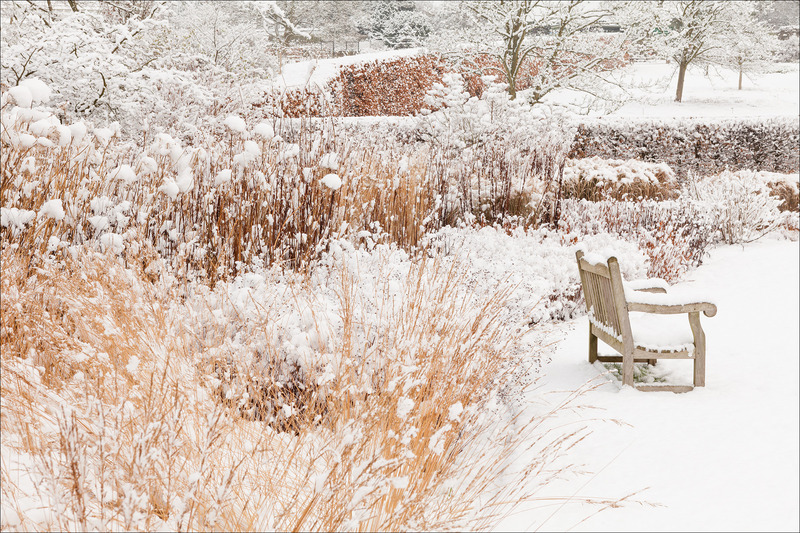 This shot was awarded 3rd place in the 'Beautiful Gardens' category of the 'International Garden Photographer of the Year Competition 9'. The Winter Walk after snowfall and before the garden opened to the public. Commissioned by the RHS. January 2016. © RHS/Lee Beel. 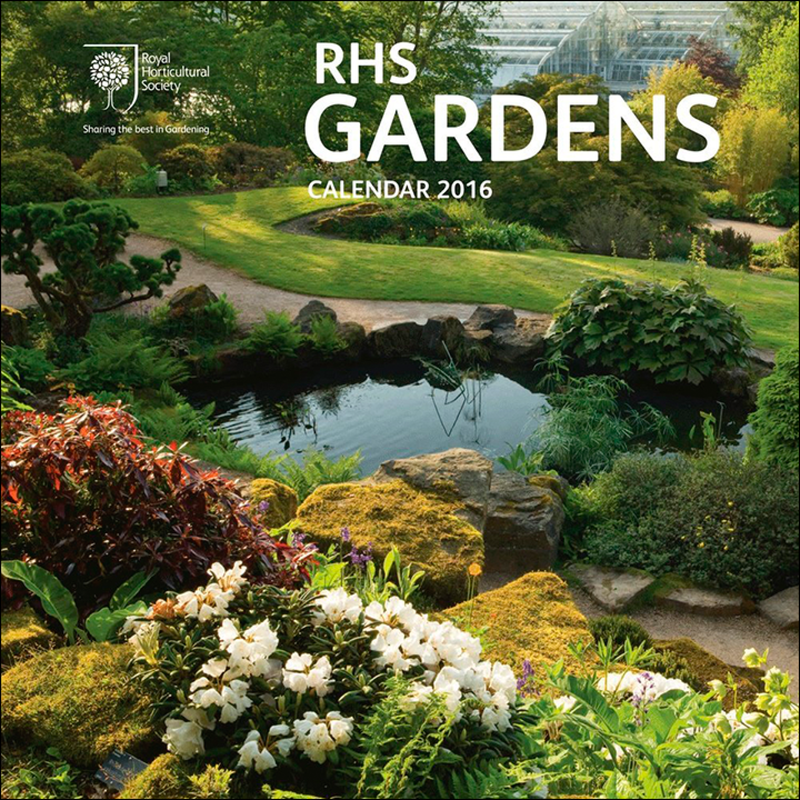 I've been lucky to work with the RHS quite a lot recently and have shot Harlow Carr, Wisley and Hyde Hall for them in different seasons. 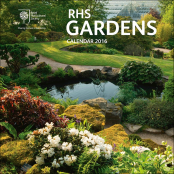 Their 2016 calendar features some of my work, including this shot of the Rock Garden at Wisley on the cover. 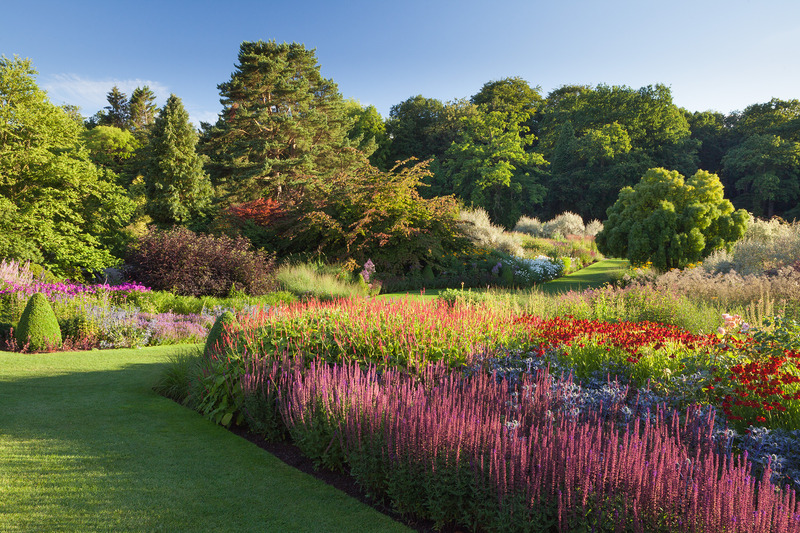 Location: RHS Garden Wisley, Surrey, UK. 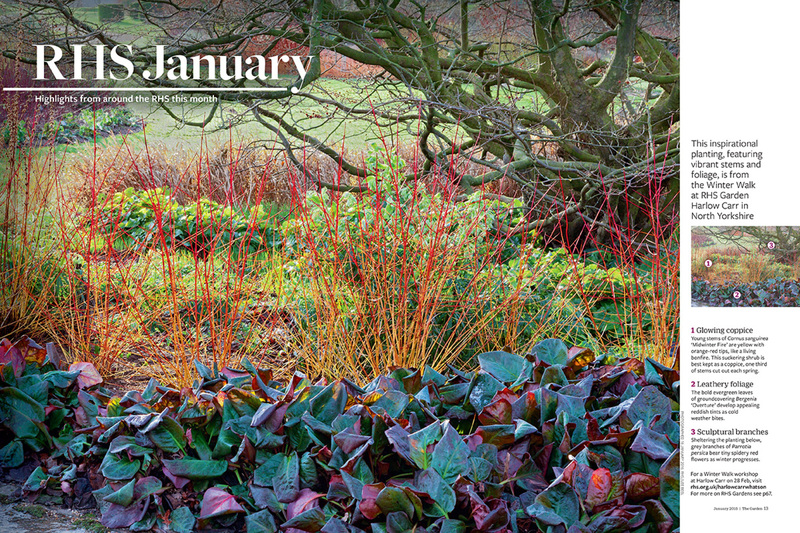 A garden feature I photographed published in Garden News magazine's January 9th 2016 issue. 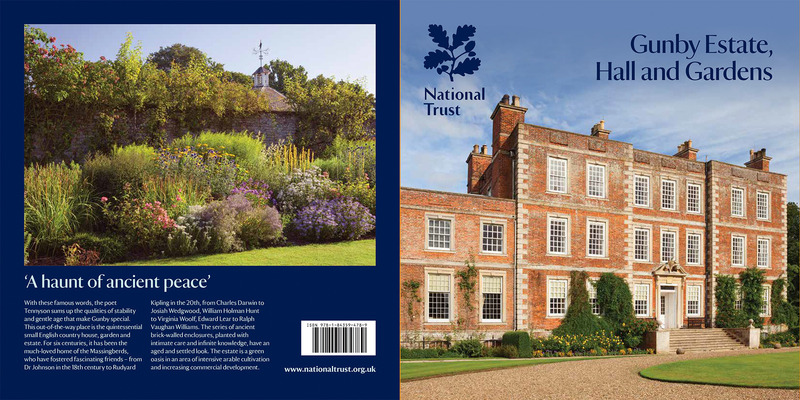 Earlier in 2015 I was commissioned by the National Trust to supply some new shots of the hall and gardens at Gunby. 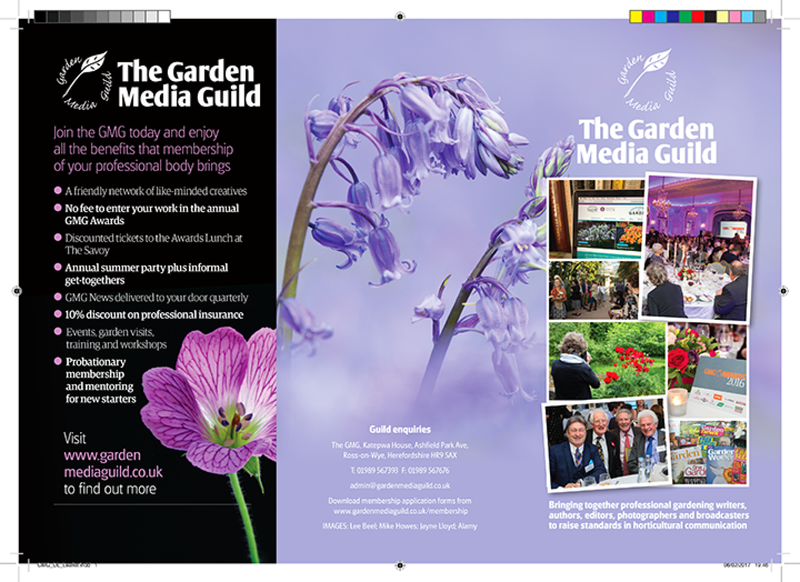 These are two of the shots, used on the front and back of the new guidebook. 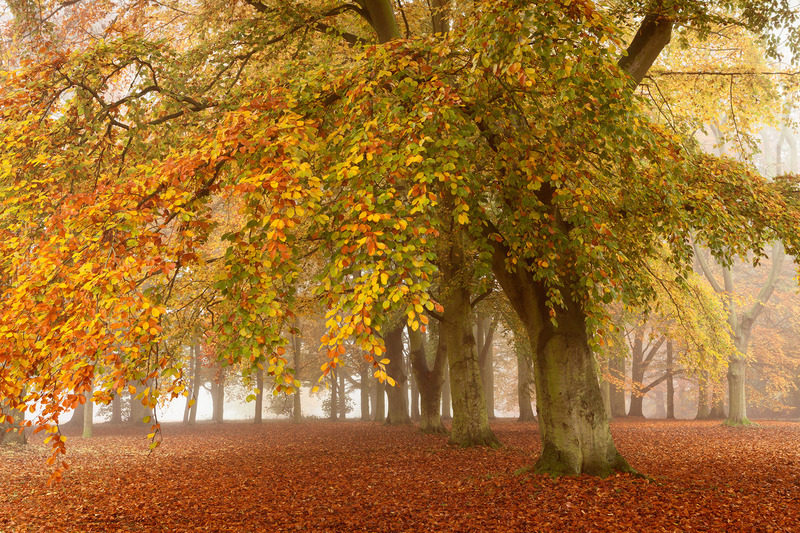 Beech trees on a lovely misty Autumn morning in my local park. 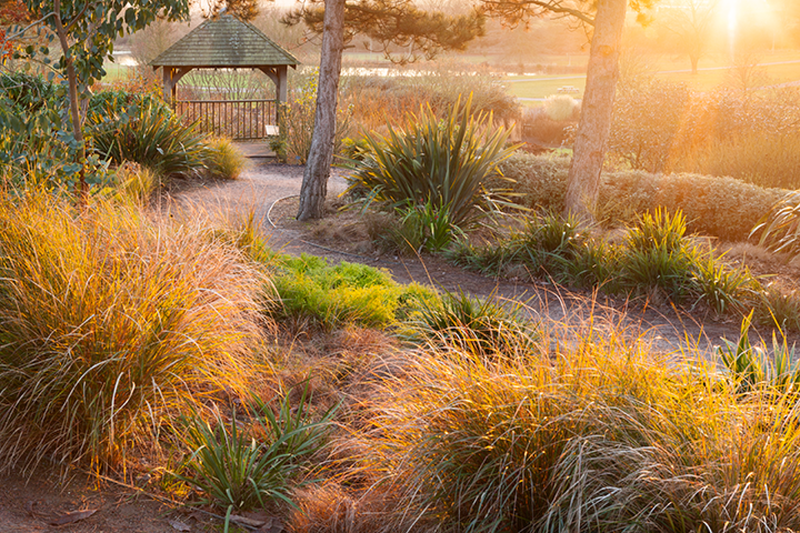 A lovely October evening in the Prairie Garden in Brightwater Gardens. 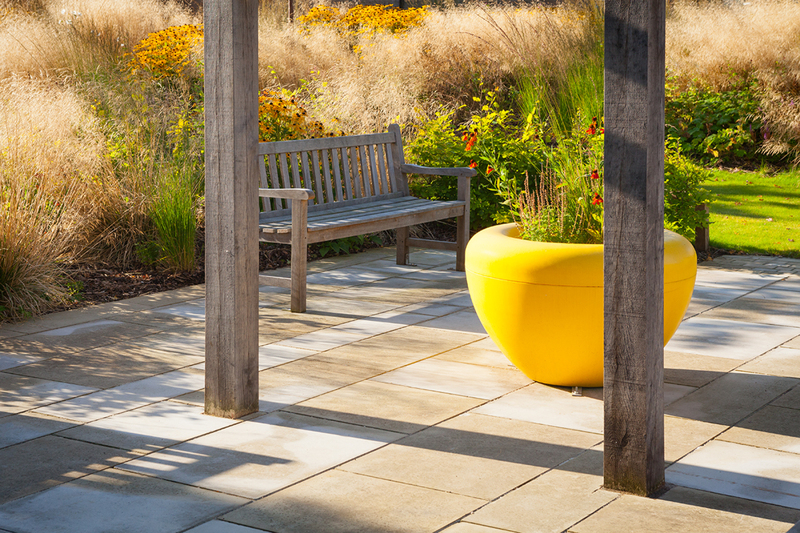 The Terrace at Brightwater Gardens, photographed late in the day towards the sun. October 2015. 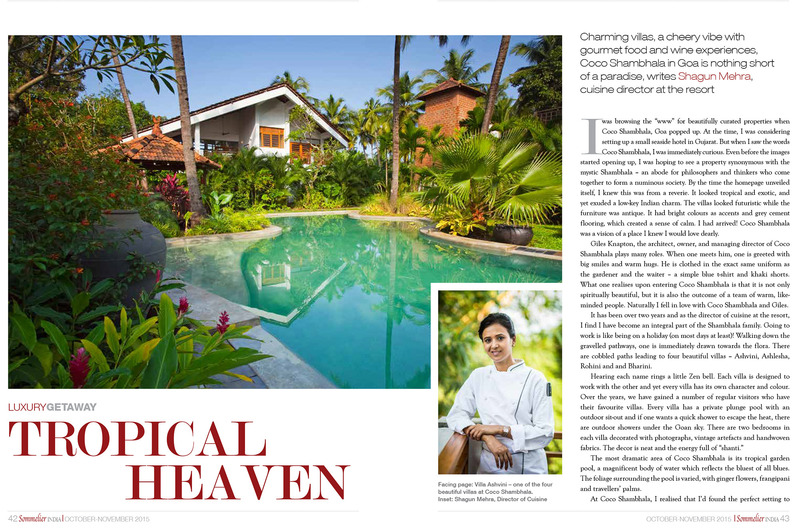 A photograph I shot of Villa Ashvini, featured in Sommelier magazine published in India. I was commissioned to photograph the villas at Coco Shambhala in Goa over the course of a week. 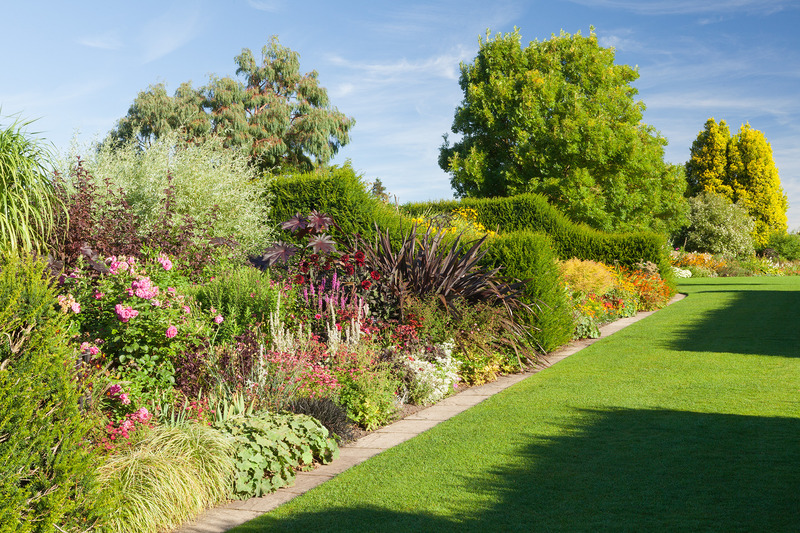 Location: Hall Farm Gardens, Harpswell, Lincolnshire, UK. 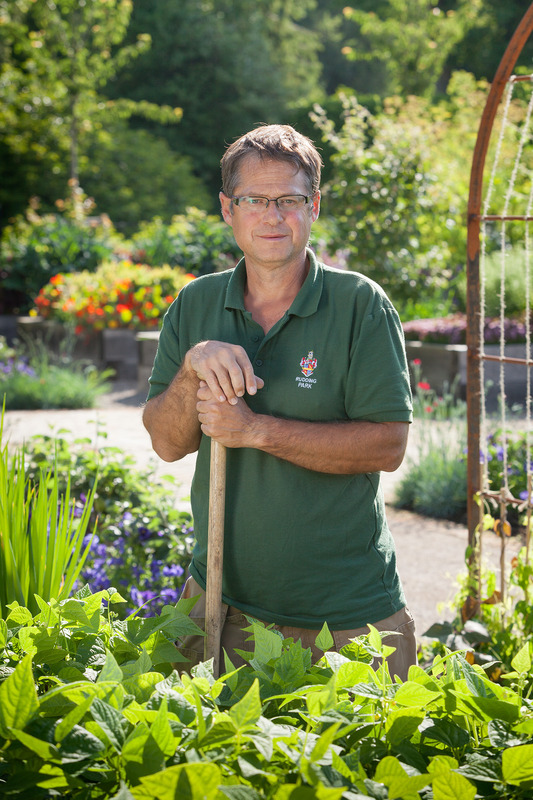 Adrian Reeve, Head of the Kitchen Garden at Rudding Park. Private commission. Location: Rudding Park, North Yorkshire, UK. 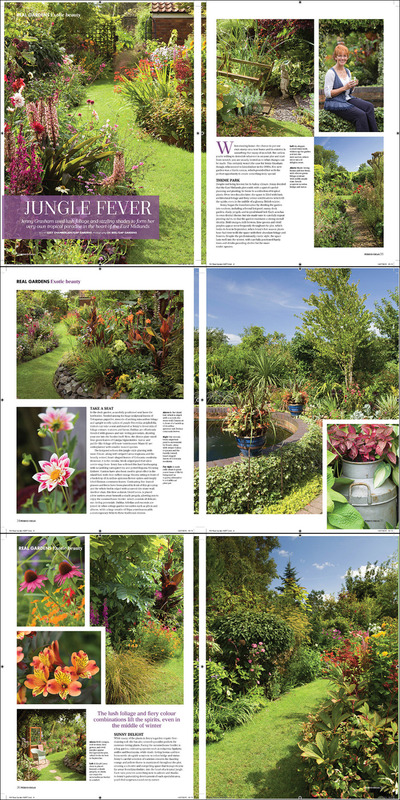 My shots of 68 Watts Lane (The Secret Garden of Louth) in Period Ideas Magazine, September 2015. 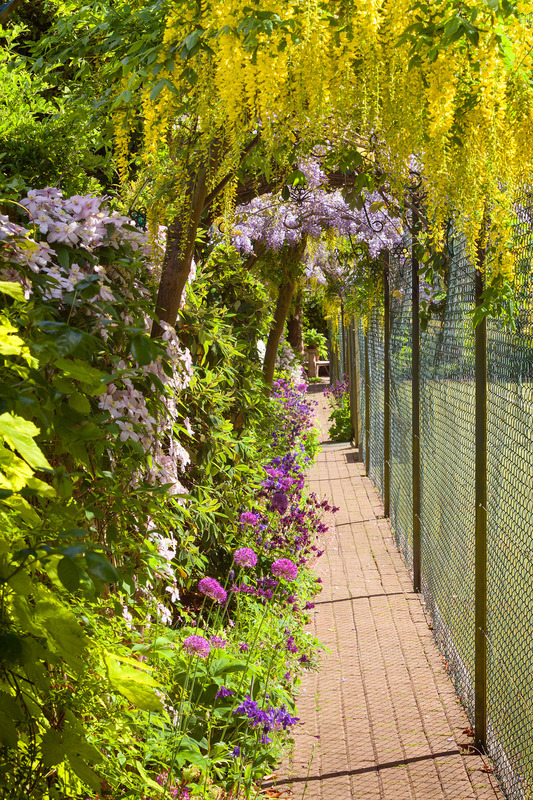 Laburnum and Wisteria at the side of a tennis court in a private garden. Location: North Ferriby, Yorkshire, UK. 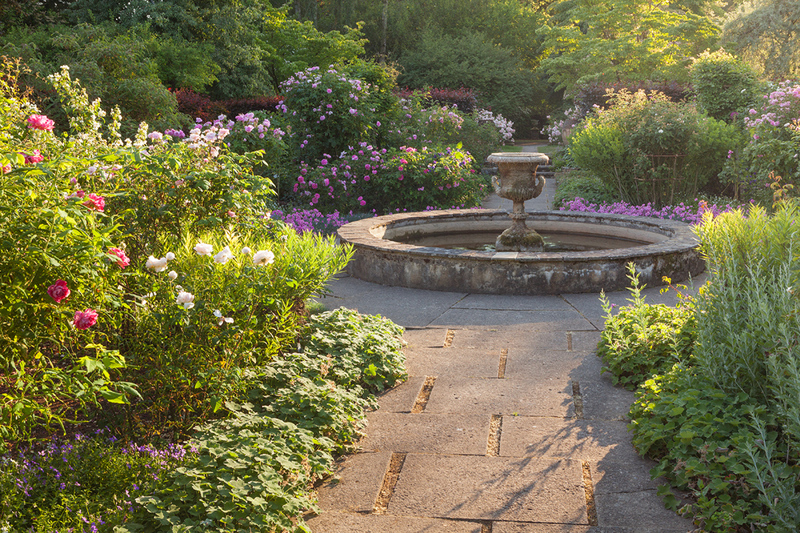 Morning in the Sunken Garden at Beacon Garth. 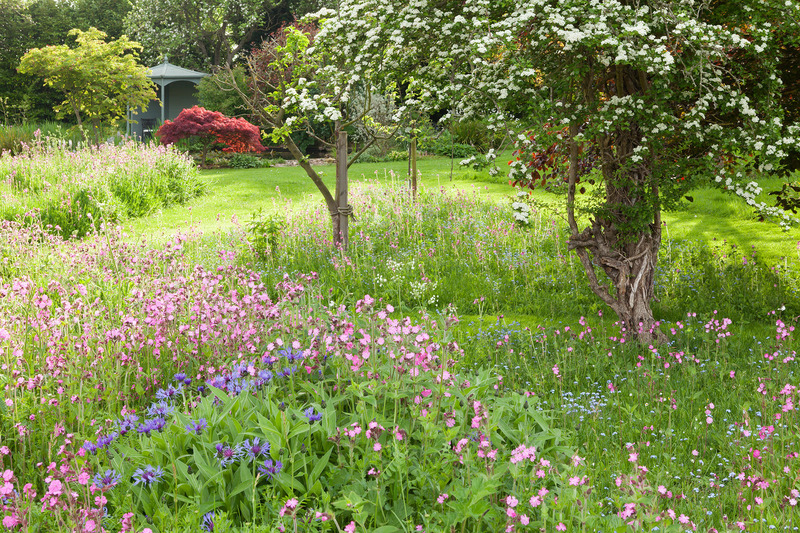 Spring flowers in a sunken garden. May 2015. Evening light in the park. A woodland path in a local park photographed in spring. A spring morning in May 2015. 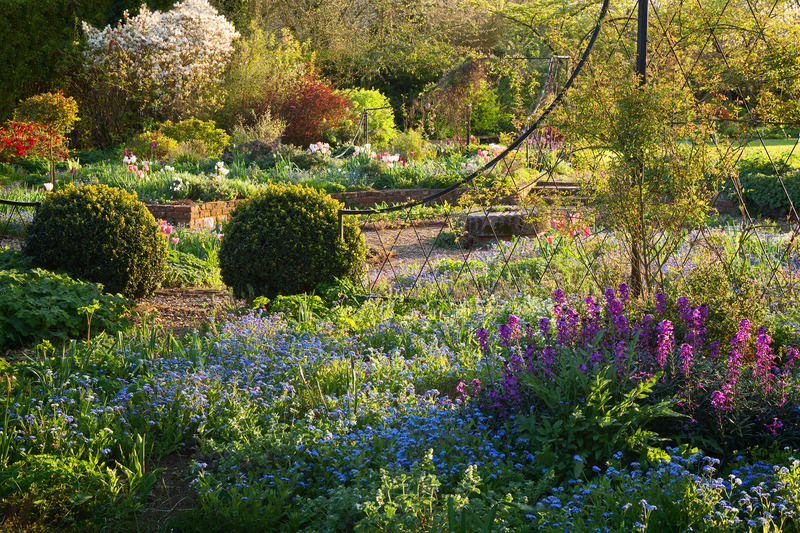 A view of the Sunken Garden in Spring on a lovely April evening. Location: Hall Farm Garden, Lincolnshire. 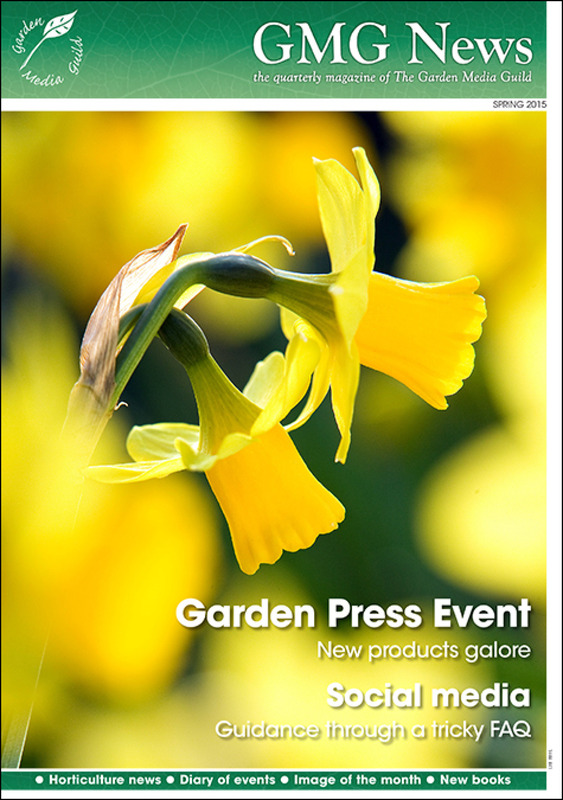 A photograph I took of Daffodils features on the cover of the latest GMG News magazine. Crocus flowers in the churchyard at St. Lawrence's Church in Scunthorpe. 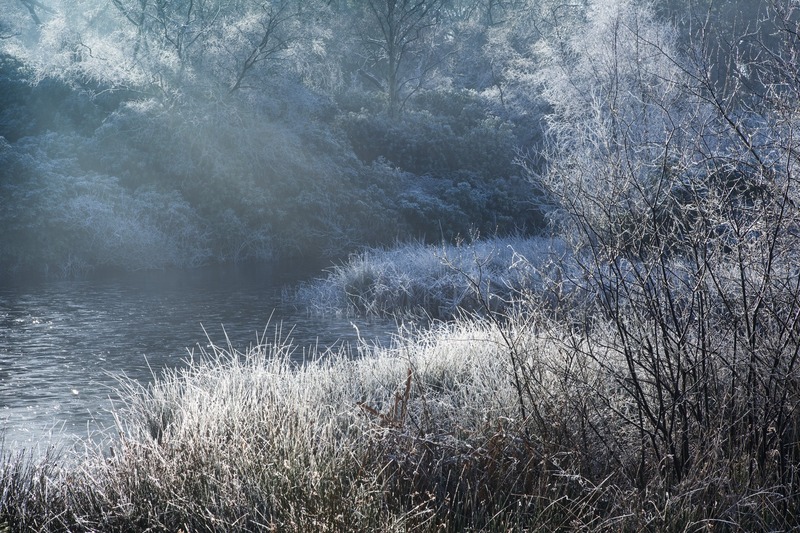 Winter morning light in Twigmoor Wood. Location: North Lincolnshire, England, UK. A lovely foggy morning in Baysgarth Park, November 2014. 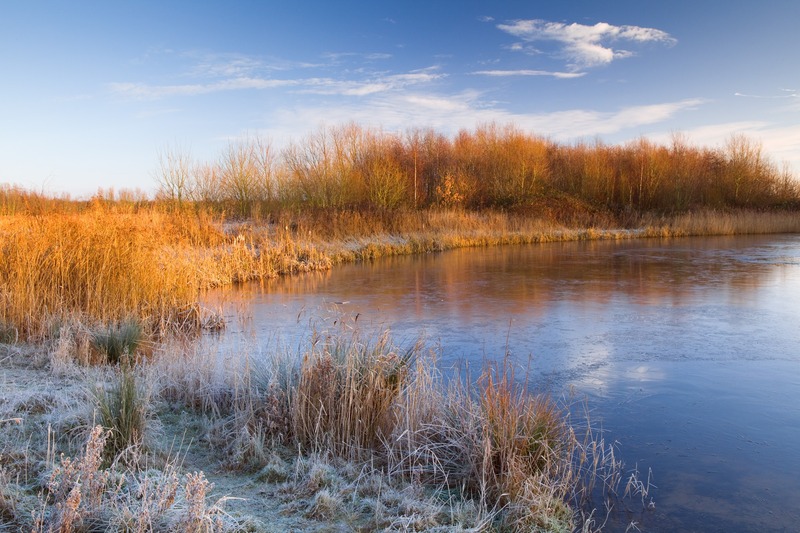 The Waters' Edge Country Park on a cold winter morning in December 2014. 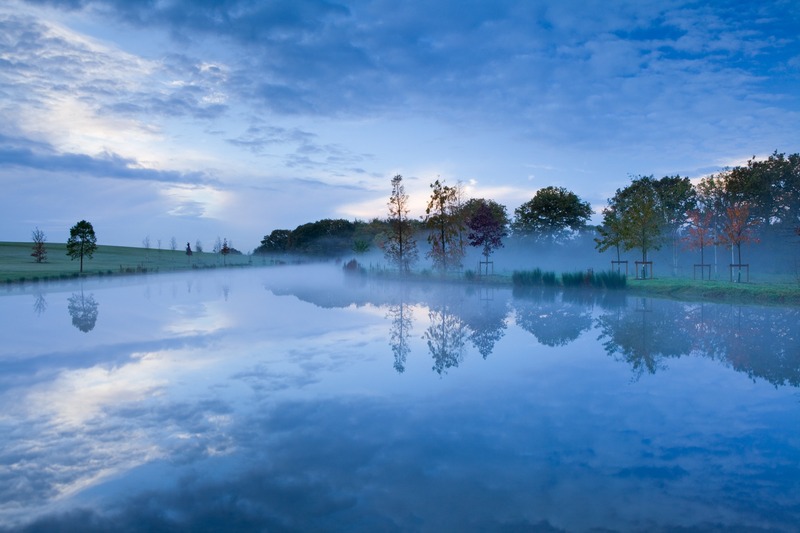 The Lake at RHS Hyde Hall on a misty Autumn morning before sunrise. © RHS/Lee Beel. 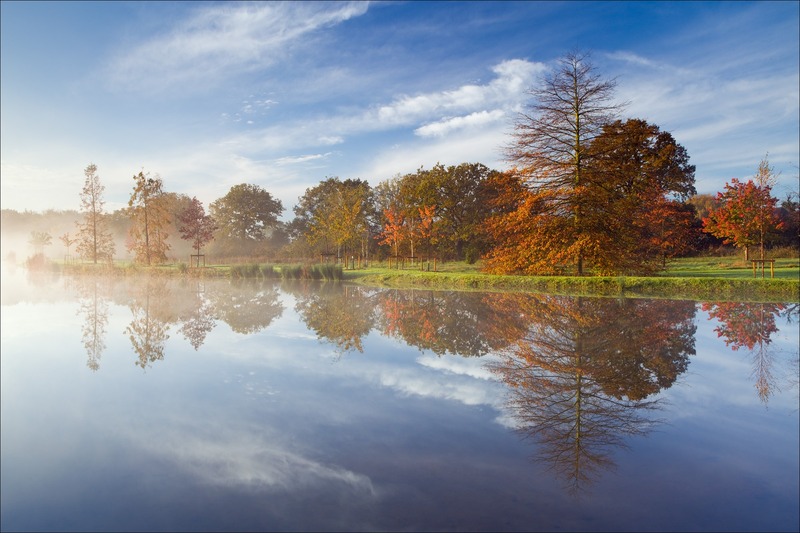 The lake at RHS Garden Hyde Hall on a misty morning in November 2014. © RHS/Lee Beel. Location: RHS Hyde Hall, Essex. 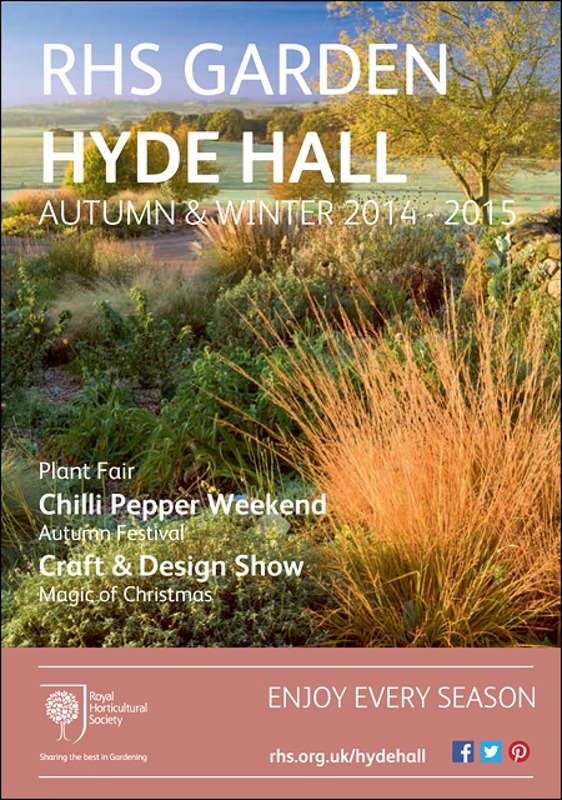 The Hyde Hall Autumn and Winter leaflet cover, featuring a photo I shot of the Dry Garden. Vegetable Garden gate, from the Pond Border. September, Autumn 2014. 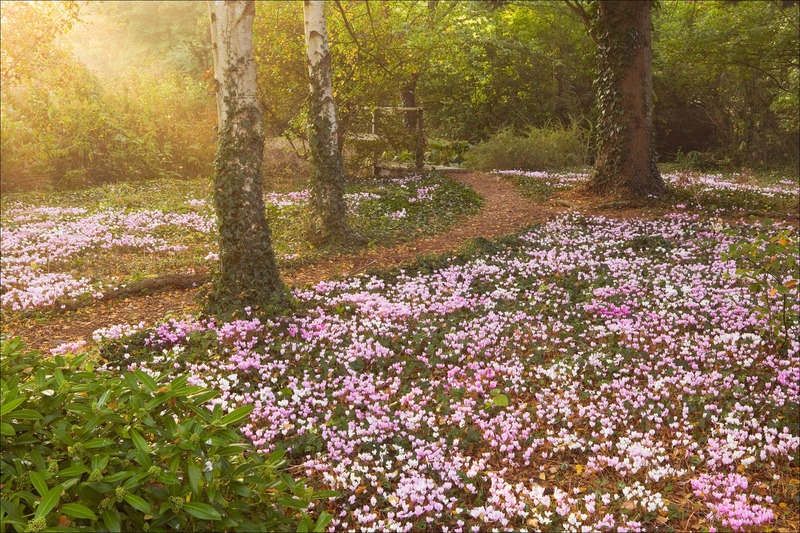 Cyclamen hederifolium. September, Autumn 2014. 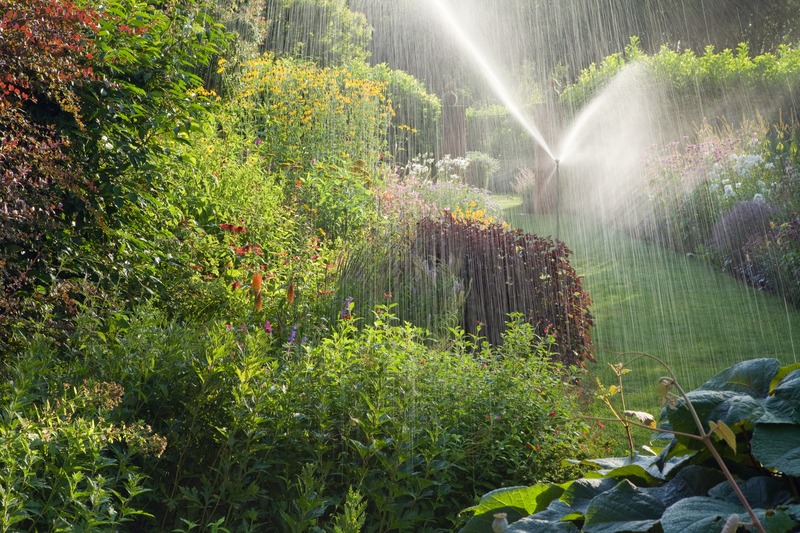 Sprinkler on the double herbaceous borders. August 2014. 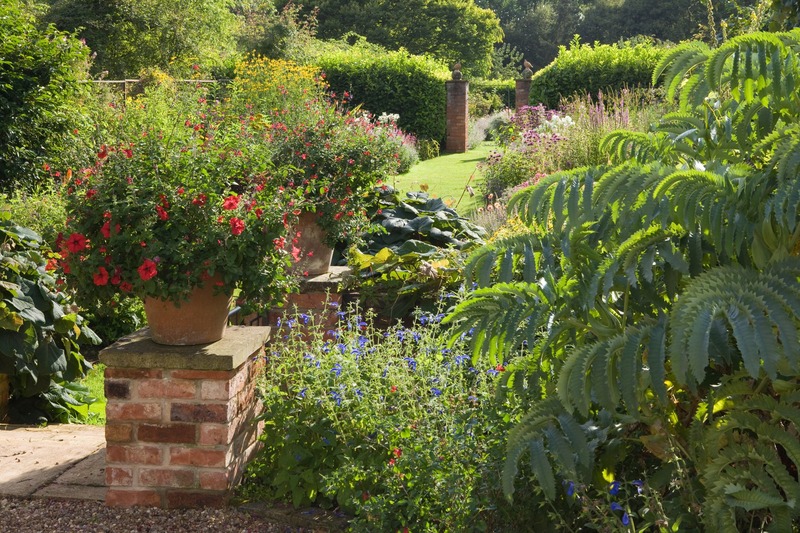 Pot with mixed red annuals at top of steps with Melianthus Major plant on the right. August 2014. Location: . Hall Farm Garden, Lincolnshire. An arbour with climbing roses and honeysuckle. 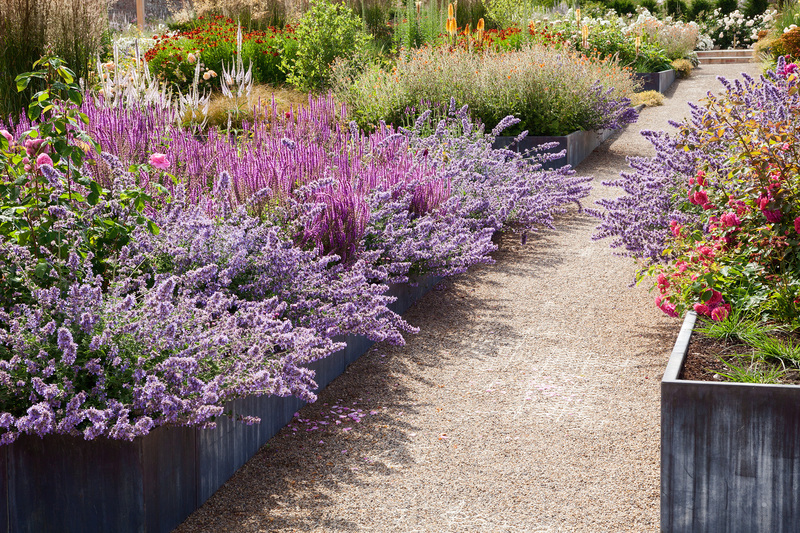 The path is edged with Nepeta 'Six Hills Giant'. June 2014. Location: Manor Farm, North Lincolnshire. 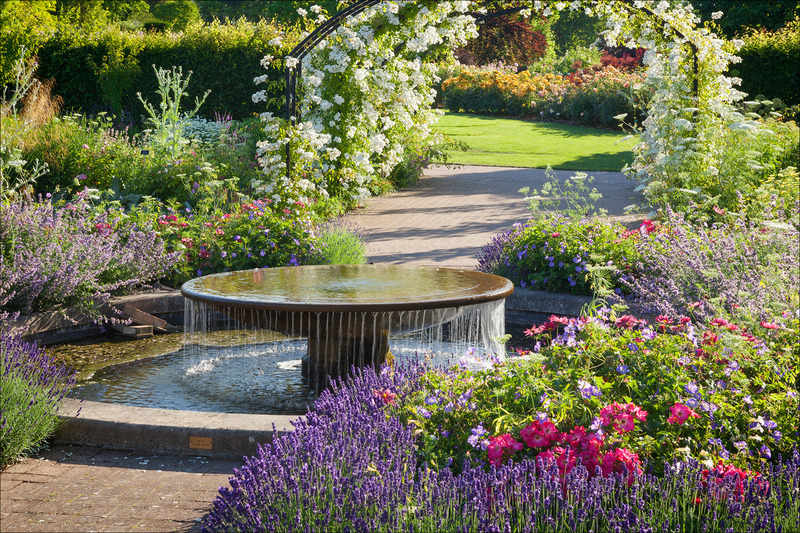 The Sundial Garden. Mixed herbaceous perennials, annuals and dahlias. July 2014. 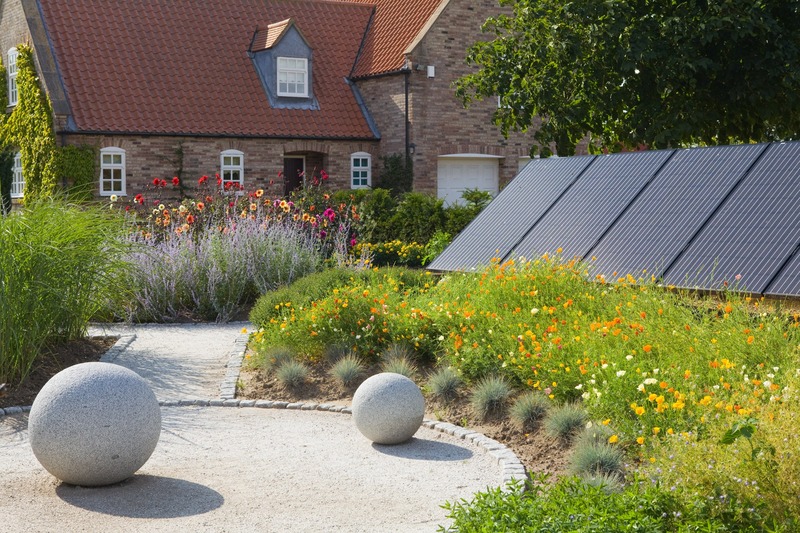 A solar panel installation. August 2014. 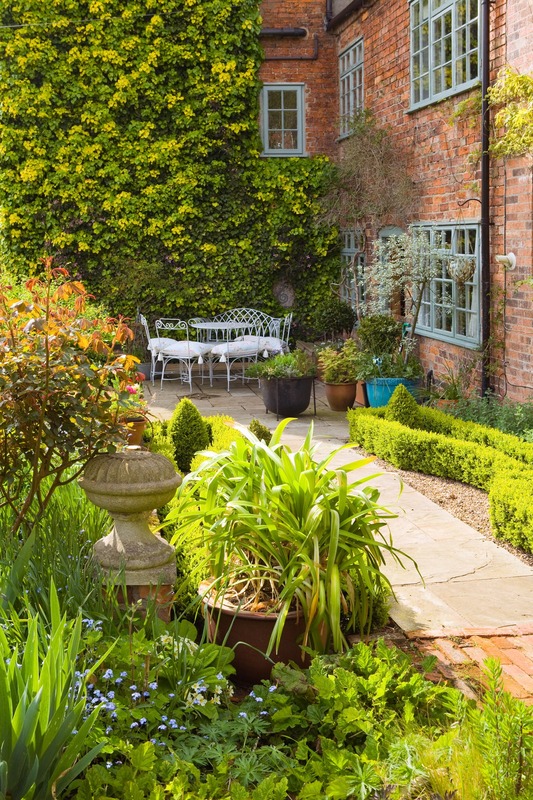 Location: The Garden House, Saxby. Lincolnshire. 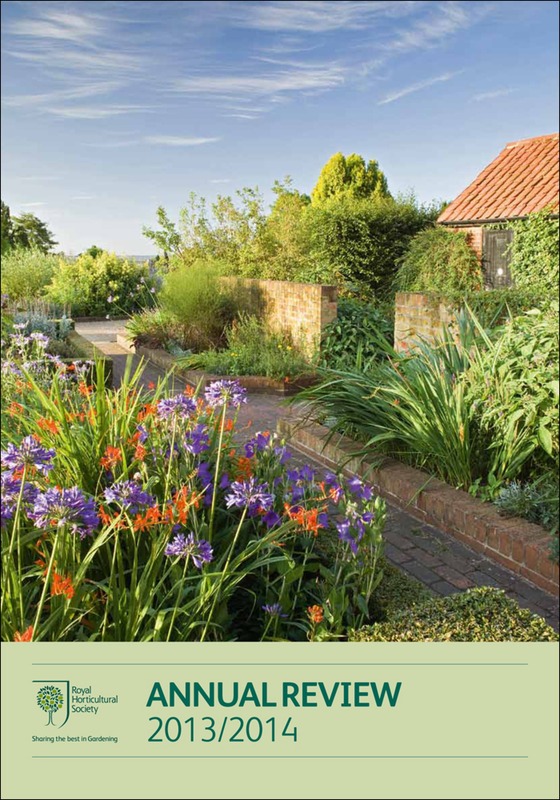 Cover of the RHS Annual Review 2013/2014 with a photograph I took of Hyde Hall on the cover. 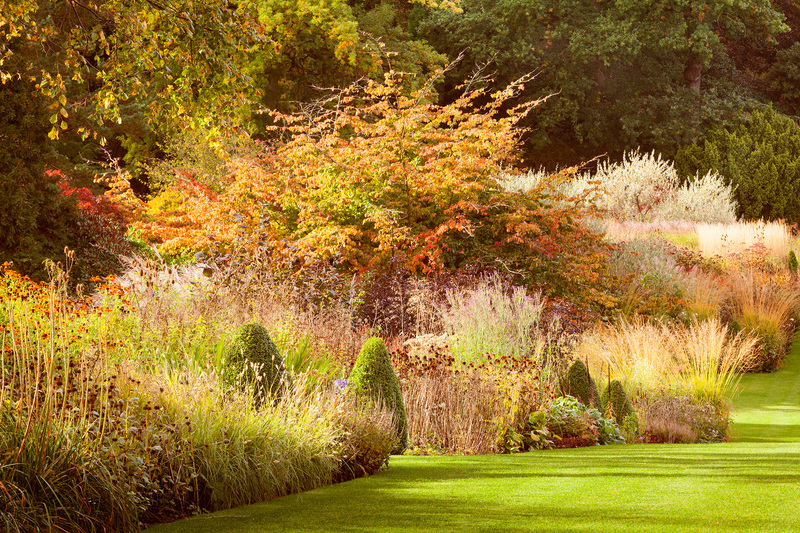 Location: RHS Garden Hyde Hall, Essex. 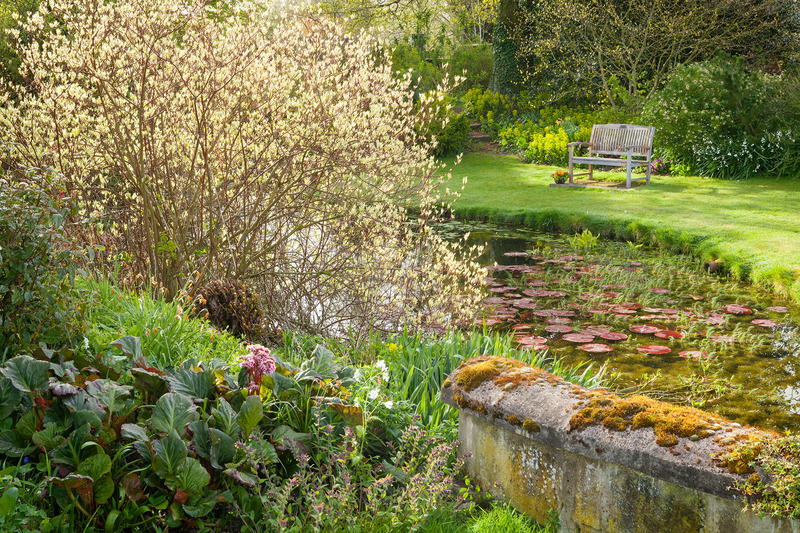 Profusion of plants around the pond. April 2014. 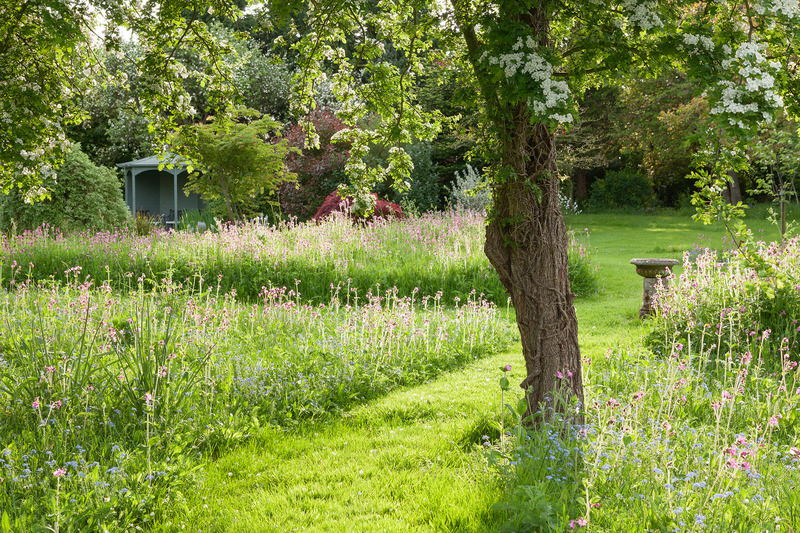 Location: Hope House Garden, Caistor, Lincolnshire, UK. 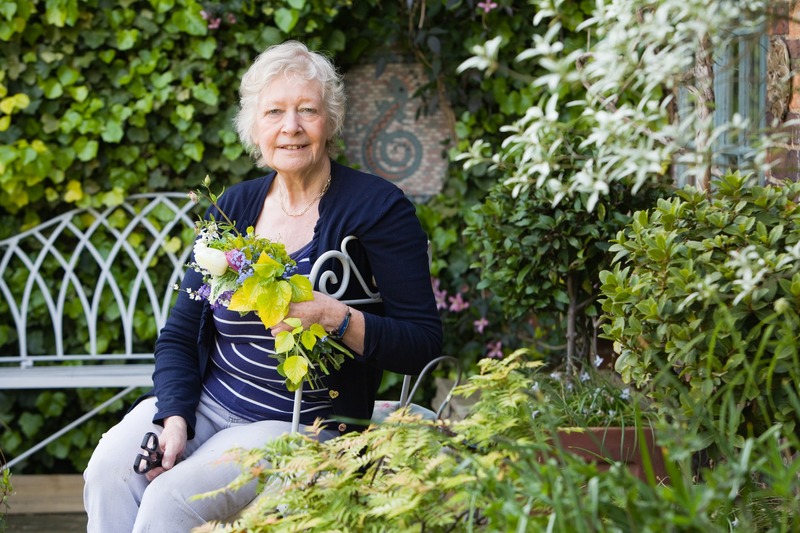 Garden designer Sue Neave, at home. April 2014. I shot this in a back-garden using potted plants so that I could place them where I wanted to produce the blurred foreground and background. UK, March 2014. 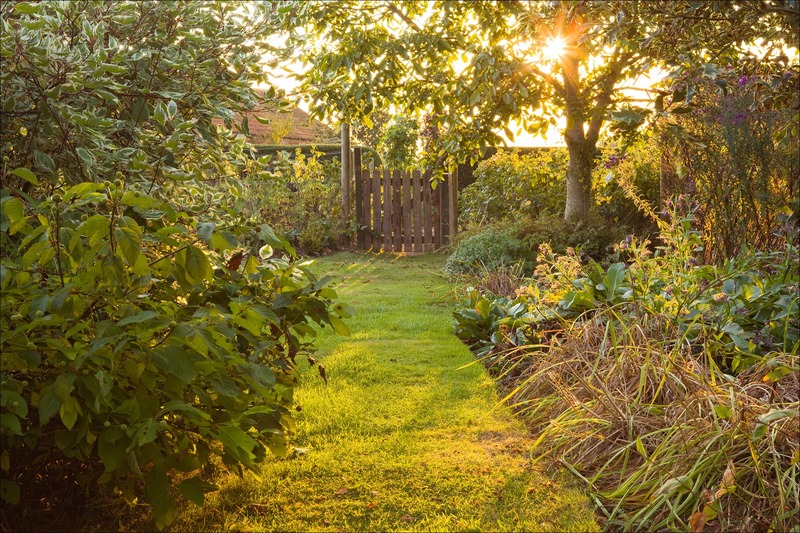 Location: Garden in North Lincolnshire. 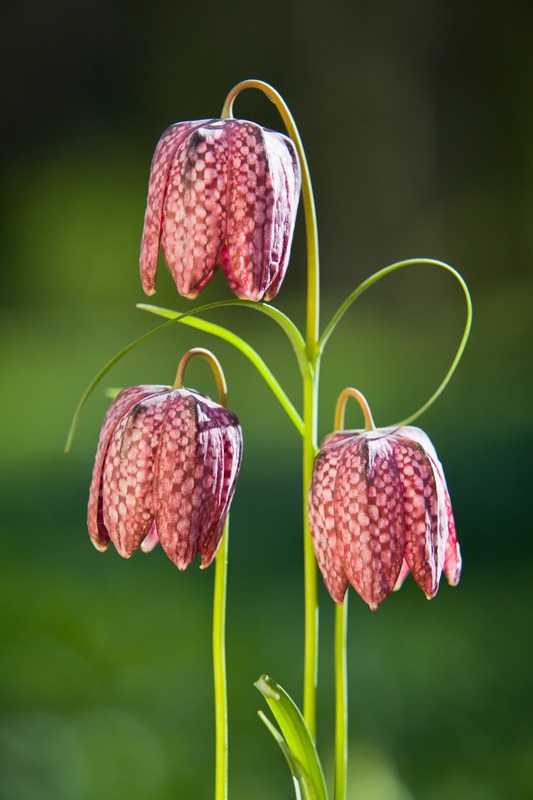 Snake's Head Fritillaries (Fritillaria meleagris) in a local country park. I used a reflector and off-camera flash to light these plants. April 2014. A sunny corner outside the kitchen door. April 2014. 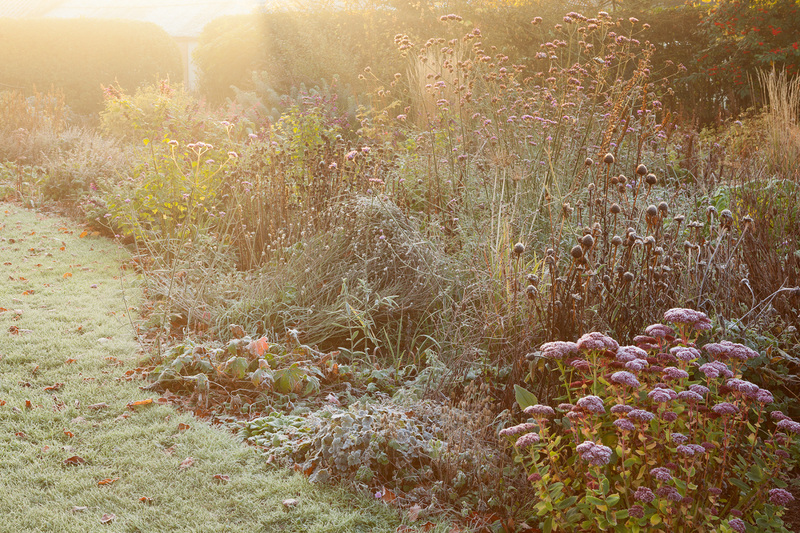 This shot was taken early in the morning, just as the sun burnt through the mist in the garden. The morning was calm without a breath of wind, so the plants were nice and still. 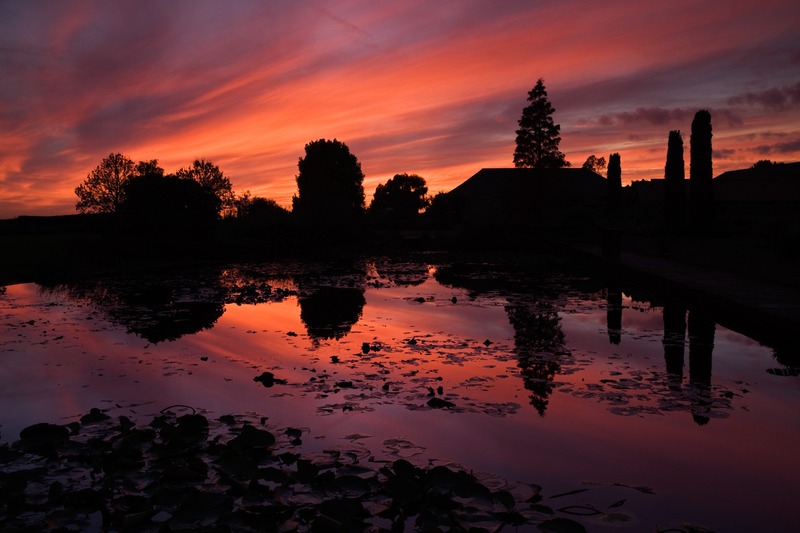 Sunset over The Upper Pond.